Everyone loves a come-from-behind victory. The greatest victory of all time is when Jesus defied the Romans and rose from the dead on the third day. In doing so, He conquered sin and death. He now lives His resurrected life in all of us, who believe in Him. This Holy week reminds us of these historical facts, which are the foundation of our faith. We can also see God’s resurrection power at work in our school ministry. 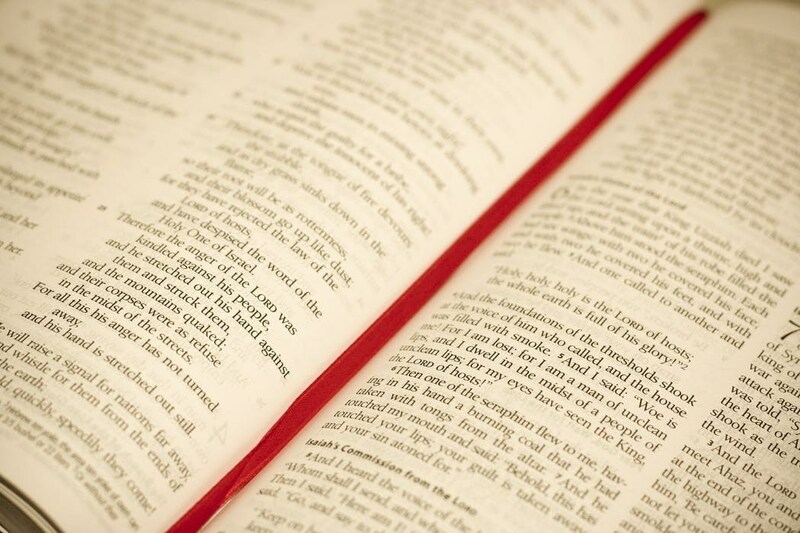 Many young people have come to a saving knowledge of Jesus as their Lord and Savior, and many others have grown and strengthened in their faith as a result of spiritual formation process. I also see the Lord providing our school a great come-from-behind victory. He provided the funds to continue the school when it seemed impossible to do so, and He provided a new campus when we had to leave this one. These are no small miracles folks. Countless people prayed and had faith in the Lord to work these miracles for us, and the Lord answered. Our very own Shawn Thomas led an amazing Easter Chapel on Tuesday that spoke to all of our hearts about the miracle of Easter. 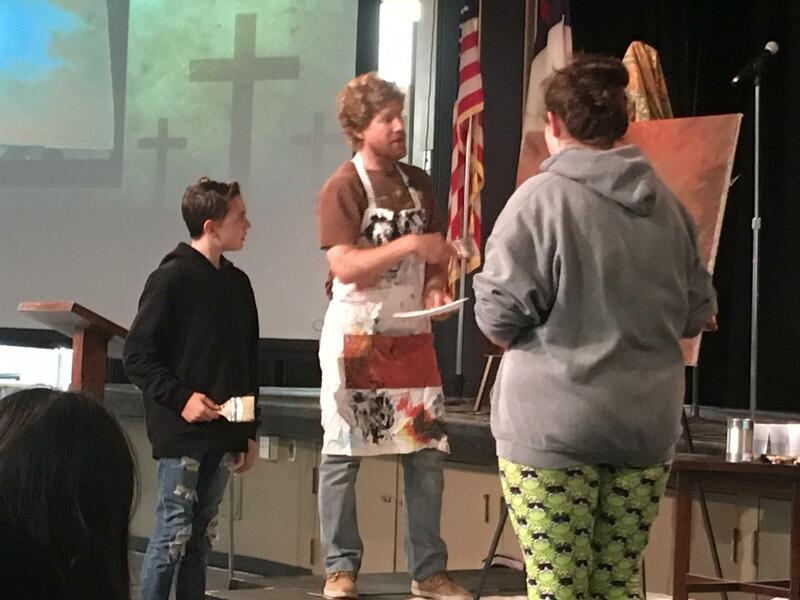 He used painting as a medium to illustrate his message in a way that involved the entire school. 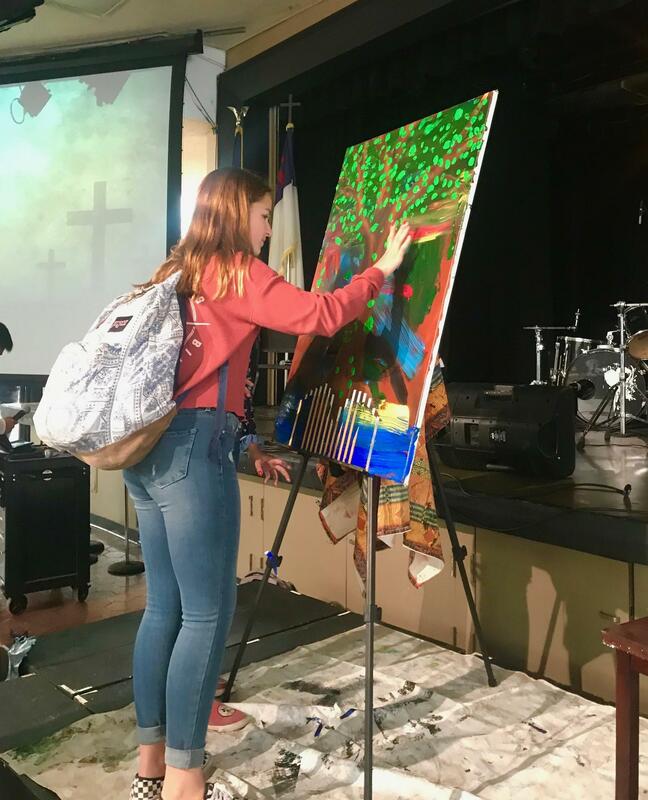 It culminated with each student and teacher adding a green leaf to the branches of a tree representing Jesus as the True Vine. In addition to representing our total dependence upon the Lord, represented the deep roots of this ministry, while providing a vision of our future that will continue to bear much fruit. I want to thank Shawn for being used of the Lord to bring us such a powerful message. 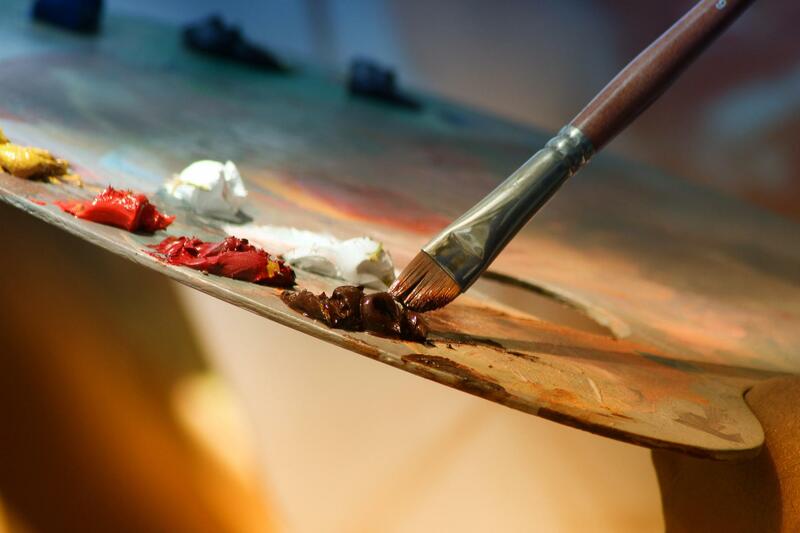 The painting shown above is on display in our front office, and it will be prominently displayed on our new campus. Let us thank God for the overarching miracle of redemptive grace through the death and resurrection of Jesus Christ for the sins of the world during this Easter season. Let us also thank God for the individual and collective works of grace in the lives of our students and for the resurrection of Brethren Christian as a vibrant ministry long into the future. Wishing you all a safe and blessed Easter vacation. 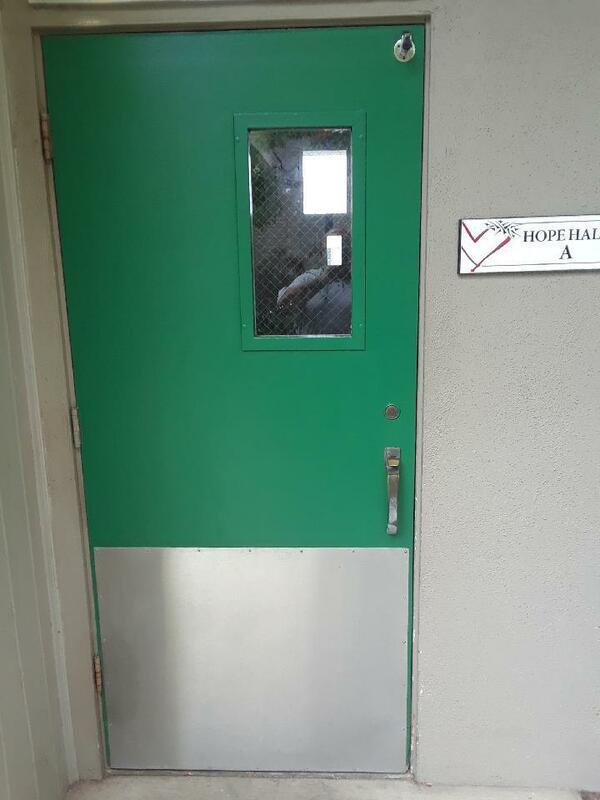 The doors are now being painted BC Green at the new campus. We are having multiple planning meetings, which are producing tangible results at the new site. We now have 110 students enrolling for next year with four months to go! assist with other moving chores those days. Many families have asked how they can help the school, and this is a big way to achieve just that. Please save those dates, and thank you in advance! "After visiting the new campus several times, the Student Transition Team has decided on a really cool and easy way for you to help. We have designed a registry specifically made for the new campus by the students and teachers. You can click this link to go to the Brethren Christian Wish List Registry page and enter the password bchs, and type in Brethren as your “first name” and Christian as your “last name” to browse through what they have selected. There are plans for each item on the registry, such as using The Home Depot gift cards to fill this great piece of land with lounge areas and lawn games. So when you visit the site, click on an item that you would like to donate, choose an amount, and it will be sent to the school. Each donation will be greatly appreciated. 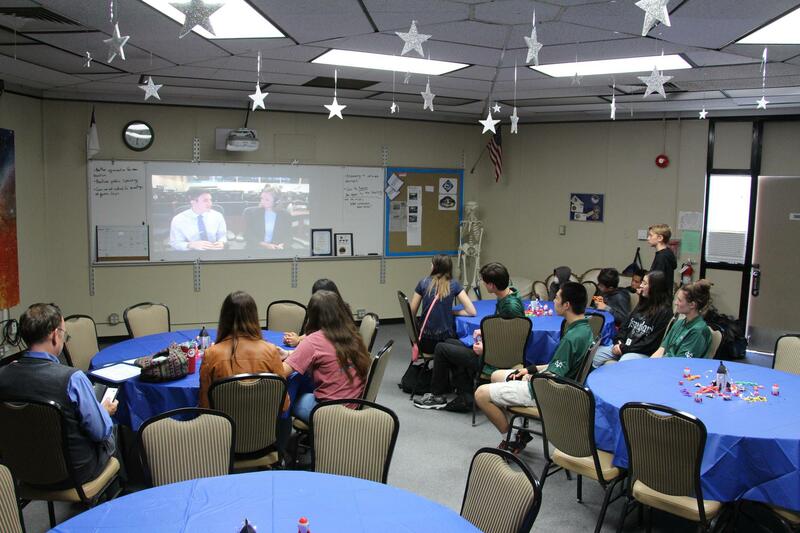 The BC International Space Station (ISS) Team gathered to watch the live video stream of the countdown the launch of the rocket that carried their experiment to the ISS! Their experiment is now orbiting the earth and sending back data to our school in real time! What an exhilarating experience to reach this point after all their hard work this year! 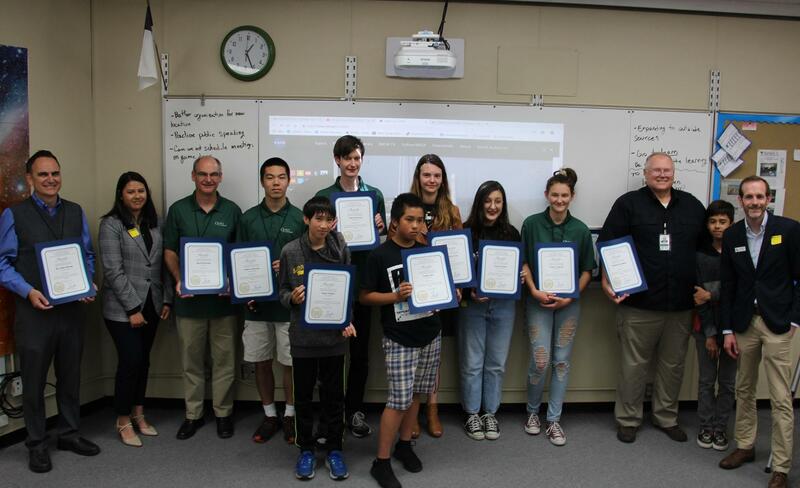 Kudos to Mike Donahoe and Rick Peters for leading these students to success! 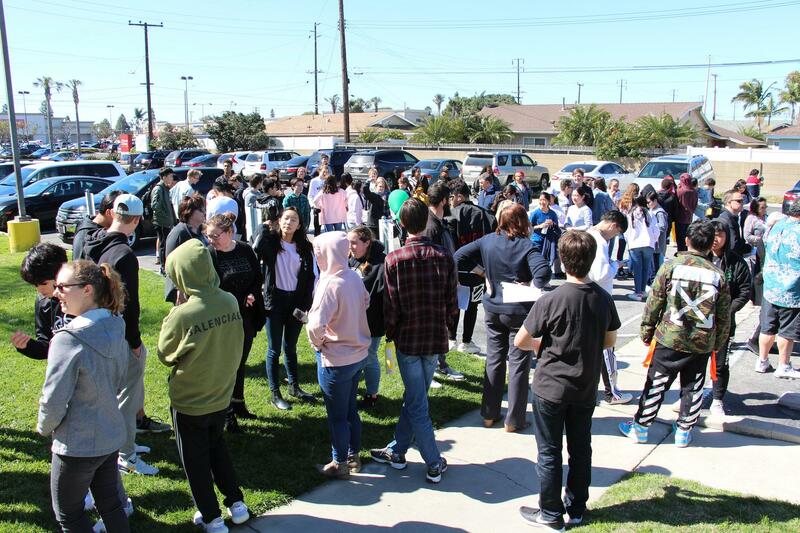 BC is the only school in Southern California that launched and experiment this year! 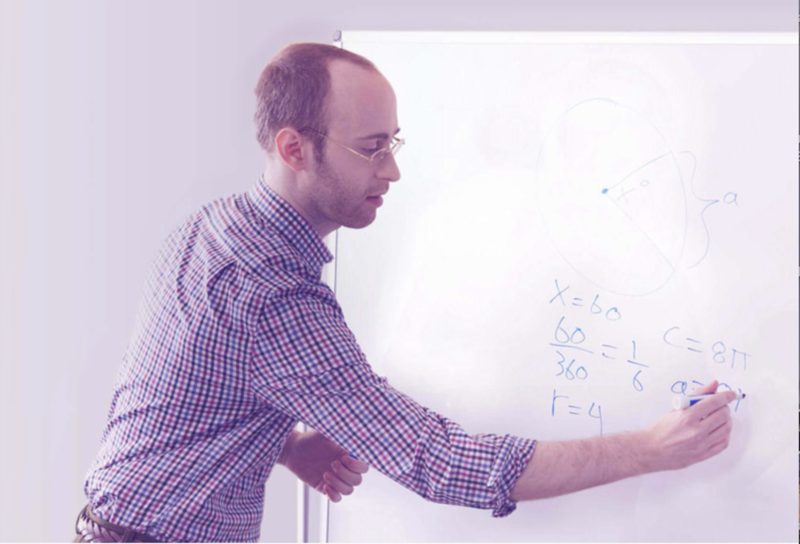 The success of this program puts BC on the map as a premier school of applied math, science and engineering. Please email mikedonahoe@bchs.net if you have a child interested in joining the ISS Team next year. 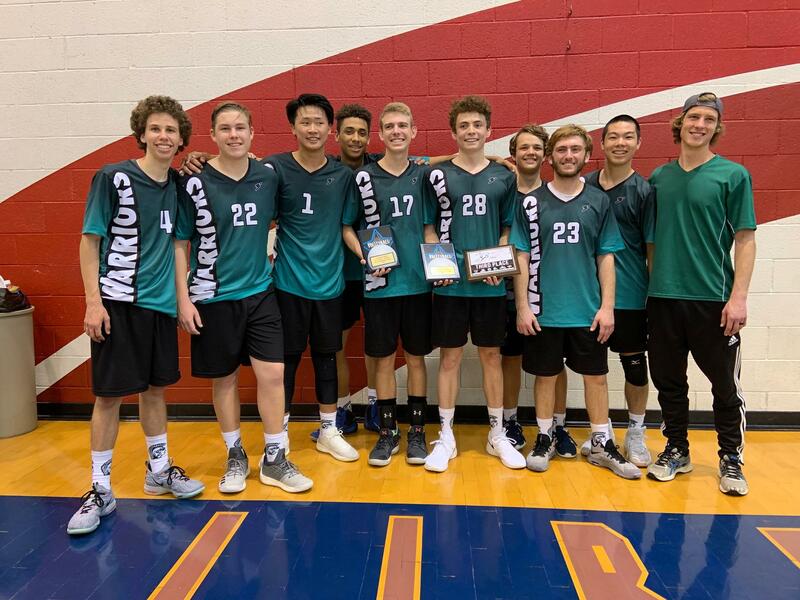 Congratulations to the Boys Volleyball Team for their Express League Championship! They finished the season undefeated with a 10-0 League record! I congratulate every young man on the team and their great coaches, Mrs. Jann Martes and Mrs. Kayla Snyder. 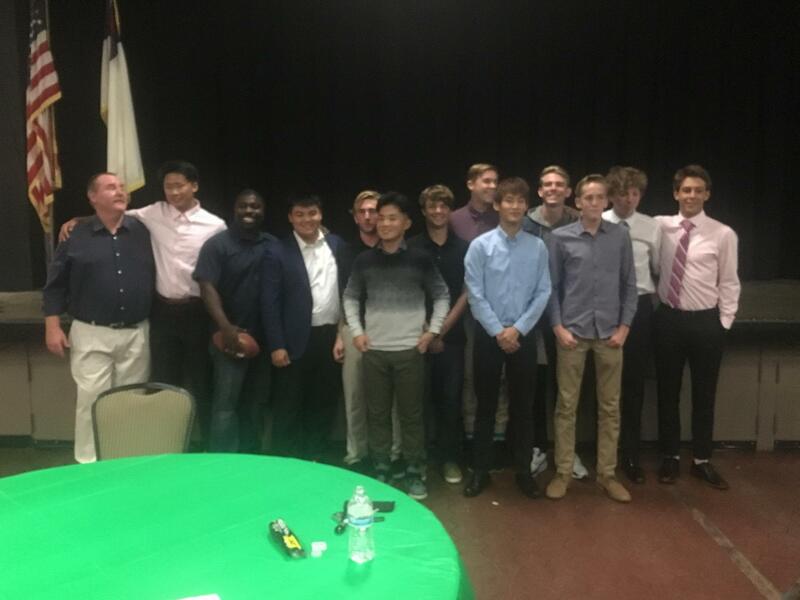 Congratulations also go to the boys varsity cross country team, who has been selected as the 2019 Team Academic Champion for schools with an enrollment less than 1499! The overall team grade point average was 3.94. Scholar athletes all! This prestigious award will be presented on Monday, May 20th at Angels Stadium prior to the Angels playing the Minnesota Twins. Tickets to the game are $10. Please turn in your order and money to Mrs. Whitmire in the Athletic office by Tuesday, May 7th. BC Dine Out at Carl's Jr.
Stop by the Carl’s Jr. restaurant at 21532 Brookhurst St, Huntington Beach, CA 92647 between 6AM and 10PM with this flyer, and you will give back to BC! 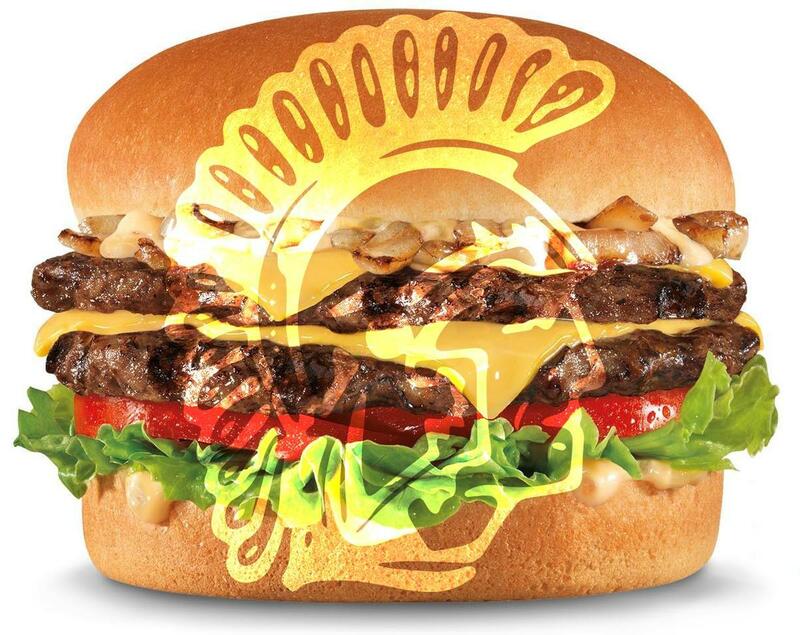 Carl’s Jr will donate 25% of all profits generated by you, your friends, and family when you order any item. You must print out and show the attached flyer in order to give BC the credit. Thanks for your help! We are looking forward to the Phantom Of The Opera - themed Prom this year. Brethren juniors and seniors: stop by the Front Office to pick up your Prom contract, fill it out, and submit it along with your payment. Thank you. BC has a special appreciation for all of our service members - past and present. One of our parents notified us of this special showing, and I wanted to pass it on to you. 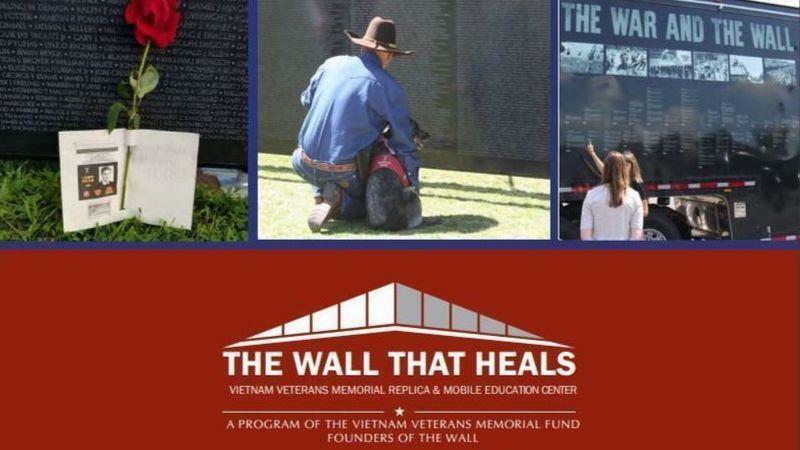 View the 375 foot, three-quarter-sized-replica of the Vietnam Veterans Memorial with more than 58,000 names of those who made the ultimate sacrifice in Vietnam. 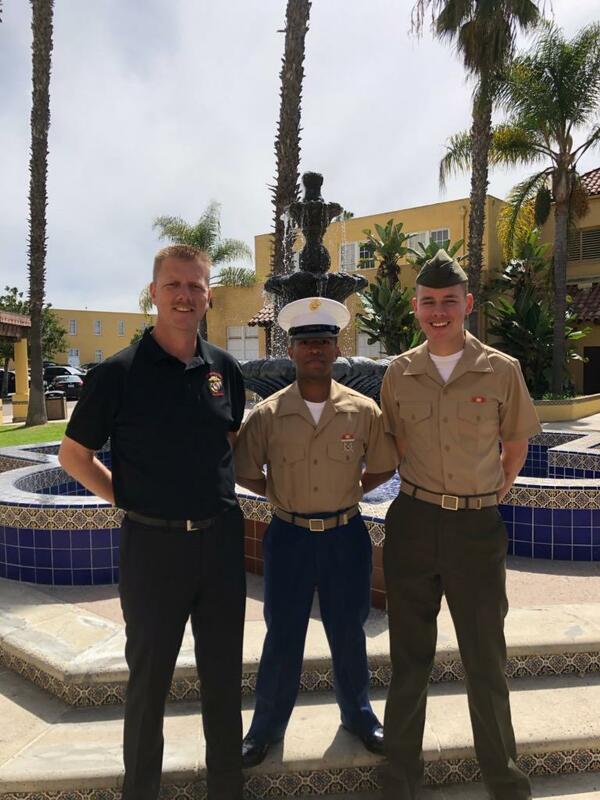 Pictured here are Alex Rehman and Sterling Hanson (class of 2018), who are current Marines, seen with Mr. Hanson volunteering at this memorial ceremony. 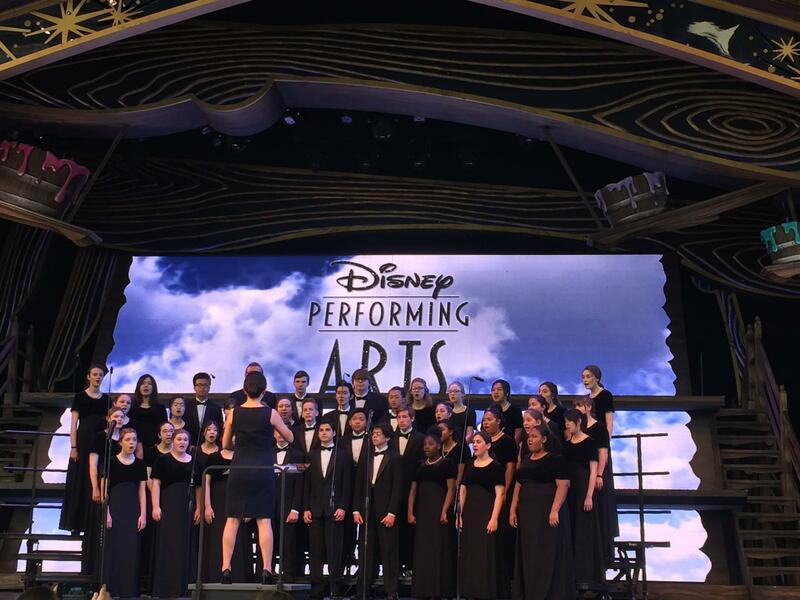 The high school choir performed beautifully on the Fantasyland Stage at Disneyland Resort on April 1st through the Disney Performing Arts program. What a wonderful and unique opportunity for our students to sing on a big stage at a great venue. Students learned a lot about the areas of entertainment, performance, and professionalism. 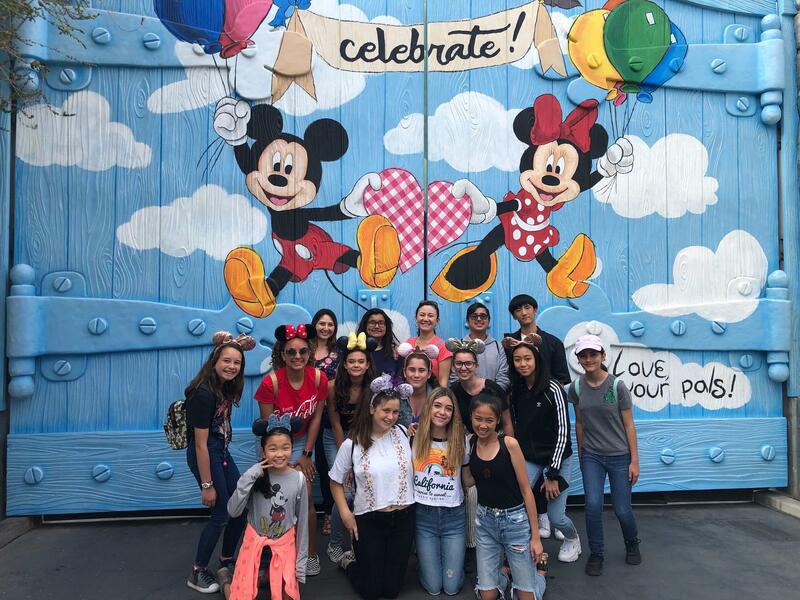 The junior high choir also took a visit to Disneyland on April 8th. 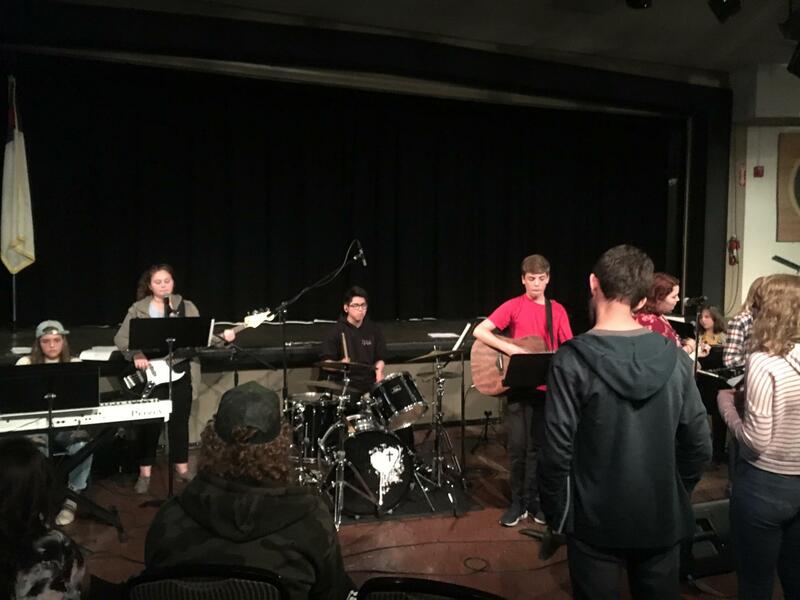 They participated in the Vocal Soundtrack Workshop, in which they worked with a professional vocal coach learning how to sing for films and animation in a recording studio. Over the course of the 90-minute session, they recorded two songs along with the respective film footage. The students were exposed to people with careers such as voice-acting, vocal coaching, session singing, sound engineering, etc. What an exciting day they had! 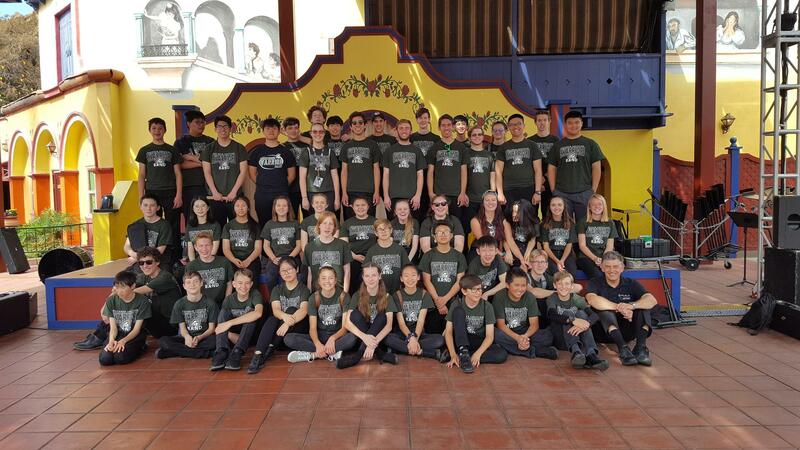 Congratulations also to our junior high and high school bands for great performances at Knott's Berry Farm on Monday, April 8th! The host of the event said that she was "blown away" by our student performers. Way to go Warriors! Due to missing school on the Good Friday holiday, students will attend periods 4, 5, 6 and 7 on Monday, April 15th consistent with a Friday schedule (with regular start and end times). Please plan accordingly. 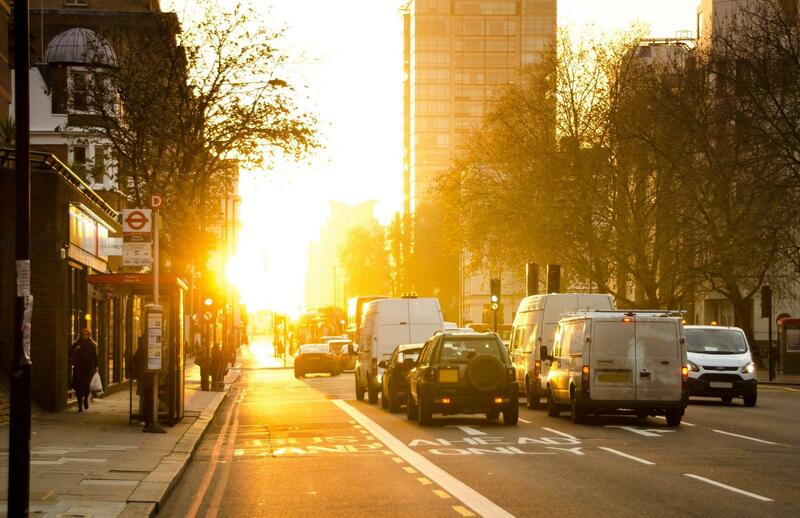 This will not impact start and end times of the day, but will affect students class times. 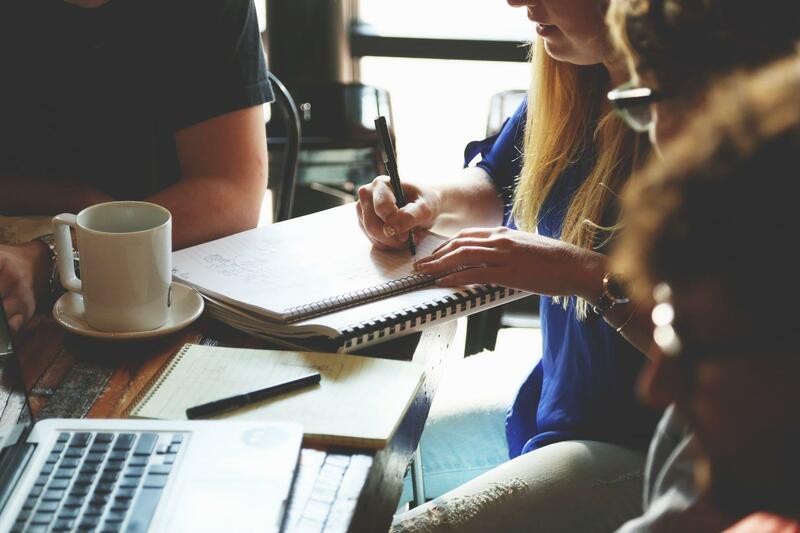 Did you know that Brethren Christian School partners with three different universities to offer dual enrollment courses to high school students so that they can start getting college credit early? 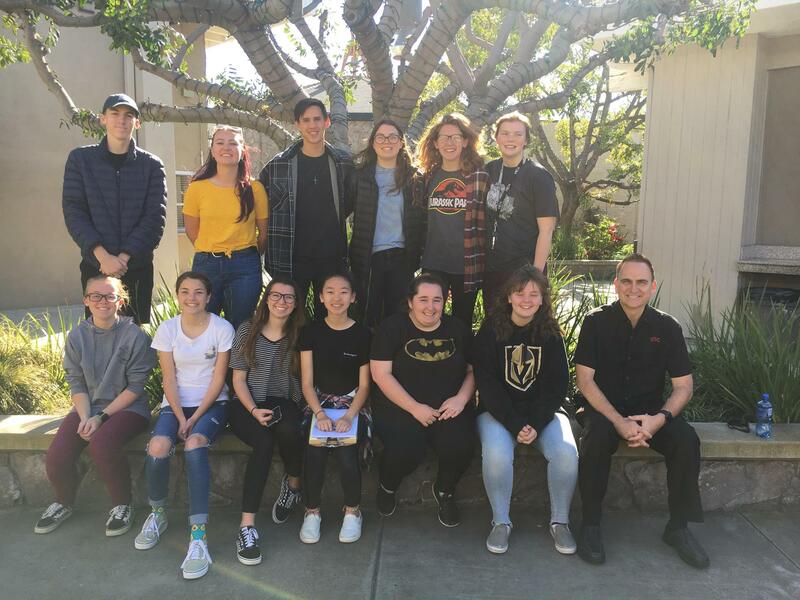 Visit our Dual Enrollment web page to learn about our opportunities through Grand Canyon University, Biola University and Duke University. We are counting down to our launch to the International Space Station on Wednesday, April 17th, between 1:30PM and 2:30PM. 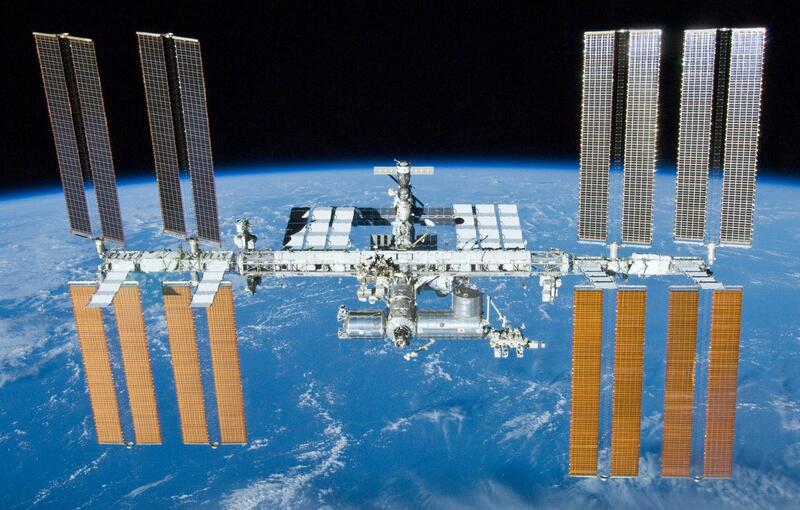 Kudos to Mike Donahoe, Rick Peterson and the brilliant students on our ISS team, who have constructed a scientific experiment that will be tested in micro-gravity aboard the ISS starting next week. It was such a blessing to attend the praise and worship concert last night led by our student worship leaders. Jesus was lifted up, the Holy Spirit was moving, and we all prayed for each other. This is at the heart of who we are as a Christian school ministry, and I am so blessed to be a part of this Christ centered community. 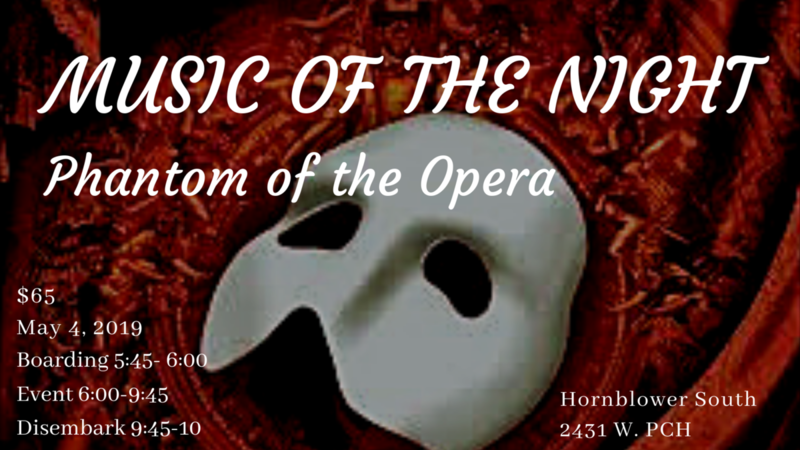 We are looking forward to the Phantom Of The Opera themed BC Prom this year. Brethren juniors and seniors, stop by the Front Office to pick up your Prom contract and fill it out, and submit it along with your payment. 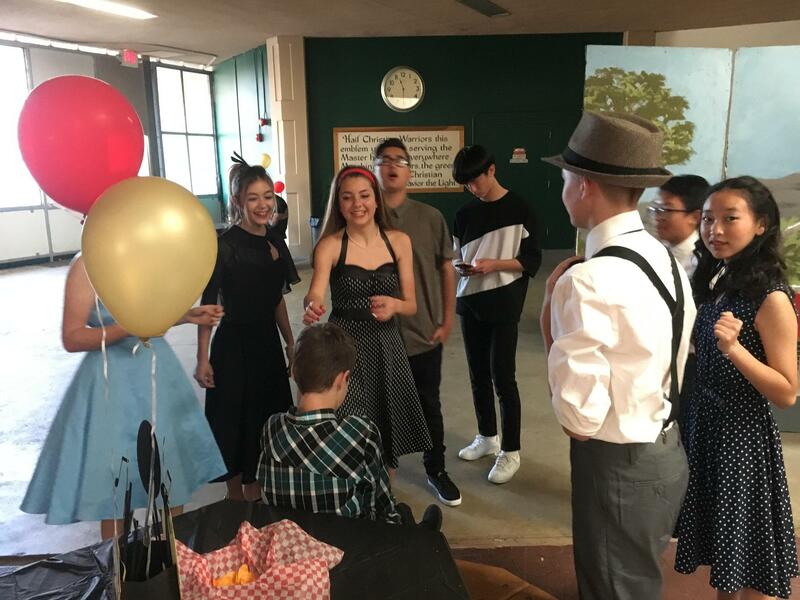 Tonight our junior high students are enjoying a fun 1950's themed dance, complete with hamburgers and chocolate malts! It was a bee boppin' good time for all! I lift you high in praise, my God, O my King! and I'll bless your name into eternity. 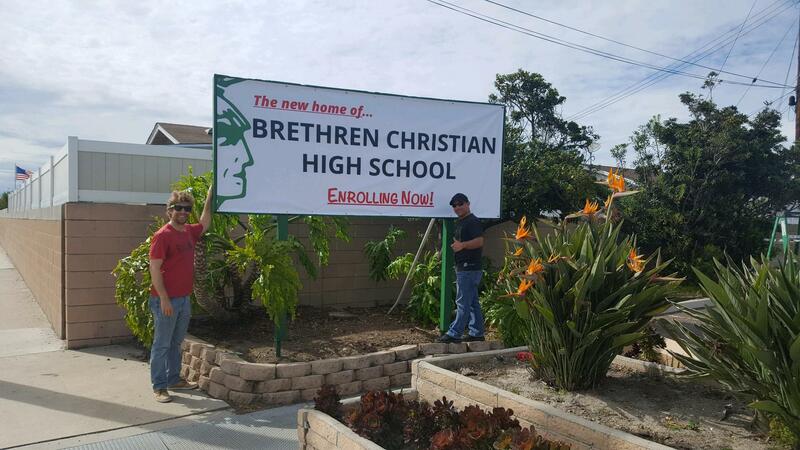 Our new school sign is now up in front of the Grace Church campus on Edinger! We will be painting the doors green in the next several weeks, and we will be adding our Warrior head logo on the window of the school office. The two new portable buildings are being ordered, and will be in place by July. We have planned the cleaning and painting of the classrooms for June or earlier. · assist with other moving chores those days. 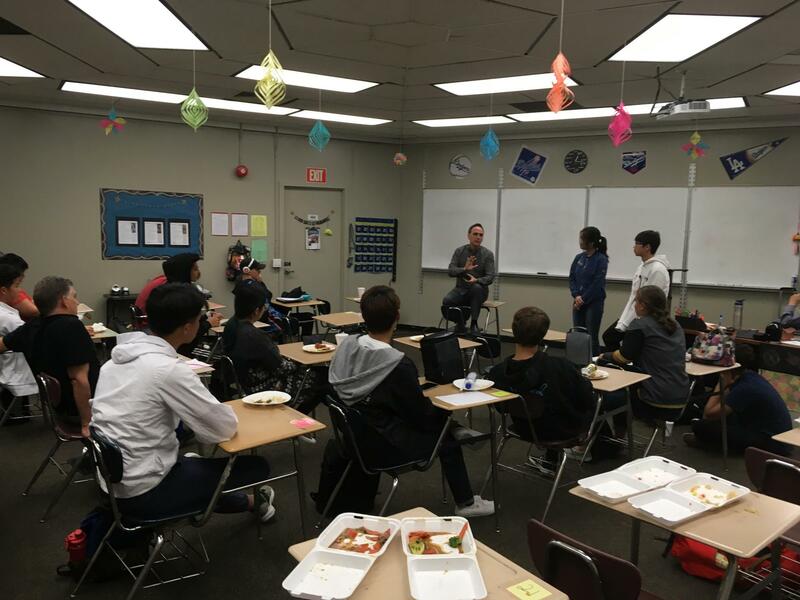 Two of our students, Nikki He and Jason Tran, have started this club to promote literacy in China. 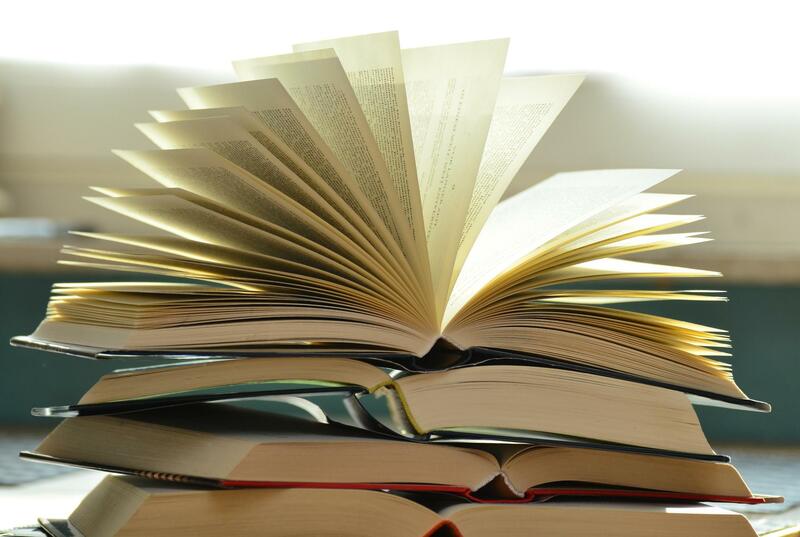 Please donate any books written in English that are appropriate for grades K-12 to the front office by April 21st. These books will go to Tongdian Middle School in a small village in China that has trouble affording such books. Please sign your name in the books you donate as a personal touch. Thank you!!! I am so happy and excited to join the Brethren Christian Family as your new Business Manager. I have a daughter that attends Grace Lutheran School, so the partnership is a blessing to me and my family. As part of the Transition Team, I look forward to helping with the move. I also look forward to meeting and serving all of you! If any of your personal items are at our school, please claim them before May 20th. It will either be sold, donated of thrown away after that. We do not wish to dispose of any items that belong to a school family, so please see Mr. Reyes, Mr. Namahoe, or Mr. Lanning to reclaim any items belonging to you. Thank you. The students should dress in their 50’s finest (girls—dresses & boys—button down shirts & no blue jeans)! Dinner & Dessert are included in the ticket price. This event is meant to be more of a fun, group experience – not a couples event. If you have any questions, feel free to email stephaniejohnson@brethrenchristian.org or call the front office. We want this to be a fun event for all of our Junior High students and to make memories with their friends. Our Student Transition Team requested that the classroom doors at the new campus be painted BC green, and the church has agreed with that. We will also be purchasing green shade coverings. We have ordered a new sign for our campus, which will be posted on Edinger Avenue within the next week or so. We are also preparing the school office for visitors soon. We have made the decision to purchase two new portable buildings to replace the older ones currently on the campus. This will provide three more classrooms and three more office spaces. We are now at 100 students enrolling for next year! This was my goal for August 9th, so I am so grateful to see the enrollment so strong at this point. Applications from new and domestic students continue coming in almost daily, which bodes well for a healthy student body next year. Our new campus will accommodate all of our students, and there are building plans already in place to accommodate growth over the coming years. We are making a special offer for those few students, who have not yet re-enrolled for next year. We will only raise the re-enrollment fee by $50 until the end of March. That means you will pay $249 instead of $550 if you enroll by the end of this month. This is a savings of $301. You can enroll online via our website at www.bchs.net/reenroll/. The tuition, tech fee, and most other fees will not increase for next year, but you will receive the same quality education you’ve come to expect from BC at our new location. You will receive a 2% discount on tuition for next year, if you pay in full by April 15th. We do not have enough students requesting bus service for next year to make it cost effective. However, we are creating a carpool system that will help those of you still requiring transportation services. Another option we have been exploring is to partner with the student-driving service, Hop Skip Drive, which is a sedan service that transports groups of children to and from schools. Thank you so much for your support as we work together to arrive at the best way to accommodate everyone's transportation needs. We'll be working with the PFC to create a carpool sign-up sheet for parents and to request volunteer drivers. Please contact Shawn Thomas, our Admissions Director at sthomas@bchs.net if you have any questions, since he will be working with the PFC and our parents to ensure every student has transportation next year. 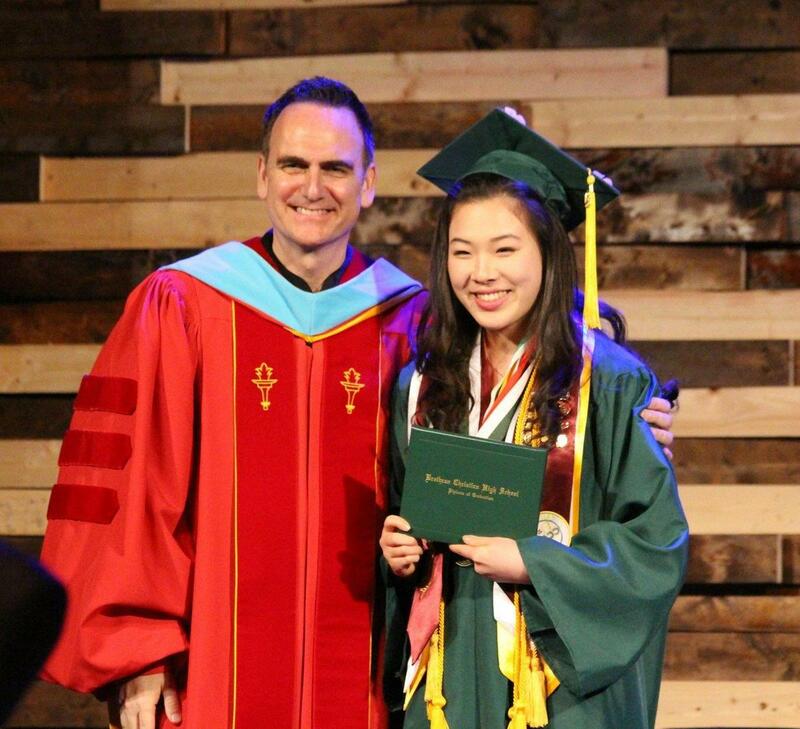 During my first year here at Brethren Christian, I have felt God’s presence constantly among the students and staff. I have been impressed with a focus and balance of teaching students to follow Christ while also providing quality instruction. I believe God has protected this school, because He has plans for it to become even stronger and a bigger influence in the community. I am excited to see what God has in store for Brethren Christian School - a place where teachers care so much for the whole student. It has been a pleasure to be a part of this school, and I look forward to next year with excitement. I want to send a shout out to the following students, who won awards at the Creative Writing Festival. Kudos to them and their English Teachers, Stephanie Johnson and Marcia Maresh, for achieving such recognition for excellence in writing! 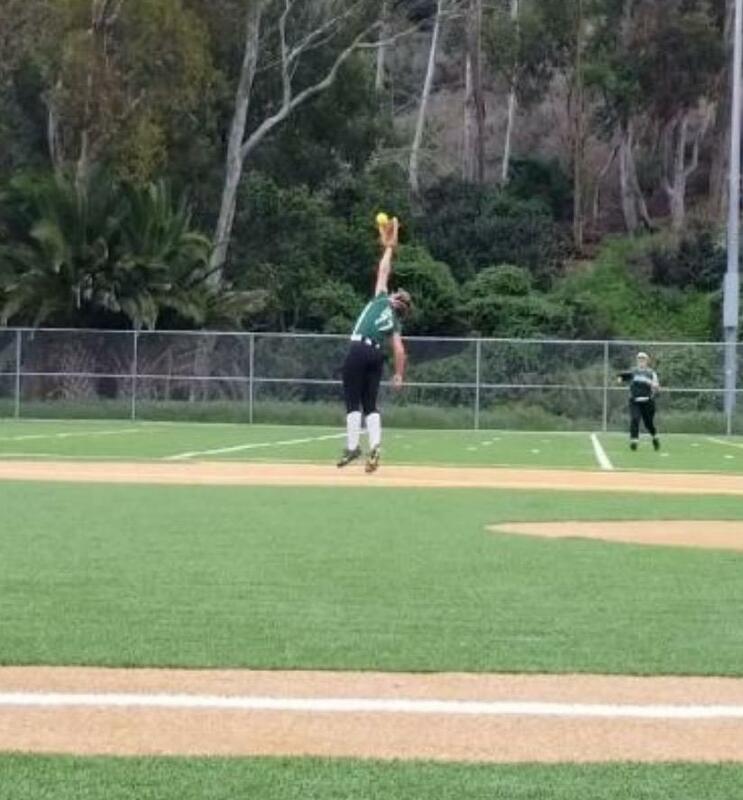 All of our spring sports are doing great! 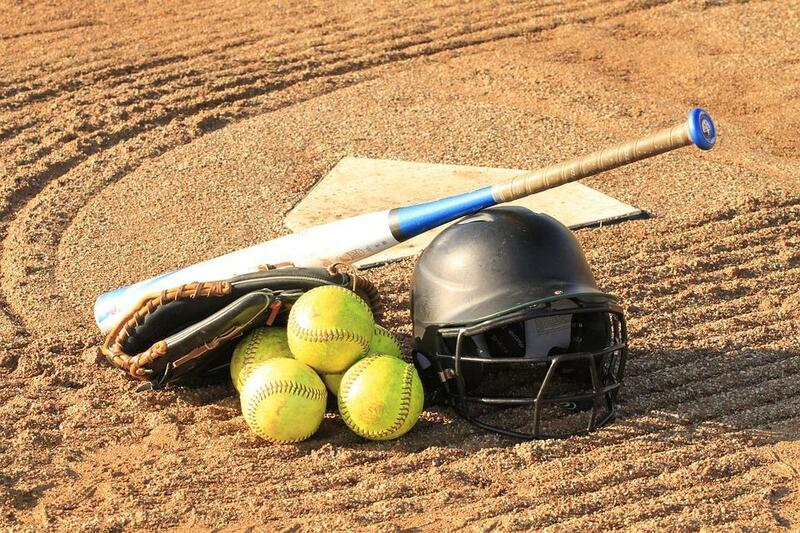 The softball team has won three games this season after two previous seasons without a win – go Lady Warriors! 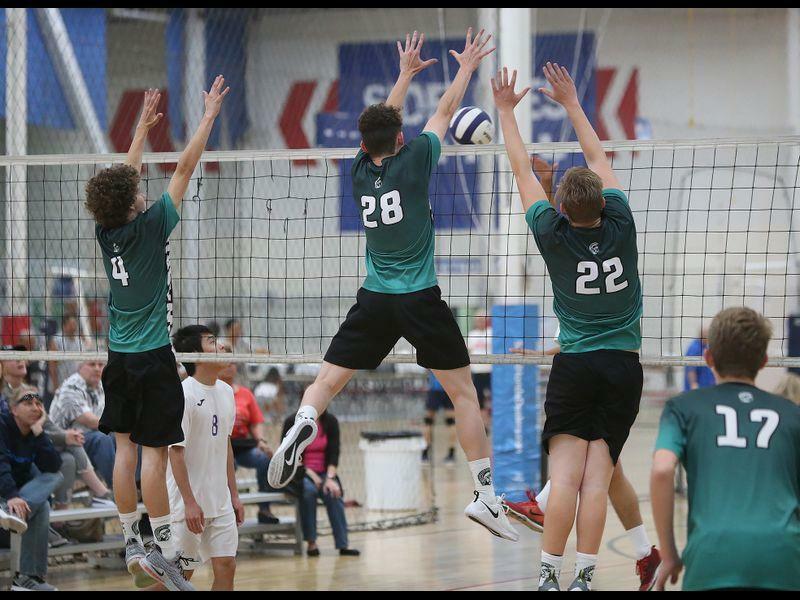 The Boys Volleyball team is undefeated in league, and may be heading to the playoffs! Way to go team! This event is meant to be more of a fun, group experience not a couples event. Flyers in the Library and the front office. 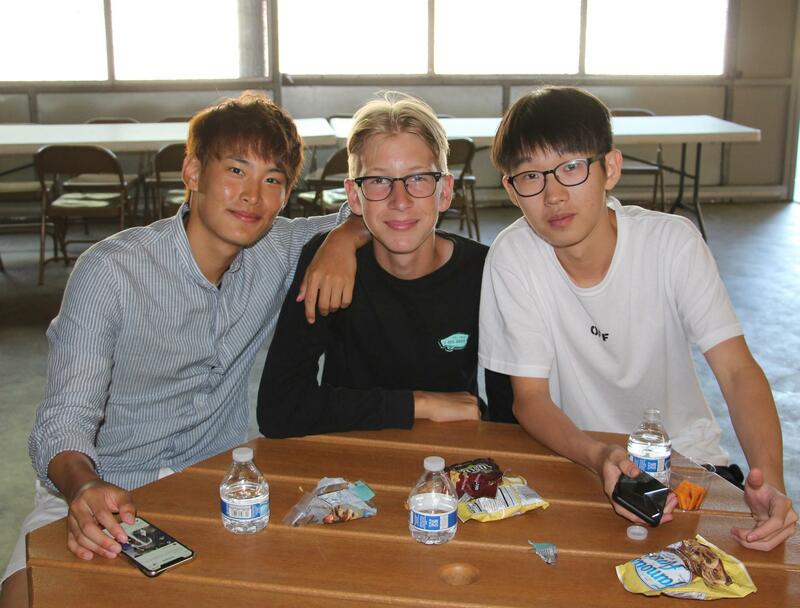 Brethren Christian School has partnered with the Semita School for a number of years to provide supplementary programs, e.g., ESL classes, SAT/TOEFL test prep, and academic tutoring, etc., for our International Students. 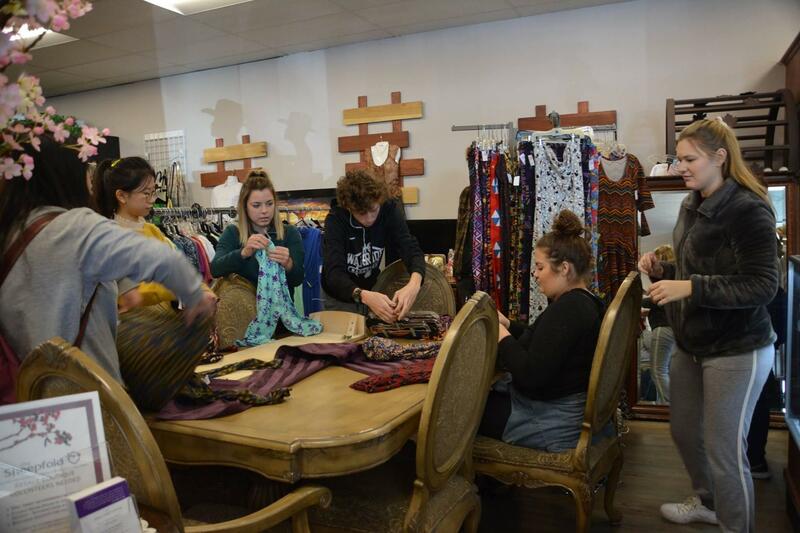 However, their program also focuses on global education and cultural immersion for all school-aged young people, and has locations in 14 countries throughout the world. They are extending an invitation to our current domestic BC students to explore China for two weeks, August 3-17, 2019, with their Global Ambassador Program and to gain valuable experience that will impact their lives for years to come! Please visit our Events Page for more information. 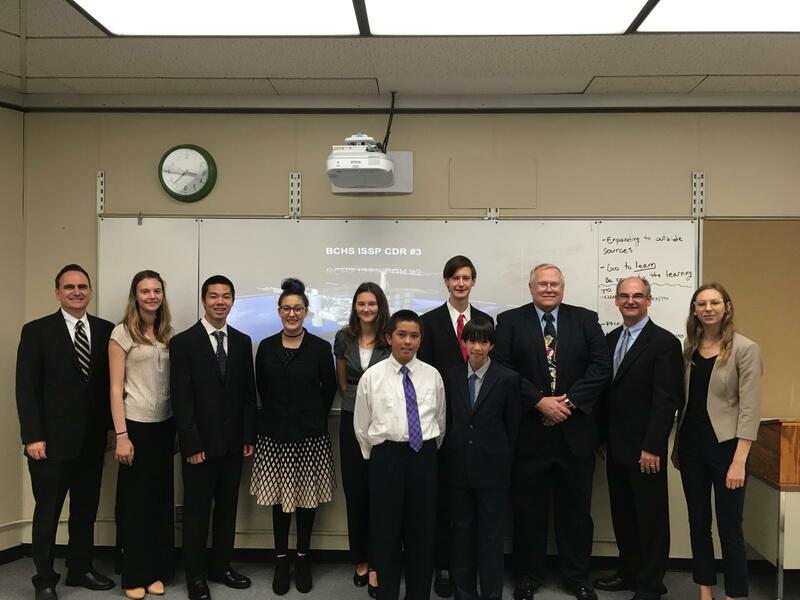 Brethren Christian School has been given two amazing opportunities through the International Space Station (ISS) Program. 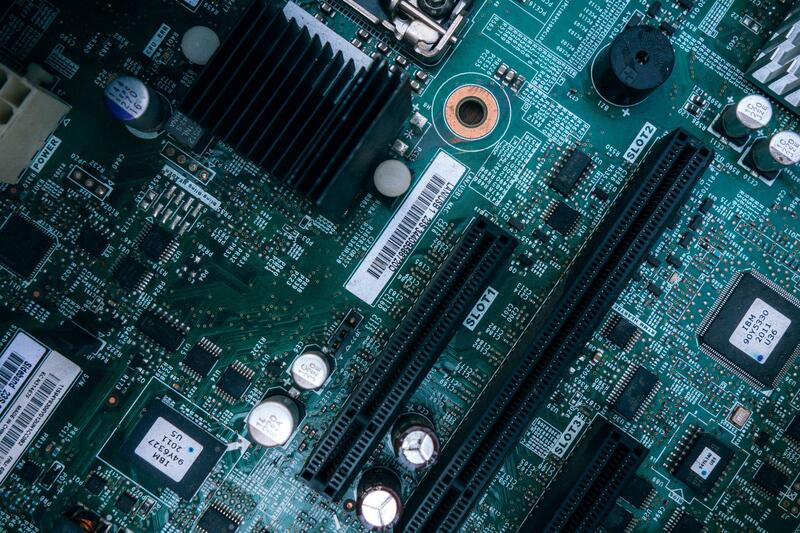 If you or your student is interested in Computer Programming, Astronomy, or Autonomous Robotic Vehicles, you won't want to miss these. 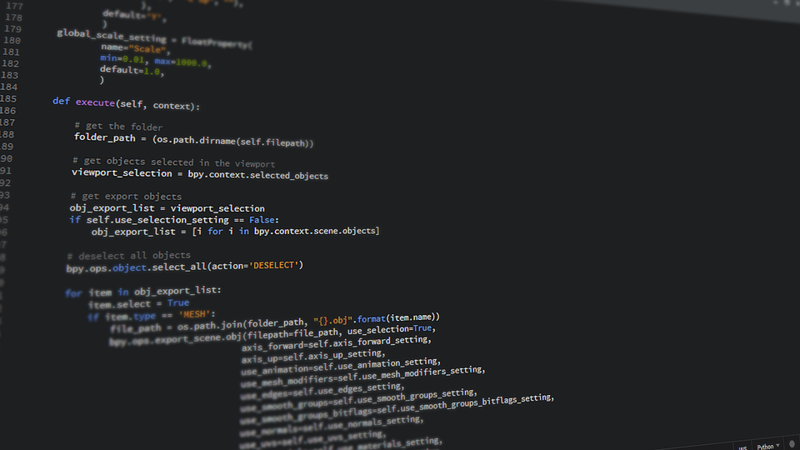 First is a tutorial on Python Programming Language, led by UC Santa Cruz Professor Dr. Raja Thakurta. Detailed information can be found on their tutorial page. Next is the AWS Deep Racer Program, and programming mini-race cars. For more information, please contact Mike Donahoe at mikedonahoe@bchs.net. 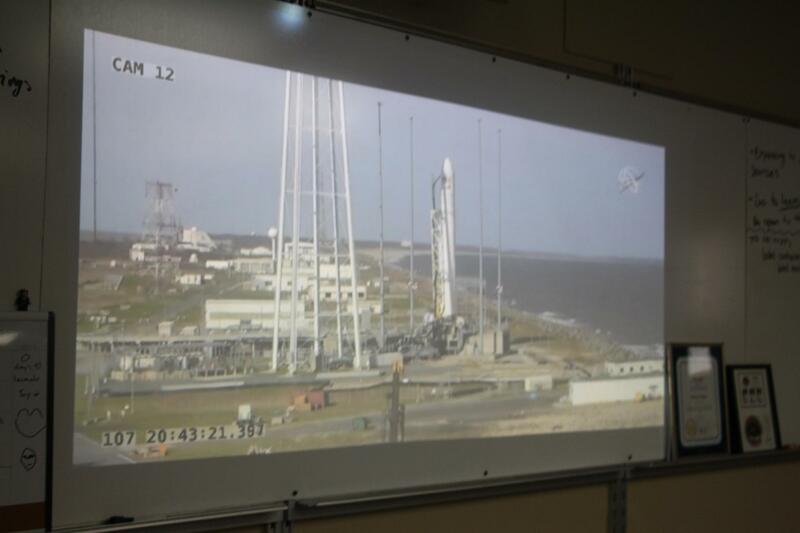 Congratulations to our BC ISS Program as their experiment will be launched into space on April 17, 2019. Please stay tuned for more details if you would like to attend the launch party. 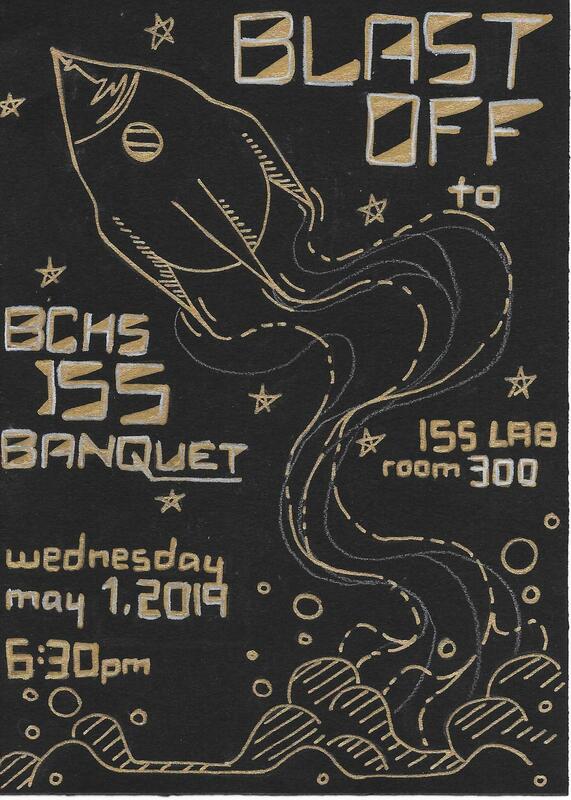 On May 1st there will be a banquet celebrating our first year of space exploration with the ISS program. Tickets are $10 and parents and guests are invited. RSVP details coming soon. I notified parents in December that Kimberly McGovern switched to working hourly in the role of Business Manager. 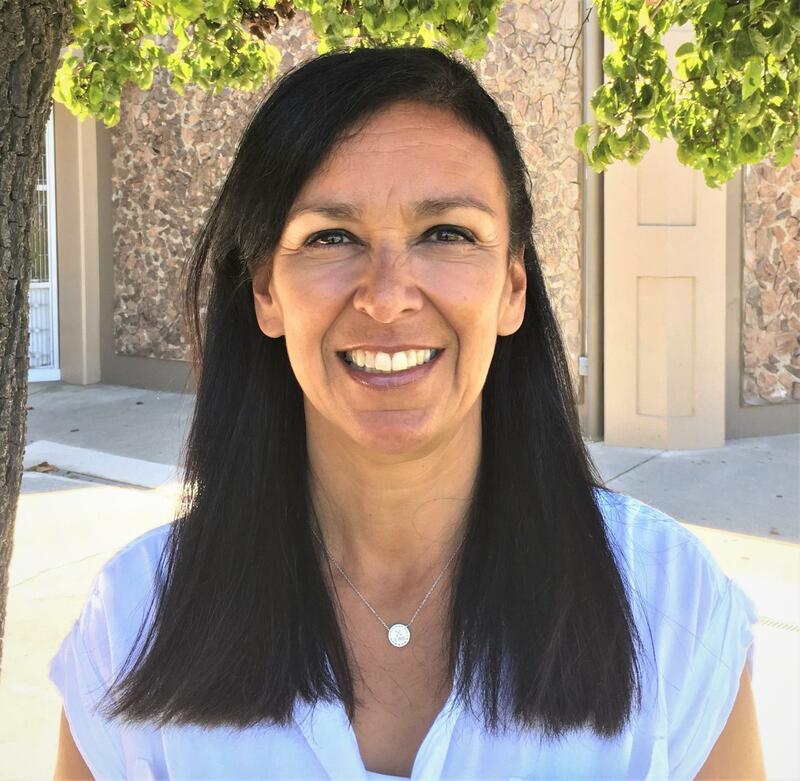 We've decided that we need a full time person in the office again to provide full service to our staff and parents, so Donna Martin will begin as our full-time Business Manager on Tuesday, March 26th. Donna is highly experienced and capable, and I am sure you will all be happy with the service she provides. I will provide a photo and bio of her as soon as next week. I thank Kimberly for her service, and I am sure you will join me in wishing her well in her future endeavors. 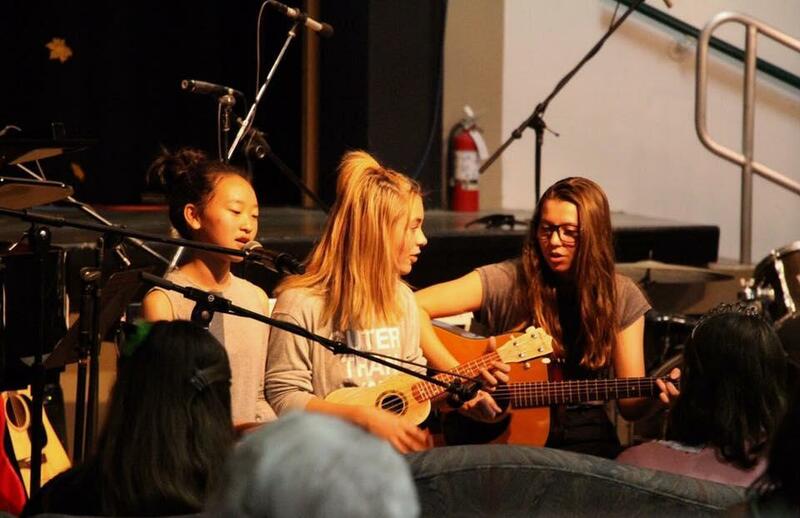 The Brethren Christian High School choir participated in the annual ACSI Musicale, which was held at Lake Avenue Congregational Church over the course of two days. 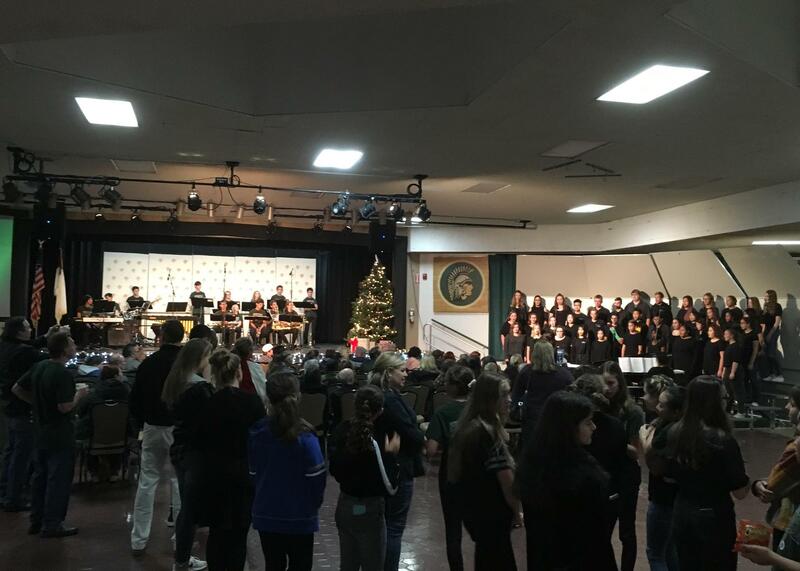 The students performed and were adjudicated in small and large ensembles, and were under the direction of Dr. Dan Jackson from Point Loma Nazarine University for the combined mass choir. Three of our numbers were selected to be sung in the command performance, and Sam Skarin (senior), Sierra Martin (senior), and Rachel Kent (sophomore) were chosen as soloists for the mass choir numbers. Congratulations to all the BC choir students! 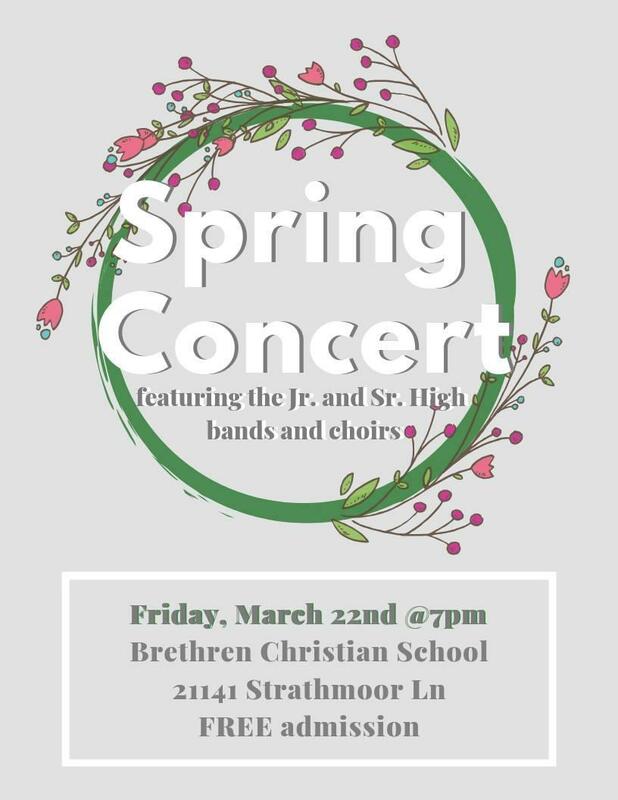 Tonight at 7PM, come enjoy this free concert featuring both the junior high and high school bands & choirs as we celebrate the passage into spring! Don't miss it. Yours, O Lord , is the greatness and the power and the glory and the victory and the majesty, for all that is in the heavens and in the earth is yours. Yours is the kingdom, O Lord , and you are exalted as head above all. We had a wonderful time at the new campus yesterday as you can see in the photos (more photos can be viewed on our Brethren Christian Facebook Page). The students seemed genuinely surprised at how nice the campus is, and many commented on how much they liked it. They were already making their plans for how to use the space for clubs and classes. We continue to work closely with the Grace Lutheran church/school staff to work out the many details of a successful move. The transition teams from both organizations are working with a spirit of collaboration to arrive at win-win solutions. It is becoming more and more evident that this partnership is creating positive outcomes for ministries. 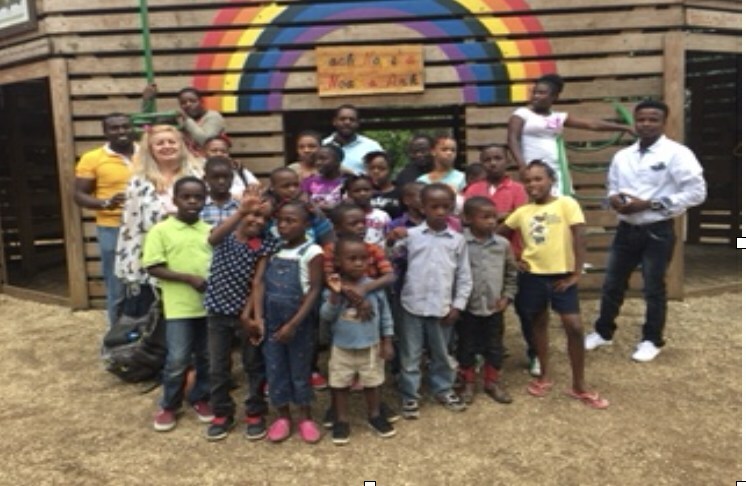 Many thanks to Andrea Potter and the PFC, who helped make this a great trip! Kudos to Ms. Flippin, Mrs. Simonds, Mrs. Heffernan and others, who made this trip happen! We are scheduling a make-up Field Trip for our choir students, who were not able to join us yesterday, so stay tuned for details. Our Student Transition Team visited the school this afternoon to continue their input on how to give the campus the BC look and feel. Their enthusiasm is infectious, and it is wonderful to see how excited they are about the campus move. We are making a special offer for those few students who have not yet re-enrolled for next year. Since we just recently announced our new location at the church campus, we will only raise the re-enrollment fee by $50 until the end of March. That means you will pay $249 instead of $550 if you enroll by the end of this month. This is a savings of $301. You can enroll online via our website at www.bchs.net/reenroll/. There is a wonderful bond created when we work together in moving and setting up a new place to minister together. It creates “ownership” among our students, parents, and staff. I’m looking forward to see how God will work this new iteration of the BC campus for His good. Let’s grow and learn together! There will be no school on Monday. We placed this long weekend on our calendar because it is a long time between Christmas break and Easter Vacation. I wish all of you a safe, happy and blessed weekend! Come enjoy this free concert featuring both the junior high and high school bands & choirs as we celebrate the passage into spring! Enjoy a variety of songs and experiences that center around the theme of growth and renewal. Join us Friday, March 22 at 7PM in the BC Mall. …then know this, you and all the people of Israel: It is by the name of Jesus Christ of Nazareth, whom you crucified but whom God raised from the dead, that this man stands before you healed. Salvation is found in no one else, for there is no other name under heaven given to mankind by which we must be saved. We now have 90 students enrolling for next year so far. Since we are already at 90% of our enrollment goal for next year with six months to go, we have raised our enrollment projections to 125 students, which we may surpass. I have never seen this rate of enrollment at this point in the process during my 20 years in Christian education. We thank all of you, and we praise the Lord. This really helps our planning process, so bless all of you for re-enrolling early. We are rescheduling our Field Trip to our new Campus to Thursday, March 14th. Please stay tuned for details, but I want to ask now that you consider driving our students to and from Grace Lutheran on that day. If you would like to do that, please sign-up on our Grace Field Trip Sign-Up page. We will get there at 11:15, and we will leave at about 12:30. We will provide a free pizza lunch to every student, so only pack a lunch if your child(ren) has/have a special diet (or if they don’t like pizza). It will be a great time for students to tour the new campus and to have fun with their classmates. We will also take time to pray together for the new campus. We will be setting up our new School Office at the Church Campus very soon. Our Admissions Director, Shawn Thomas, will have some office hours there, and we will post them when available. Our student Transition Team has already started a list of items they want to see done at the new Campus. The team will take a field trip there soon to get more clarity on how to give it the BCHS feel. I am so proud of these students, who have taken the initiative to ensure that the BC spirit continues next year and beyond! We are making a special offer for those few students, who have not yet re-enrolled for next year. Since we just recently announced our new location at the church campus, we will only raise the re-enrollment fee by $50 until the end of March. That means you will pay $249 instead of $550 if you enroll by the end of this month. This is a savings of $301. You can enroll online via our website at www.bchs.net/reenroll/. 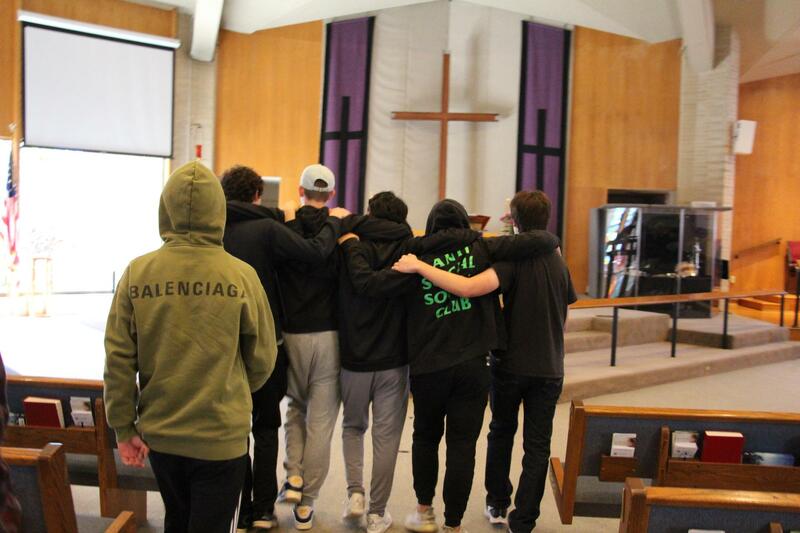 What I’m most looking forward to next year is to be part of the amazing community that is Brethren Christian. Being one of the new additions, I have been amazed at how welcoming and influential the BC family has been in my life. 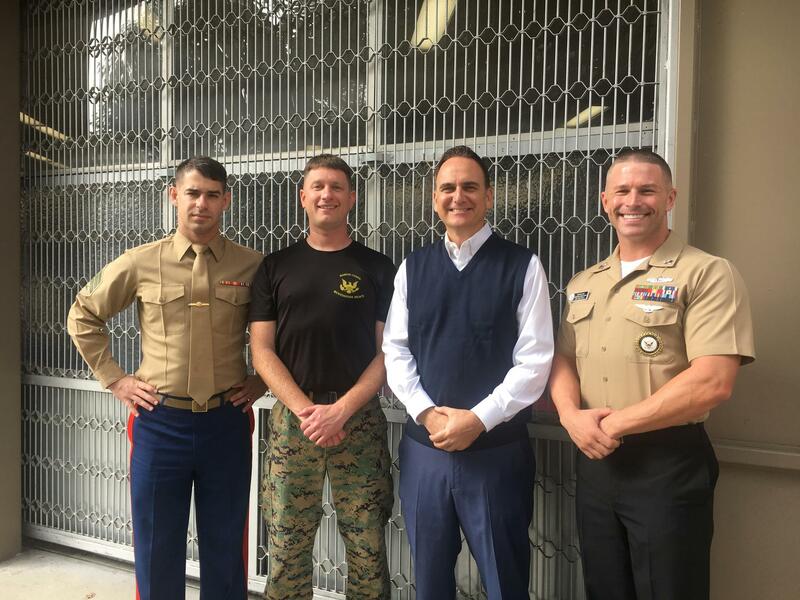 It is evident that this ministry has a passion for helping young individuals be followers of Christ and to use His teachings to better their community. Brethren will continue its impactful ministry at its new location at Grace Lutheran, and I’m excited to see all the ways BC will make a positive impact on students for many years to come! 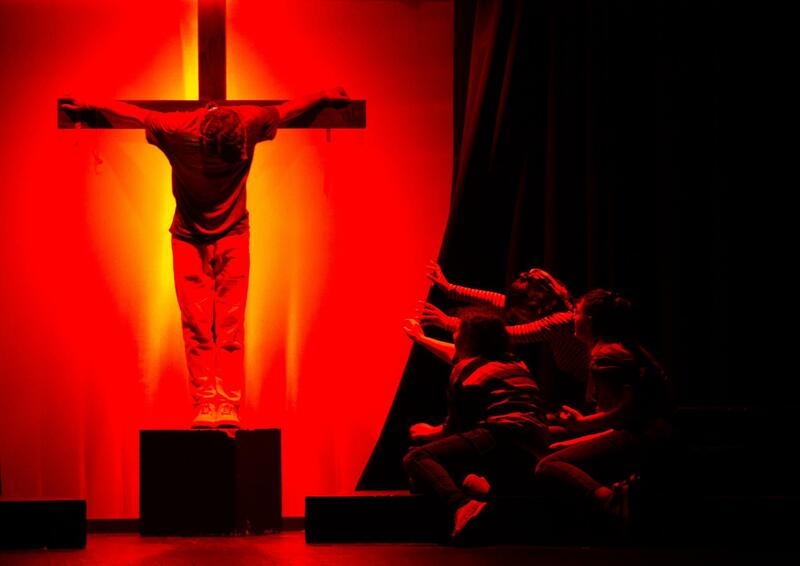 Do not miss our amazing BC Playhouse production of Godspell, which has only two more performances: Friday, March 8th and Saturday, March 9th. The show begins at 7pm and tickets are available online at $10 for students and $15 for adults! 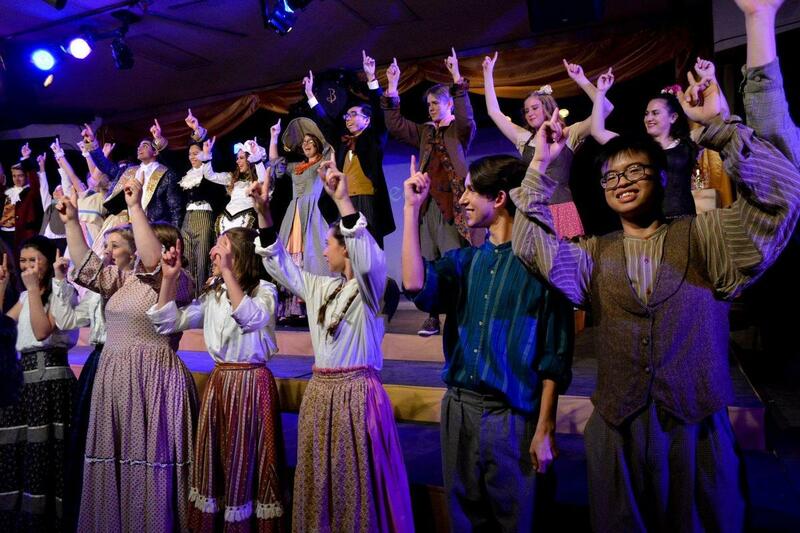 Come support your fellow classmates and enjoy another amazing BC musical! 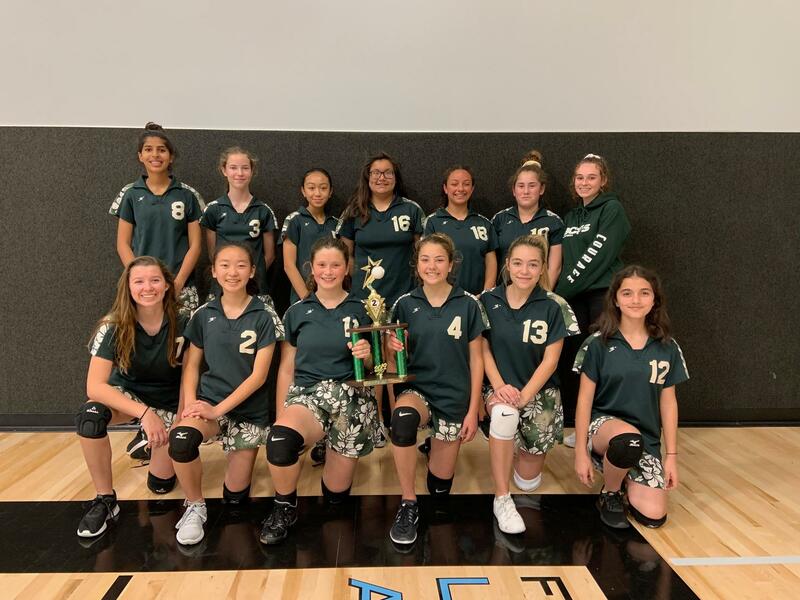 Congratulations to the JH Girls Volleyball Team for making it to the CALOC D4 Championships. They played a great match but fell short. 2nd place is still an awesome accomplishment and we are very proud of them. 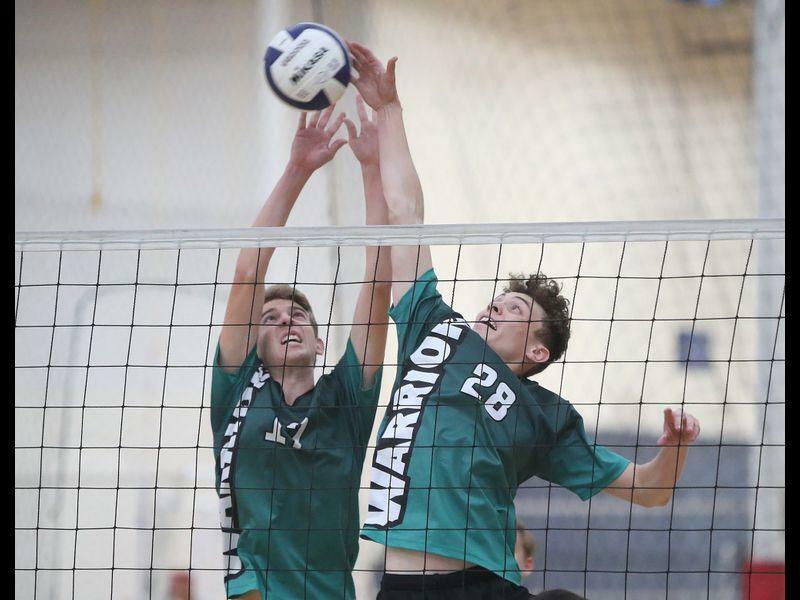 The Varsity Boys Volleyball team participated in the 2-day Beach Bash Volleyball Tournament this past weekend and brought home the 3rd place trophy with a victory in the final match over Capistrano Valley Christian. Congratulations Warriors! 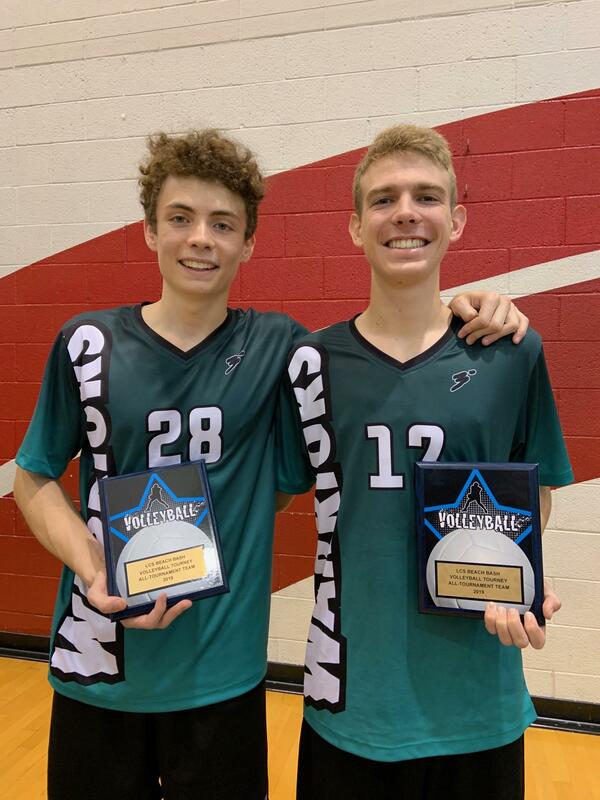 Logan Egan (left) and Seth Klaasen (right) were awarded "All-Tournament Honors." Check out the schedule on the team page on the BC website and come cheer the team on this season. 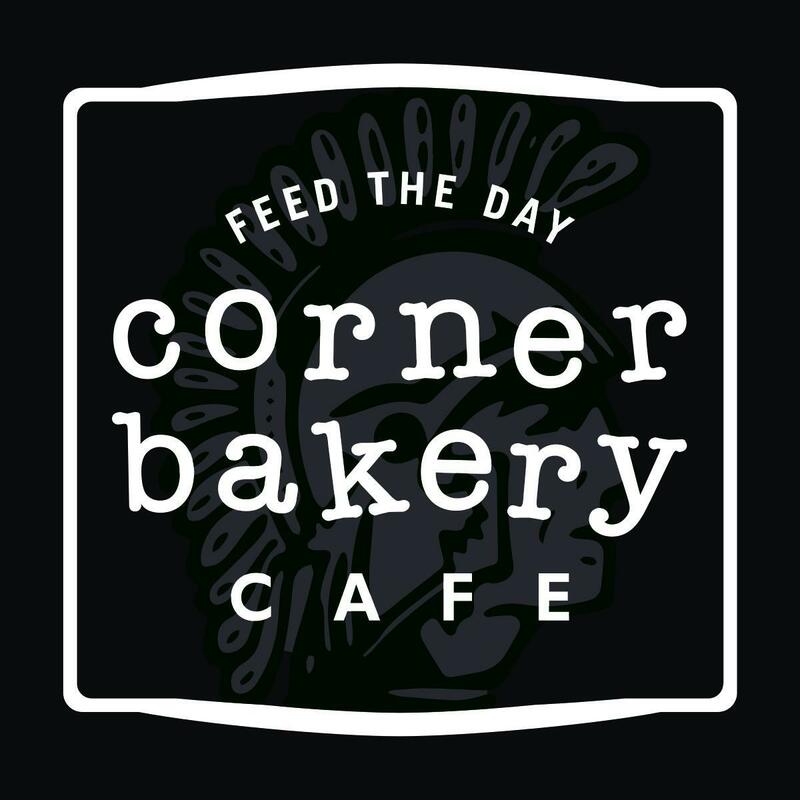 Our next PFC Dine-Out Fundraiser is scheduled for Tuesday, March 12, at 85 degrees Bakery in Fountain Valley between the hours of 3-6PM and 25% of proceeds will go back to BC. You must show this flyer when you make your purchase! A large Function Hall with a full kitchen for multi-use, band practice, coffee time, lunch, pep rallies and other activities. A library that can be used for study halls, meetings, etc. A full BC school office space with reception area and 3 individual offices. A large courtyard for lunch, breaks and activities. A grass quad for PE classes and other outdoor activities. Ample parking and a complete carpool circle for easy drop off and pick up. A large, two floor office and classroom building. The church campus has the look and feel of a high school campus, and it affords us ample space to conduct all school functions in style. It provides a separation of Grace’s PK-8 school and our school. With that said, our students entering Grace’s 8th grade next year will still be able to avail themselves of many of our BC programs. We will still utilize the school field for athletic practices and games, and our art room will most likely be located on the main campus. Some of our teachers will also teach certain subjects to Grace’s students on the school campus. Our Student Transition team will make suggestions on how to create a BC look and feel on the church campus. As a reminder, this campus is near the corner of Edinger and Goldenwest. Feel free to visit there, and just check in with the church office upon arrival. Stay tuned for a school field trip to the church campus in the coming weeks. This is an unexpected and additional blessing to our Campus move plans, so let’s praise the Lord together for this tremendous upgrade to our future campus plans! The first phase of our re-enrollment period ends TOMORROW (Feb. 28th), so register now and take advantage of our early enrollment discount. Seventy students are already enrolling for next year, which is 70% of our enrollment goal with 6 months to go. This greatly surpasses our expectations for this first month of re-enrollment, so I thank the parents and praise the Lord! You can enroll online via our website at www.bchs.net/reenroll/. We are offering a special discount on re-enrollment for the month of February at only $199. The fee goes up to $550 on March 1st. So, if you re-enroll in February, you will save $351 on the re-enrollment fee. The tuition, tech fee, and most other fees will not increase for next year, but you will receive the same quality education you’ve come to expect from BC at our new location. You will receive a 3% discount on tuition for next year, if you pay in full by February 28th, and a 2% discount if you pay by April 15. These are increased discounts over last year, which were 2% and 1% respectively. 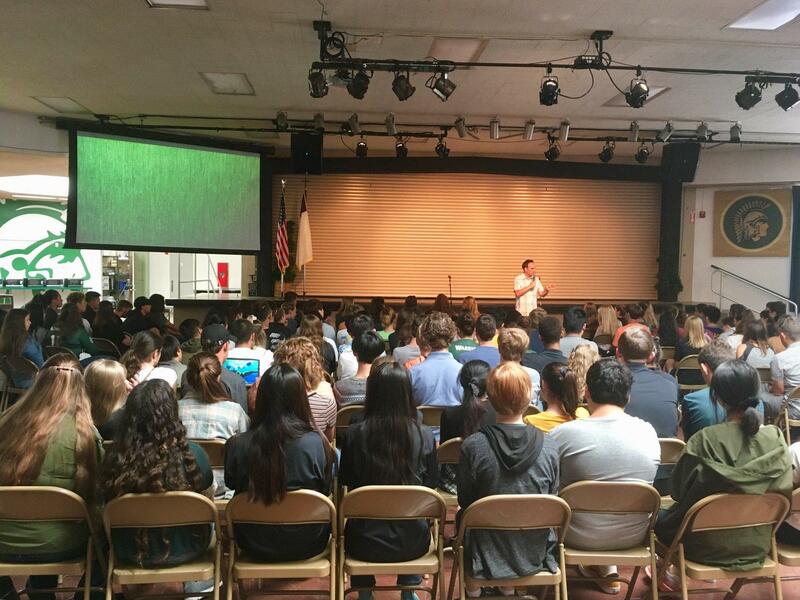 Since my first year here at Brethren Christian, I felt God’s presence constantly among the students and staff. I have been impressed with a focus and balance of teaching students to follow Christ, while also providing quality instruction. I believe God has protected and preserved this school, because He has plans for it to become even stronger and a bigger influence in the community. I am excited to see what God has in store for Brethren Christian School - a place where teachers care so much for the whole student. It has been a pleasure to be a part of this school, and I look forward to new beginnings on our new campus next year! I want to introduce Mrs. Jacqlyn Kodis, who will deliver our Options Program at our new location. 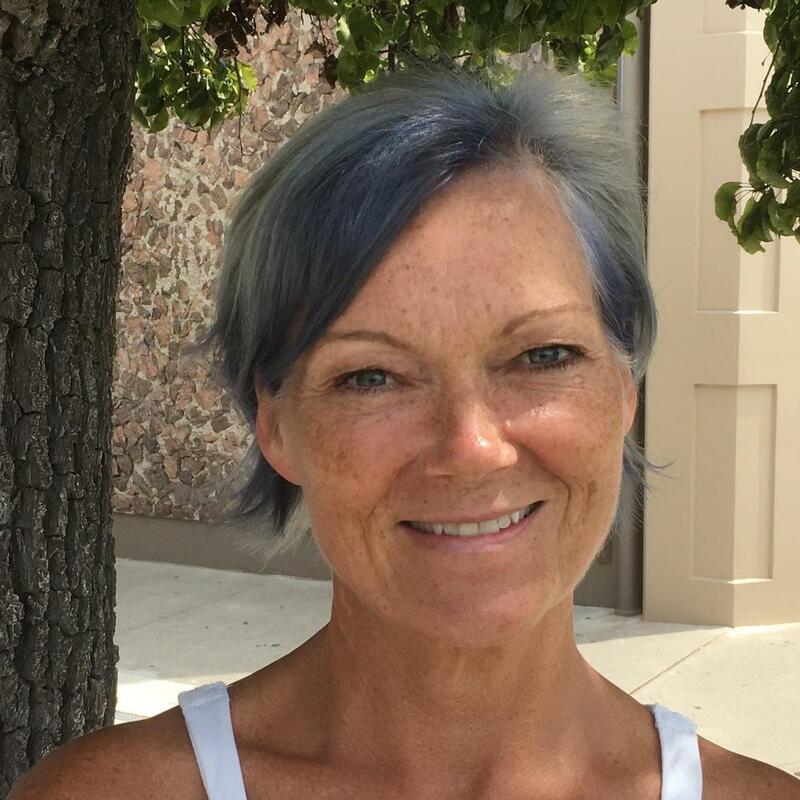 She is the current Opportunities Director (similar to Options) at Grace Lutheran, and she will continue that program for their K-8 students, while she directs Options for our High School students. We will be hiring an Options support teacher to replace Mrs. Kayla Snyder's position. Please email Mrs. Kodis directly to review your child’s academic plan for next year at jkodis@graceschoolshb.org. I am confident that you will be pleased with the skill and experience Mrs. Kodis brings to this position. You may or may not know that my doctoral dissertation is in special education/diversity, and I have delivered special education programs in three school systems. I remain committed to having a program that maintains the high level of Options programming that you have come to expect from a BC education. We are blessed to have Mrs. Kodis available to make this program available to you as seamlessly as possible. Hello! 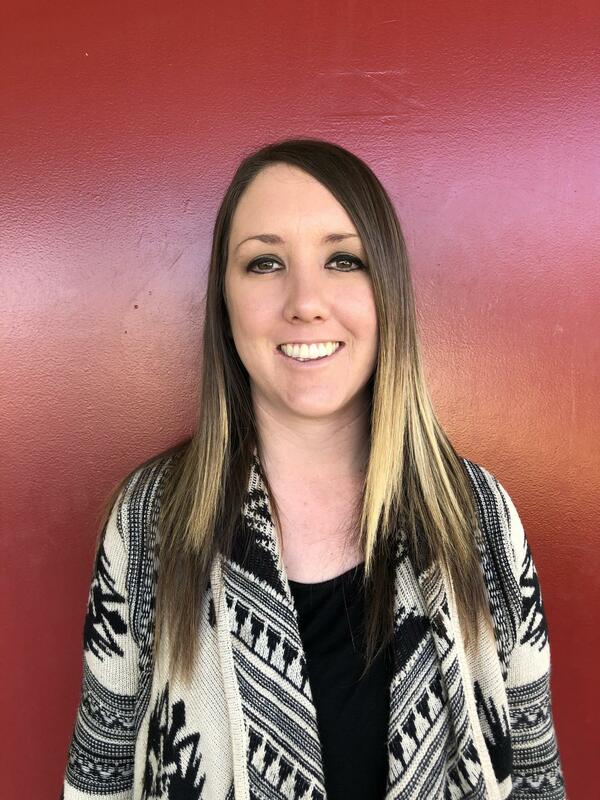 My name is Jacqlyn Kodis, and I am the current Resource Teacher at Grace Lutheran School. I have my Bachelor’s degree in Special Education and over 15 years of experience. 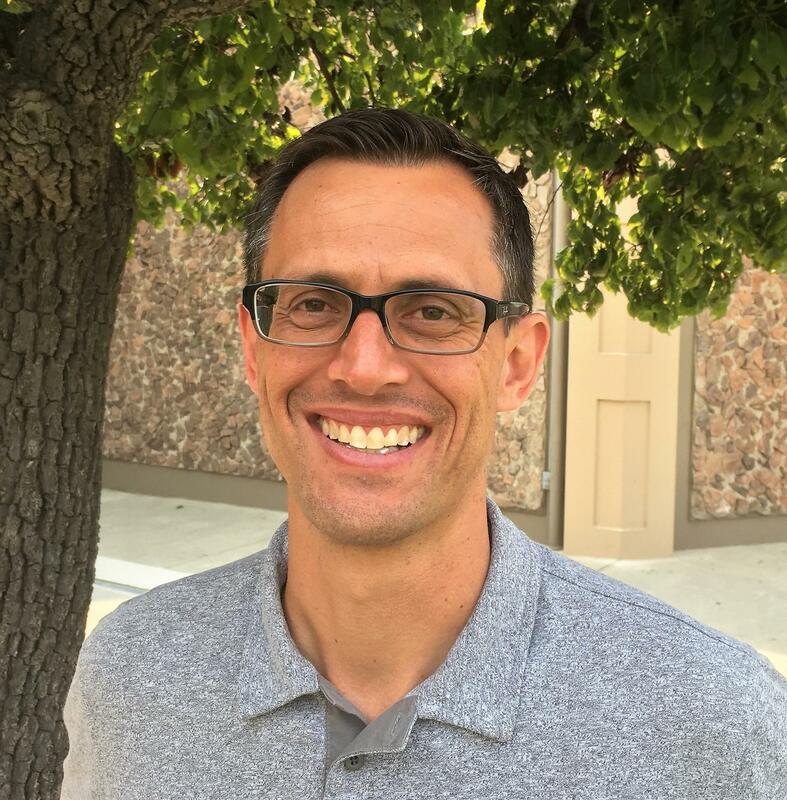 I previously worked at Brethren Christian for ten years as Assistant Director of the Options Program. My three brothers and I attended Brethren - my father did also. I am married and have one son in 6th grade. I am very much looking forward to getting to know each one of you and working with your students. Attention parents! Your student's Six-Week Progress Report will be handed out to them tomorrow (Thursday, Feb 28th) during third period. We encourage our families to ask their students to see their progress report and discuss their academic classroom experience. The first phase of our re-enrollment period ends on February 28th, so register now and take advantage of our early enrollment discount. The tuition, tech fee, and most other fees will not increase for next year, but you will receive the same quality education you’ve come to expect from BC at our new location. You will receive a 3% discount on tuition for the 2019-20 school year when you pay in full by February 28th, and a 2% discount when you pay in full by April 15th, 2019. These are increased discounts over last year, which were 2% and 1% respectively. Our Transition Teams are meeting, and the campus planning is going very well. We are coming up with creative ideas on how to best utilize the church and school campuses. Our Student Transition Team has already met once to share their ideas on how to give our new home the BCHS look and feel. Our employee and student transition teams will soon take field trips to the new campuses, so they can get a better sense of what they would like to see there. 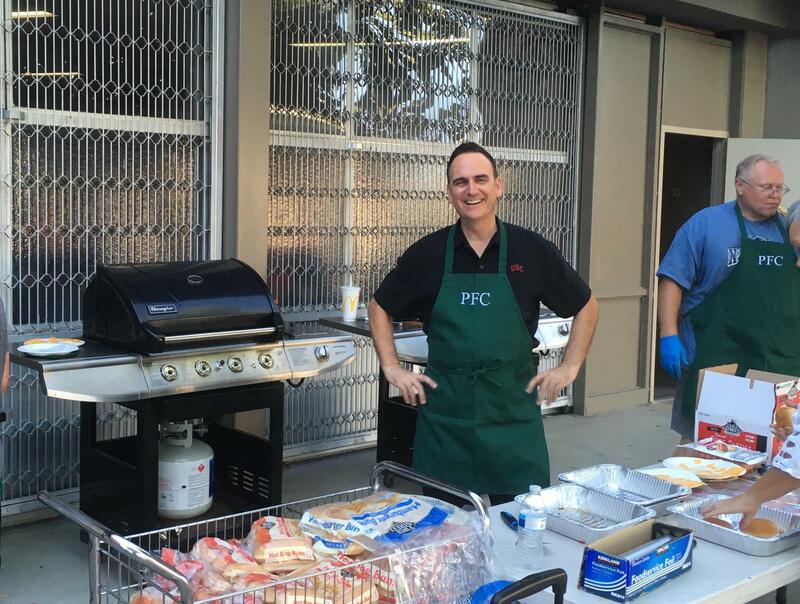 I'm grateful for God's provision of this partnership with Grace Lutheran Church and School, which provides Brethren a place in Huntington Beach for us to call home. It puts us in close relationship with a school that cares about Christian education as much as we do. I'm looking forward to continuing our Warrior tradition of excellence in music in our new location, and I hope all of my students will join us next year. Soli Deo Gloria! 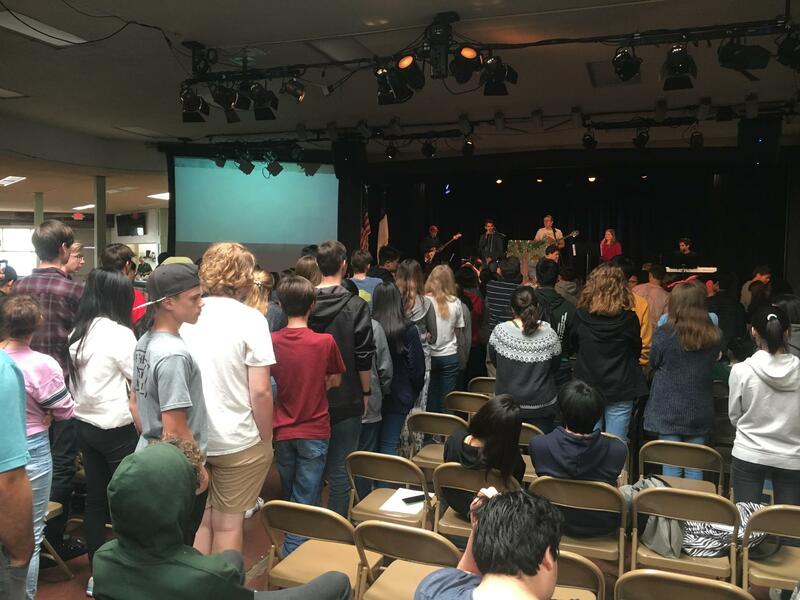 Mrs. Danielle Heffernan and her Light Team students delivered an amazing program of spiritual development for our students this week. We went out to serve our community to show the love of Jesus, and this theme of service permeated the entire week of chapels. Today culminated with four of our amazing students bringing the Word to their classmates (Chloee Booth, Paige Savoy, Ben Timblin and Mike Contreras). We ended in a special time of prayer with staff and students, and it was evident that the Holy Spirit was at work among us. This week underscores the foundation of BC, which is Jesus Christ. HE is the reason we exist and persist in the work of the gospel through our school ministry. Praise be to God! 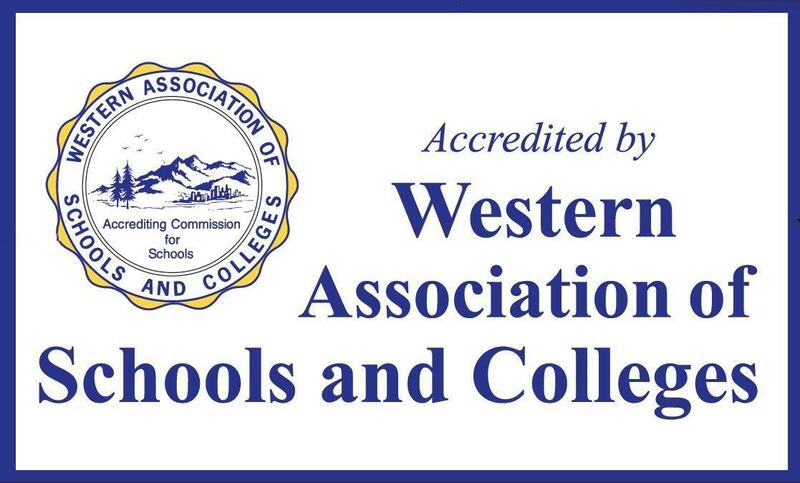 We have just received official notification that we have been awarded another 6-year accreditation period from WASC/ACSI, which is the longest period they grant a school. This is a credit to the teachers and staff, who create the high level of excellence you have come to expect from a BC education. To God be the Glory! Information for each of these events can be found on our website Homepage either under the "Our Latest News" section, or on the Calendar. The PFC Board in concurrence with BC administration has decided to cancel this year’s Color Run due to all the focus needed on our upcoming campus move. We are sorry to disappoint all that were looking forward to this fun, BC-community building event. We are embarking on plans to have the Color Run in the fall of the upcoming school year in a combined effort with Grace Lutheran. 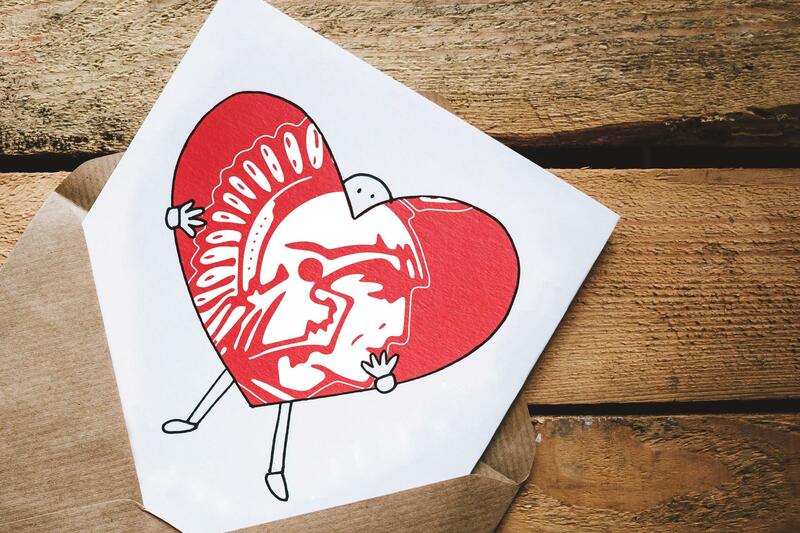 We would like to see the fall event be a celebration of our two schools coming together in a new way to support Christian education, and to rejoice together for our new campus, the new school year, and our good health! Most of our athletic coaches are also returning. I regret to inform you that Jann Martes, Kayla Snyder, Marian Mine and Dorothy Heinz have decided not to come back next year due to their own personal reasons. Darrin Smith will not be returning, because we will only need one science teacher next year. I cannot thank each of them enough for their contributions to BC, and they will be sorely missed. I am sure we will have parties for them at the end of the year, but please share your love with them now as well. We will continue our Choir and Options programs in full force, and we are currently in discussions with potential employees to carry on the great work of these programs. Let us thank the Lord that the majority of our wonderful staff will be staying with us, which will maintain our high level of stability and excellence at BCHS. This update is longer than usual due to the many activities taking place right now, but all of the information is important and timely, so please take the time to read it through. It’s a great time to be a Warrior, so let’s thank God for all He is doing in our midst! Much progress has been made since we made the announcement of our campus move a couple of weeks ago. Our Town Hall meeting at BC on Monday of last week was well attended. 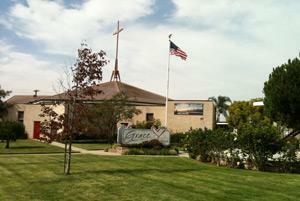 I presented a PowerPoint over-viewing the move to the Grace Lutheran campus. You can visit our FAQ page for details on the moving process at www.bchs.net/movetograce/ and you can view the PPT on our website. Many parents expressed their support of BC and their intention to move with us to our new location. Parents also asked excellent questions – some of which the board and I could answer directly and others that we will be able to answer after more transition meetings. Our transition team will be working diligently to iron out the many details of the move. Our Town Hall meeting at Grace Lutheran on Tuesday of last week was also a great event for both schools. Both communities had time to hear from each other and to ask questions about the move and the cooperation between our schools. I believe we began to build a joint sense of community at this meeting that will bode well for the future. 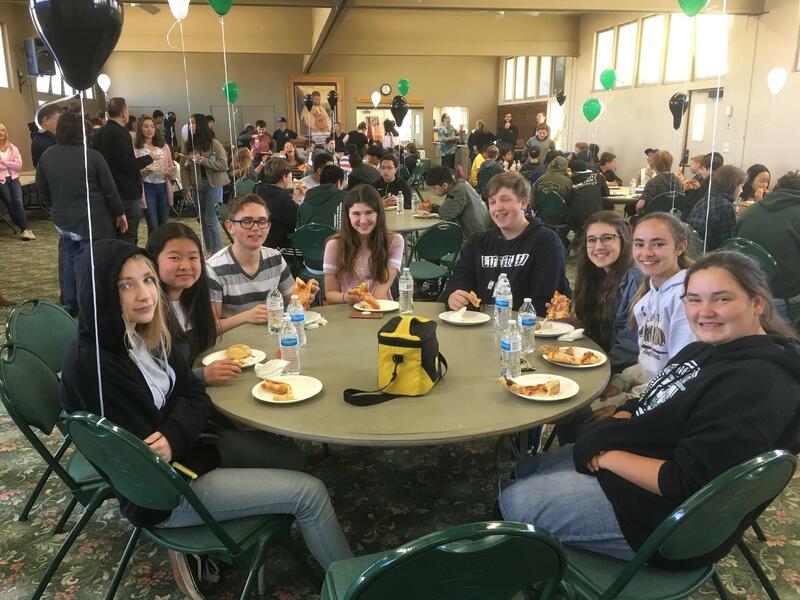 On Wednesday, February 27th our current 7th grade BC students and their families are encouraged to attend a luncheon at the Grace Lutheran campus to visit teachers and their facilities during the day, and have an In-N-Out lunch together with the Grace staff, faculty and families. We are invited to visit their campus at 11:30am and celebrate this promising opportunity together. Please contact BC Admissions Director, Mr. Shawn Thomas, directly at shawnthomas@brethrenchristian.org for any questions, or to reserve a spot on this field trip. 7th grade parents and students are welcome. Stay tuned for more meetings, updates and open houses in the near future. In the meantime, don’t hesitate to contact me directly with any question you may have at jmoran@bchs.net. On behalf of our board, teachers and staff, let me thank you for the outpouring of support of BC during this time of transition. It’s an exciting time of positive change for our school, so let’s enjoy the adventure together! Our school calendar for next year will remain largely unchanged from what we have already published on our website. We will start 3 weeks before Grace Lutheran, which will give us time to settle in before both schools fill out the campus after Labor Day. Our school day will most likely begin at 7:50AM to allow for a smooth flow of traffic during drop off, since the Grace Pre School (PS) and Elementary School (ES) start at 8:00AM and 8:10AM respectively. We are carving out the BCHS portions of the campus in productive meetings with Grace, and we will basically be located in the front half of the campus with Grace PS and ES in the back half of the campus. We plan to install several portable buildings to accommodate classroom needs for both schools. We may utilize some space on the church campus if needed, but that has not yet been determined. We are assessing our bussing needs, so please email Shawn Thomas at sthomas@bchs.net if you desire bussing next year. Please include your address in the email and how many students in your family will need bussing. A group of students have formed a Student Transition Team to help make our section of the new campus look and feel like Brethren next year. This was under their own initiative, which shows the leadership qualities of our students and their love for BCHS! The BC Playhouse will be performing the classic musical Godspell March 1st, 2nd, 8th, and 9th! The show begins at 7pm and student tickets will be $10 and adults $15! Tickets can be purchased online! Come support your fellow classmates and enjoy another amazing BC musical. Did you know that Brethren Christian School has a connection with Duke University that allows our students to access their summer educational programs? 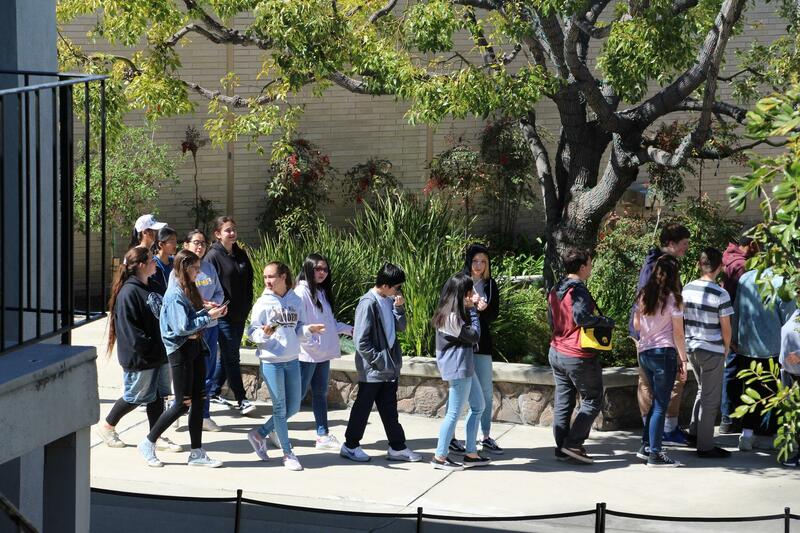 They have a number of different types of summer programs available, and it may help you earn college credit whether you are a sophomore, junior or senior. Visit the page description and check with Ms. Flippin, our Academic Dean, to see if you are eligible for any of these programs. 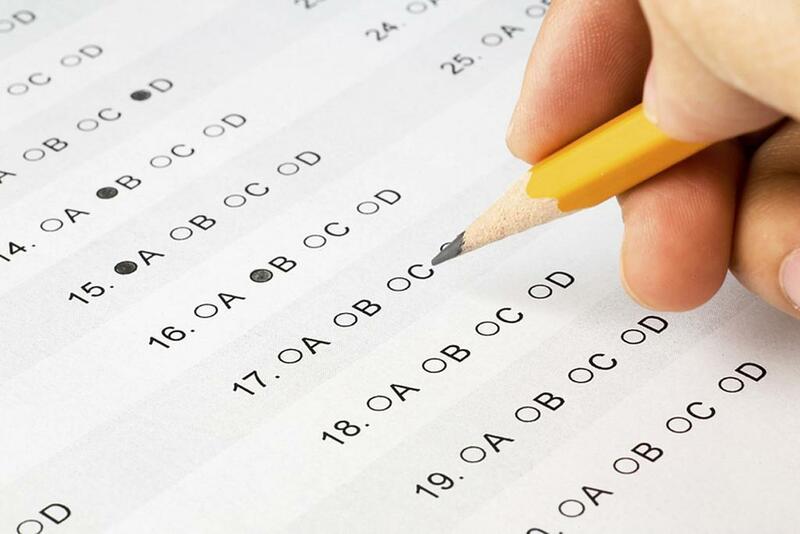 On Saturday, March 23rd from 9am - 1pm we will be hosting the SAT/ACT Practice Exam with the Catalyst hybrid program. This is a great opportunity to get experience in a simulated testing environment and stay ahead of the game. For more information, visit our Practice Exam event page or call 800.235.0056, or email info@CatalystPrep.com. Our Third Annual Color Run is coming up on April 6th, 2019, but we need to start planning for it now, and there are plenty of ways that you can help. Visit our Color Run Sign-Up web page and choose a committee of which you would like to be a part. There is space for: setting up and cleaning, setting up the Chili table, coordinating the color run activities, and advertising for the event. Please go and sign-up for something today! The PFC leadership is working hard to make this a fun and successful event for our community, so please support them in this effort. Thank you SO much. 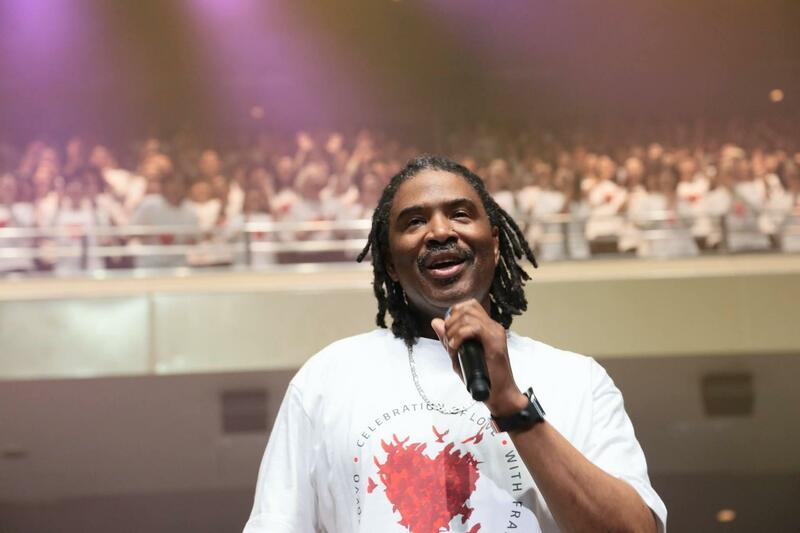 Award-Winning Gospel singer, Ray Sidney, and the Firm Soundation Band, will be leading our BC Gospel Choir in some energetic and uplifting Gospel Music. Come rejoice with the whole community this Friday at 7PM in our Mall. Tickets are $5 and can be purchased online or at the BC front office. 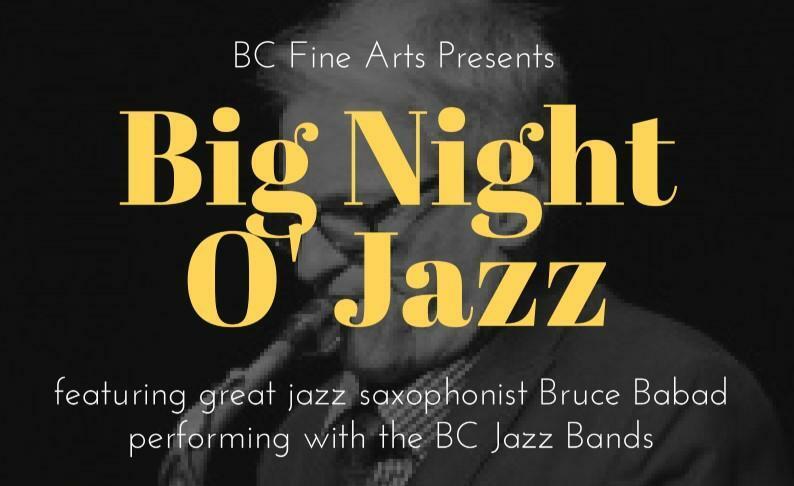 You won’t want to miss this musical event featuring jazz saxophonist great, Bruce Babad, performing with the BC Jazz Bands on Friday, February 22nd at 7PM in the Mall. A table for 4 with light food and beverage service is $100, and General Admission is $7. You can purchase tickets online or at the front desk with Mrs. Heinz. Our Spiritual Emphasis Week kicks-off with BC Blitz next Monday, February 11th. Students will come to campus at 8am as usual, and after some prayer and instruction, groups of students will travel to locations in the surrounding community to serve and bless the people of our neighborhood. This is our way of living out the gospel message of serving the poor by blessing those around us, and saying "thank you" to the Orange County community. Students will be back on campus to be picked up by their families at 12:30pm. The school bus will leave BC at 12:45pm, so please plan accordingly. 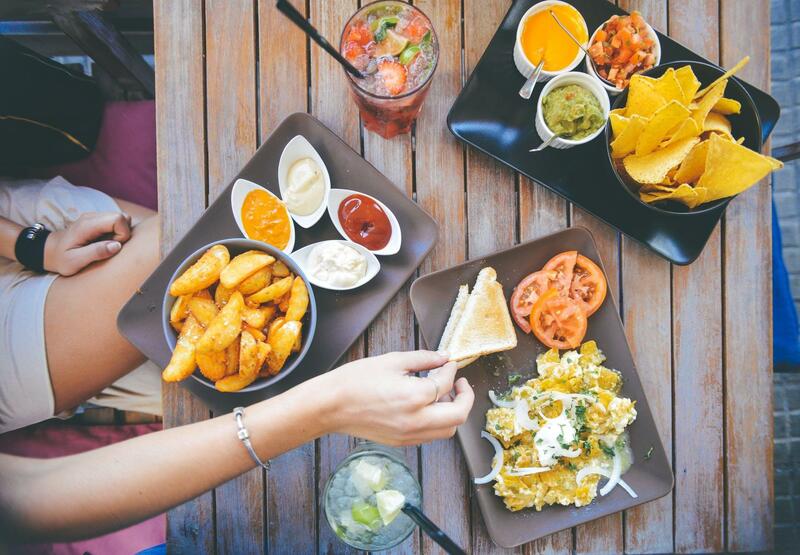 Students should bring lunch (or money for lunch), as we conclude the day by eating together. If any parents would like to volunteer, please contact the front office at 714-962-6617. I want to give a special thanks to Mrs. Heffernan for planning a great week of spiritual growth for all of our students. Send a song to a loved one to celebrate Valentine's Day! The sign up sheet is in the front office, or you can go online and fill out the form and pay the $5.00 song fee. For multiple songs and Valentine requests, simply fill out multiple request forms. Your song(s) will be delivered to your Valentine during class on February 13th! Our re-enrollment period began last Friday. You can enroll online via our website at www.bchs.net/reenroll/. We are offering a special discount on re-enrollment for the month of February at only $199. The fee goes up to $550 on March 1st. So, if you re-enroll in February, you will save $351 on the re-enrollment fee. Tuition, the tech fee, and most fees will not increase for next year, but you will receive the same quality education you’ve come to expect from BC at our new location. You will receive a 3% discount on tuition for next year, if you pay in full by February 28th, and a 2% discount if you pay by April 15. These are increased discounts over last year, which were 2% and 1% respectively. 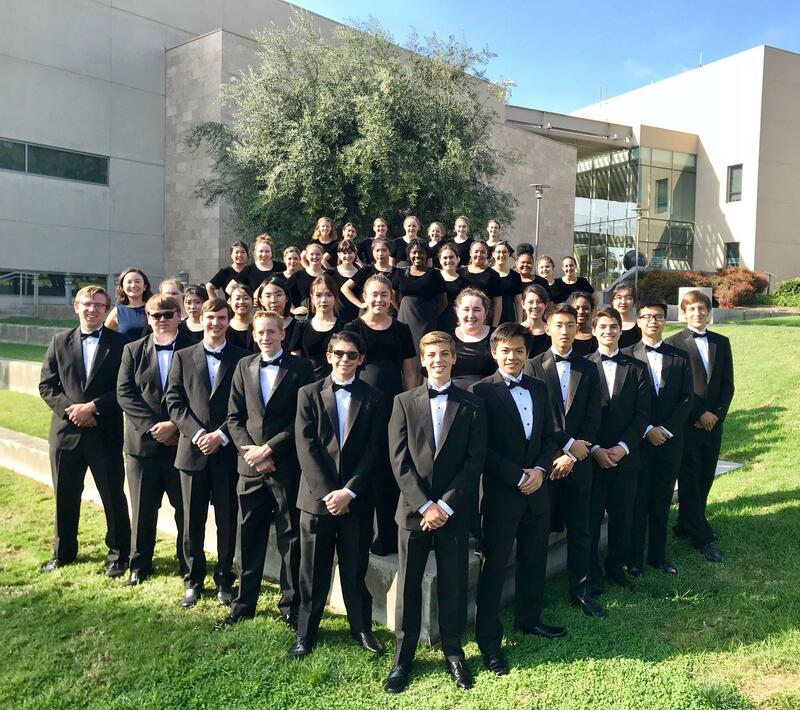 Nineteen of our students have been selected for the ACSI Honor Band! Mr. Montgomery will accompany them to this wonderful growth opportunity today and tomorrow. To have so many students selected from our small school is a prime example of how we perform out of proportion to our size. Kudos to Mr. M and to all of the exceptional musicians selected! Our Boys Varsity Basketball Team lost a close game in the first round of the CIF Playoffs last night. Congratulations to Coach Jefferson, and the whole team for making it to the playoff rounds. It was a great season, and our team improved every game under the leadership of our exceptional coaching staff. Our re-enrollment period begins this Friday, February 1st. You can enroll online via our website at www.bchs.net/reenrollment/. We are offering a special discount on re-enrollment for the month of February at only $199. The fee goes up to $550 on March 1st. So, if you re-enroll in February, you will save $351 on the re-enrollment fee. Tuition, the tech fee, and most fees will not increase for next year, but you will receive the same quality education you’ve come to expect from BC at our new location. You will receive a 3% discount on tuition for next year, if you pay in full by February 28th, and a 2% discount if you pay by April 15th. These are increased discounts over last year, which were 2% and 1% respectively. On behalf of the BC Board of Trustees, I am happy to announce that we have secured a new location for our school! We will be moving to the Grace Lutheran School property and sharing their campus beginning with the 2019/20 school year this coming August. 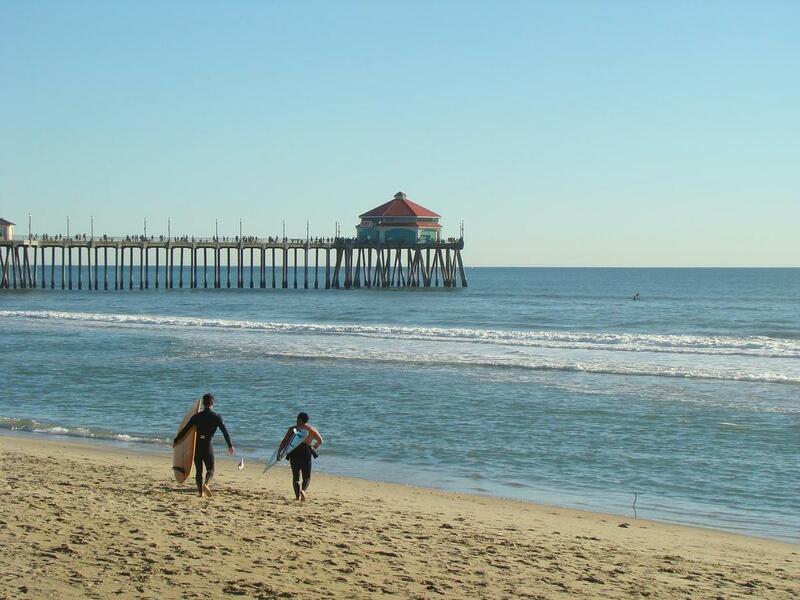 They have two campuses that we will utilize, and both are in Huntington Beach. 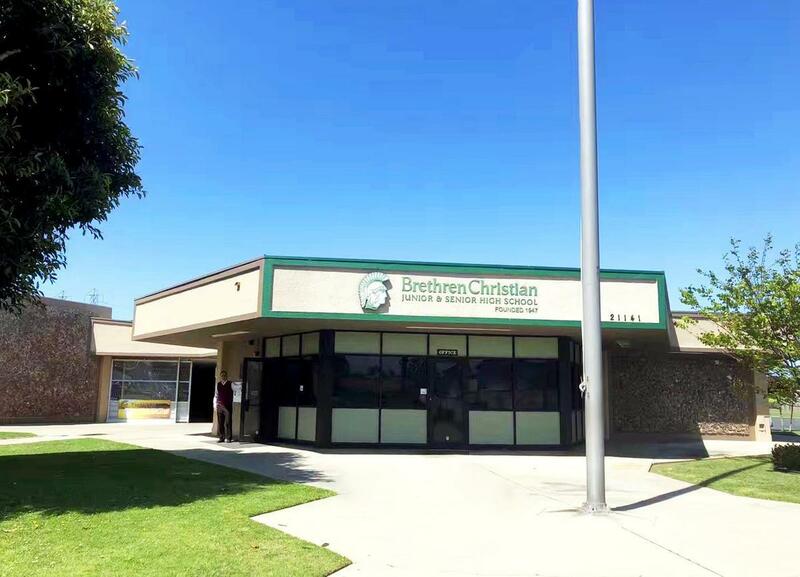 The main school campus is located at 5172 W McFadden Avenue, and the Church/school campus is located at 6931 Edinger Avenue. 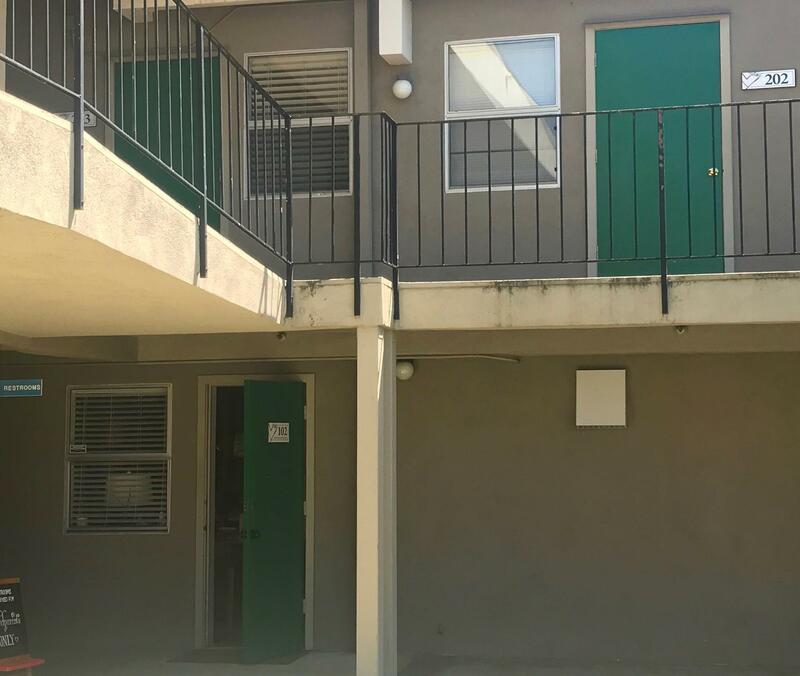 The Huntington Beach City School District (HBCSD) will reclaim our campus for use in their Measure Q building renewal project in the summer of 2020. While we appreciate that time frame, we are blessed to have secured a campus solution one year early. This move will be an enormous savings in facilities costs, and we will realize those savings a year in advance of our projections. 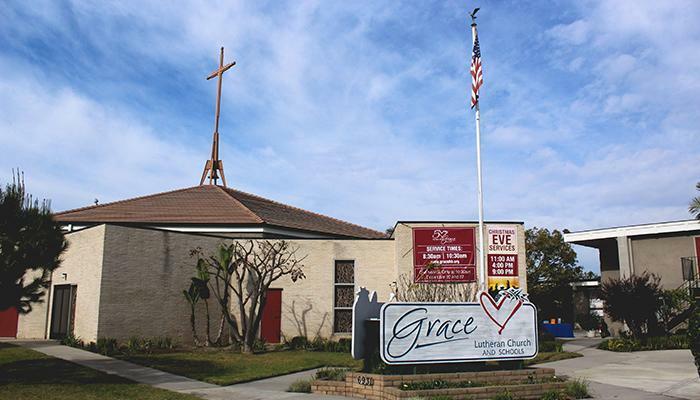 Grace Lutheran operates a PK-8 school on the McFadden campus. BC Junior & Senior High School will become BC High School (BCHS) next August. 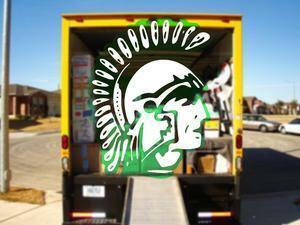 We will operate primarily on the McFadden Campus, and secondarily on the Edinger campus if we need extra space. BC has been losing enrollment in our middle school grades for some time, and we were phasing out one grade per year. The timing of this move has led us to eliminate our 7th and 8th grades simultaneously for next year, and to complete our transition to a high school in conjunction with our move the Grace campus. BCHS will remain its own school and work in mutually beneficial cooperation with Grace on the same campus. 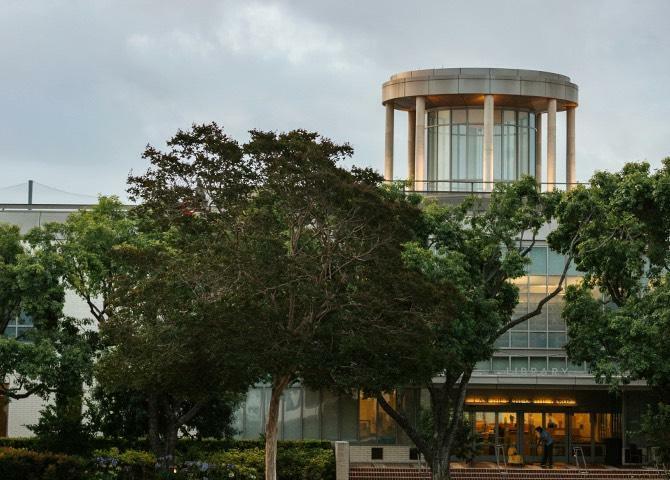 This is not a school merger – it is a campus move. With that said, there will be synergies and efficiencies that will benefit both ministries, and we will cooperate for the betterment of both schools. 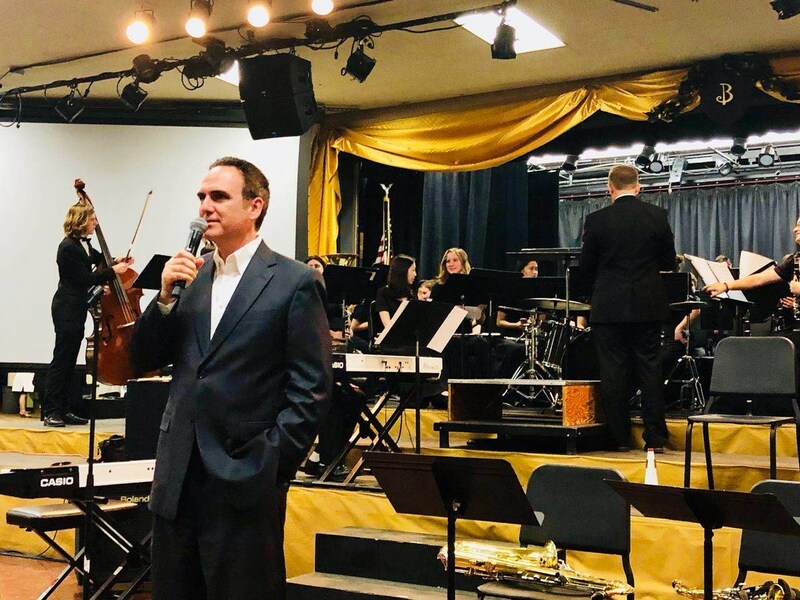 One example would be that both Grace and BCHS students could join the BCHS band, which would bless Grace students and strengthen our band program. 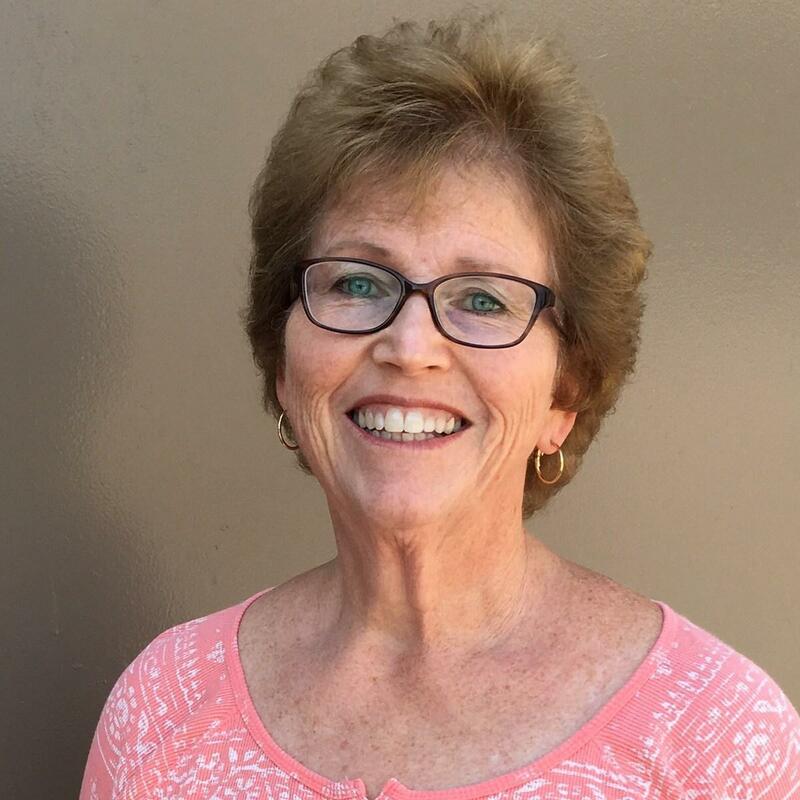 I wanted to share what the Grace Lutheran Principal, Mrs. Jean Kucucarslan, has to say about our move to their campus: "Part of our mission and vision at Grace Lutheran Church & School is working together with other followers of Jesus within our community for the sake of our wider neighborhood. 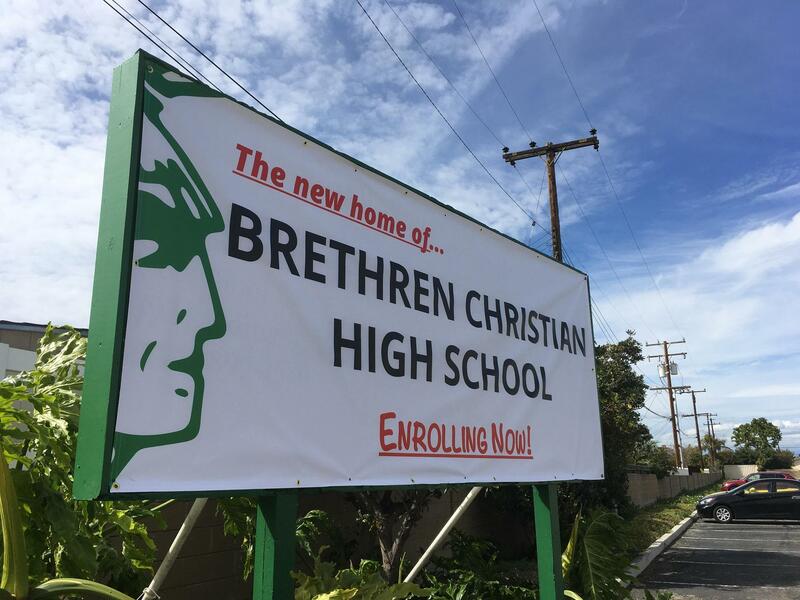 We are grateful the Lord has led us into this promising relationship with Brethren Christian, a vibrant and dynamic school dedicated to academic excellence and positive character development to the glory of God for over 70 years." 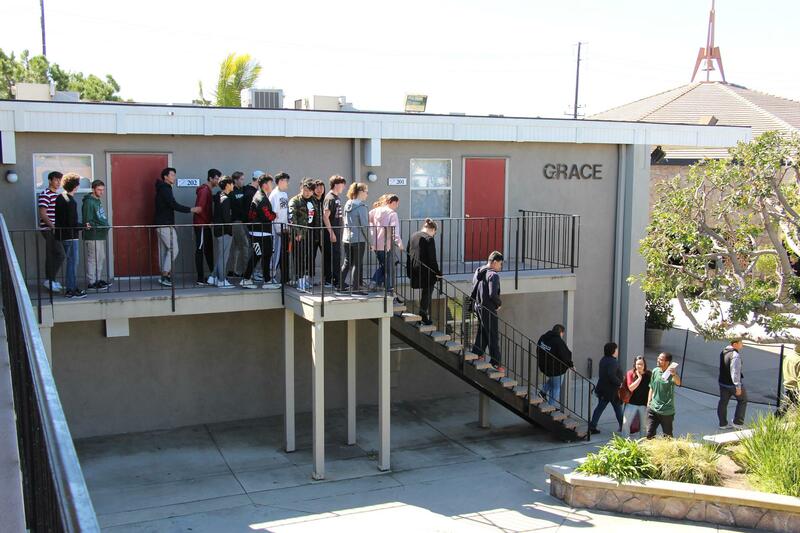 We encourage our current 7th graders to enroll in Grace’s 8th grade class for next year. 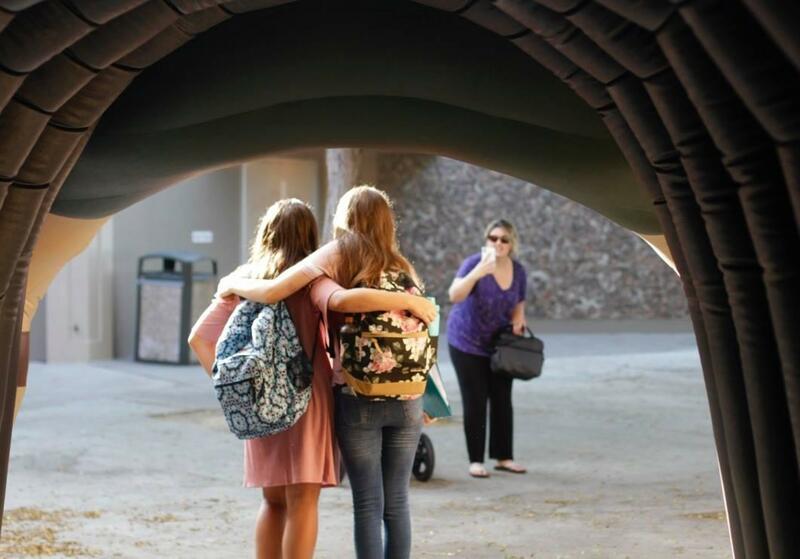 We believe this will be the best way for your children to remain connected to BC and to smoothly transition into our 9th grade the following year. 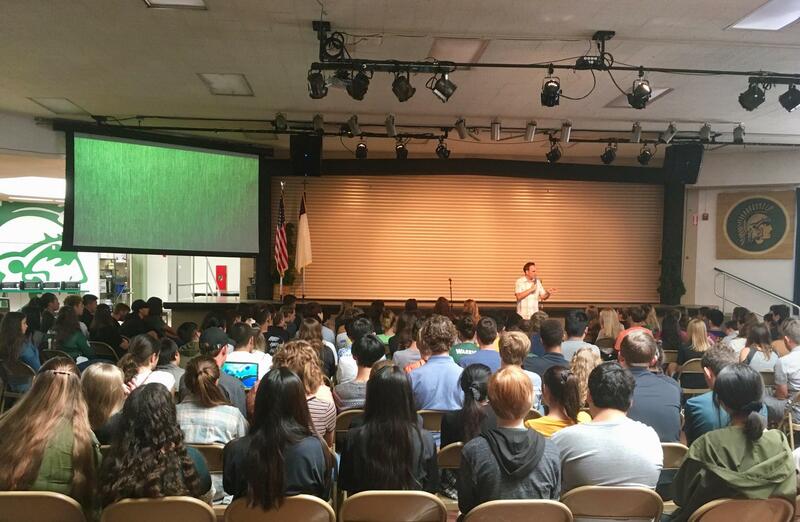 Grace will be encouraging their 8th graders to enter BCHS in 9th grade, which will grow our freshman class. All 8th graders will pay the Grace tuition rates. Please contact Mrs. Ivy @ livy@graceschoolshb.org for tuition rates and an application. There are many details to follow, and you no doubt will have many questions. Please come to our Town Hall meeting in the BC Mall at 7PM on Monday, January 28th and/or Grace Lutheran School Multi-purpose room at 5PM on Tuesday, January 29th. You will also be invited to Town Hall meetings and Open Houses in the coming weeks and months to learn more. Please contact me directly at jmoran@bchs.net for any questions, or make an appointment to meet with me by contacting Mrs. Dorothy Heinz at dheinz@bchs.net. Let us rejoice together in what the Lord is doing! We thank God for providing the path forward for BC long into the future. On behalf of our board, teachers and staff, I thank you for your support of BC. As we begin our 72nd year, it is so heartening to know that we have a bright future ahead of us! Please pray for both schools as we enter this exciting new cooperation to strengthen both ministries. Thanks to everyone for their prayers, notes and phone calls last week to check in on me, while I was out with the flu. It meant so much to me. The school board has made a decision on our campus move for next year, and I will announce the results of that decision this Friday via email. It has been a time and labor-intensive process to get to our decision, but we believe you will be happy with the results. We are putting last minute touches in place before we make the announcement, so thank you for your patience. 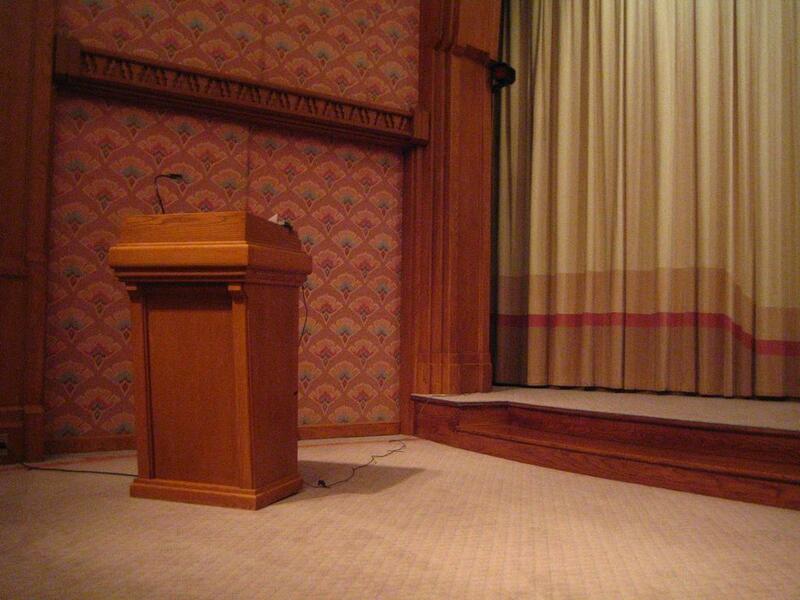 likely that we will have another Town Hall on Tuesday of next week, so please try to keep that evening open as well – details to follow. God bless you and God bless Brethren Christian School! Welcome back to a new year at BC! We are already off to a great start for Semester II, and we have welcomed several new students to our ranks. Our exceptional Business Manager, Kimberley McGovern, will only be in the office on Friday's from now on. She will continue as a consultant in the role of Business Manager, and will be working from home on M-TH. She will be in our office each Friday from 8-3:30PM. You can still drop off payments in the office anytime. You may reach her by email at kmcgovern@bchs.net. Please remember that we are off next Monday for Martin Luther King Day. Stay tuned for important updates about the future location of our school. Blessings, and let's make this a fantastic year in Christ! As we come to the end of our first semester, I think we can all agree that this has been a great school year thus far. Folks have loved the block scheduling and the Chromebooks. Our new calendar allows students and staff to go into the three-week Christmas break knowing that final exams are in the books. We’ve had great performances on the field and on the stage. Our teachers are receiving more training, and they are able to go deeper in each subject with the longer class periods. Most importantly, students have grown in the knowledge and grace of our Lord and Savior, Jesus of Nazareth. We will be closed this Friday, and we will reopen for Semester II on January 14th. 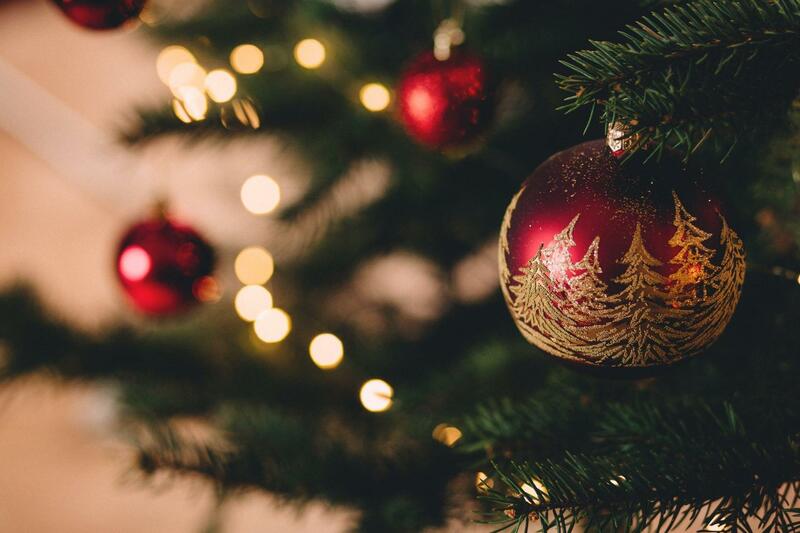 Our offices will be closed during the break, but you can still reach most of us via email for any time-sensitive issues. Re-enrollment will begin on February 4th. We are pleased to announce that we will have no tuition increases next year. Be sure to re-enroll in February, since we are lowering our re-enrollment fee to $199 (a $100 decrease from last year). The fee goes up to $550 after February, so enroll early. 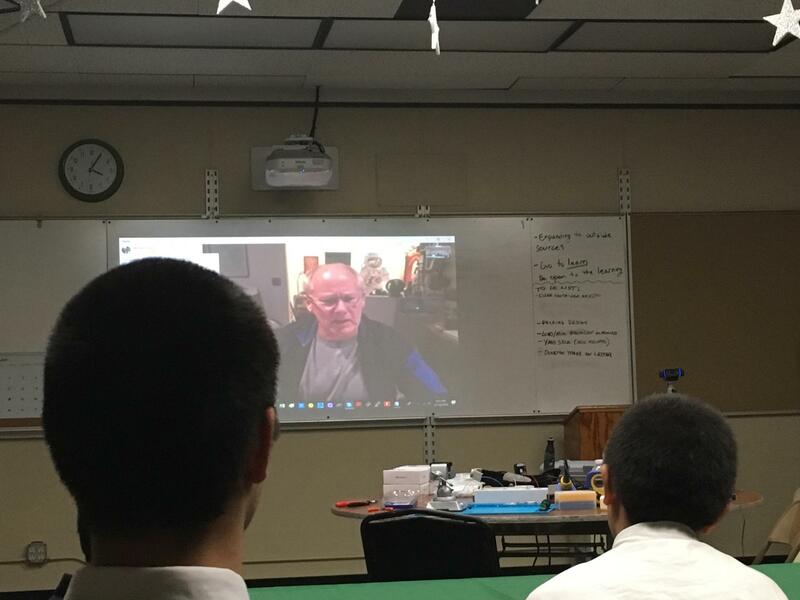 On Tuesday, the 18th, BC International Space Station ISS students had an amazing opportunity to speak with Andy Aldrin, son of famed astronaut, Buzz Aldrin, one of the first men on the moon. The team presented their final experiment to him, and the press was on hand to document their presentation and Skype conversation with Dr. Aldrin. The completed experiment will undergo NASA review soon, and it will launch to the International Space Station on April 6th for implementation in microgravity. Kudos to our ISS students for their successful first semester, and God’s speed in 2019. And in the same area there were shepherds living in the fields, keeping watch over their flock by night. And then an angel of the Lord appeared to them, and the glory of the Lord shone around them, and they were very afraid. But the angel said to them, “Listen! Do not fear. For I bring you good news of great joy, which will be to all people. For unto you is born this day in the City of David a Savior, who is Christ the Lord. And this will be a sign to you: You will find the Baby wrapped in strips of cloth, lying in a manger. Final Exams are scheduled for December 17th – 20th. You can visit the Latest News section of our website to download a PDF of the Finals Schedule. We will dismiss students at 2:20PM on Monday, December 17th and at 2:35PM on Tuesday, December 18th. The bus will depart at 2:45PM both days. We will dismiss students at 11:30AM on Wednesday and Thursday, December 19th and 20th, and the bus will depart at 12:10PM on those days. Please note that lunch will NOT be served on the 19th and 20th. 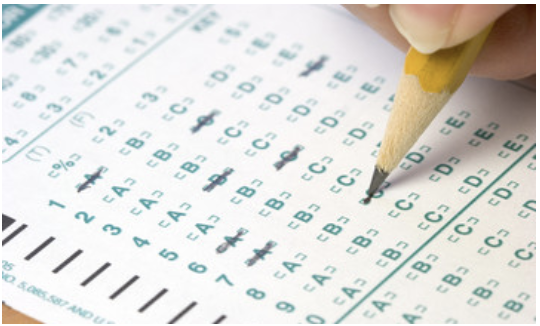 All 9th-11th graders: Your PSAT/NMSQT scores are ready online. You'll get an email with instructions on creating your College Board account, going to your online score report, and using your access code to view your scores. A fundraiser for the BC Japan Mission Trip will take place on December 20th at Rubio’s off of Brookhurst from 5:30PM to 8:30PM. Bring in this BC flyer when you make a purchase, and our students will get 50% of the proceeds. Thanks in advance! Our Third Annual Color Run is coming up on April 6th, 2019, but we need to start planning for it now, and there are plenty of ways that you can help. Visit our Color Run Sign-up web page and choose a committee of which you would like to be a part. There is space for: setting up and cleaning, setting up the Chili table, coordinating the color run activities, and advertising for the event. Please go and sign-up for something today! The PFC leadership is working hard to make this a fun and successful event for our community, so please support them in this effort. Thank you SO much. Please remember to give whatever amount you can to BC by December 31st. This will help your children’s education, and you will get a tax deduction from Uncle Sam. We accept checks and credit cards. Contact our Business Manager, Ms. Kimberly McGovern, for details. God bless you as you give. Thank you! We had a fantastic open house last night with a mix of current and prospective families. The teachers presented the great things they and their students have done in the classrooms this semester. Mr. Montgomery and Ms. Mine led their bands and choirs in rousing performances all evening. Our Athletics, Arts and Space Programs presented their many accomplishments as well. I want to thank the Parent Fellowship Council, the teachers, staff and students for making this Open House one of our best ever! 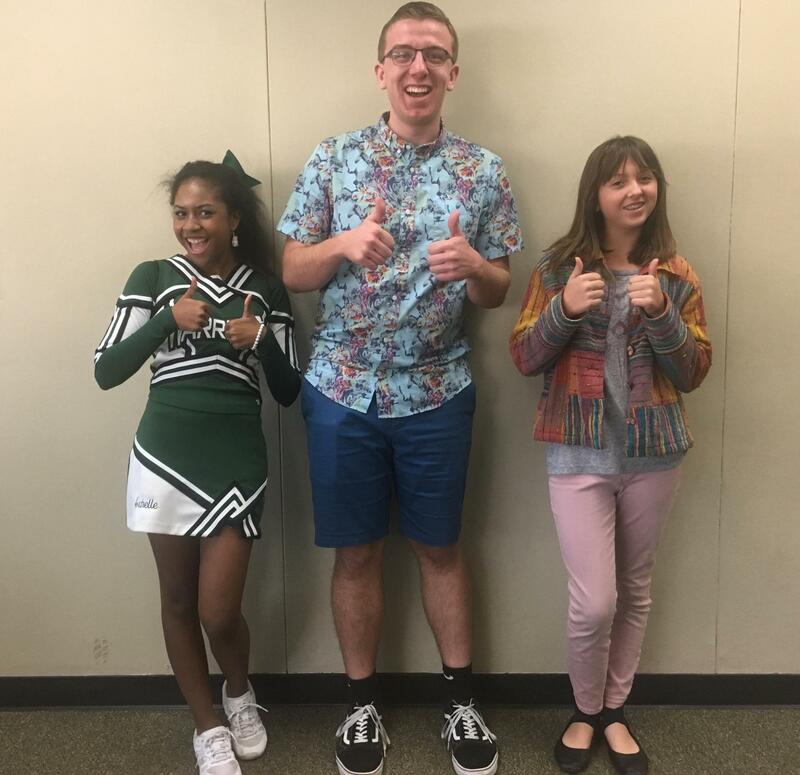 Congratulations to our BC choir students, Sam Skarin (12th), Michelle Mumia (12th), and Kate Johnson (9th) for being selected to participate in the annual Southern California Vocal Association Honors Choir for 2018 hosted at University of Redlands! 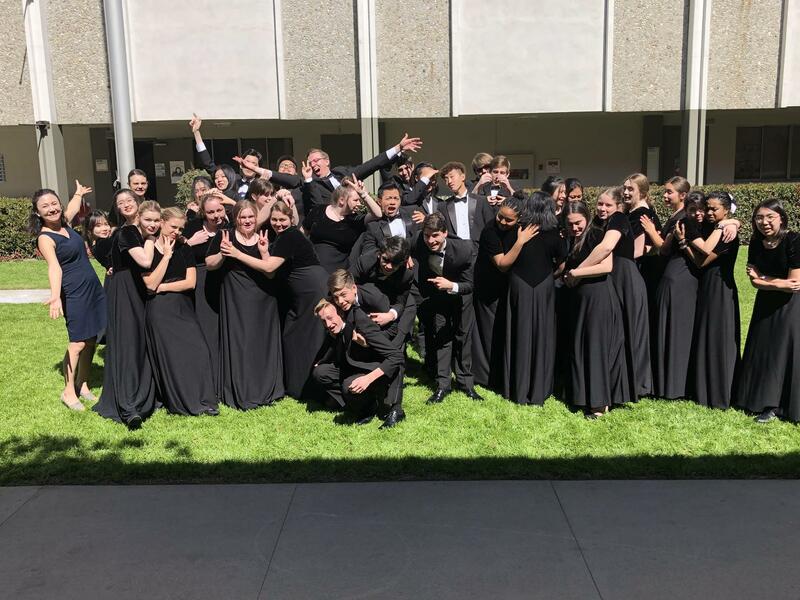 As in previous years, the students were able to work with choir students from across Southern California under the direction of amazing guest conductors. I am so proud of these students, and we are thrilled that they were able to have this growth experience. Kudos to Ms. Mine for helping these students develop into award winning performers. 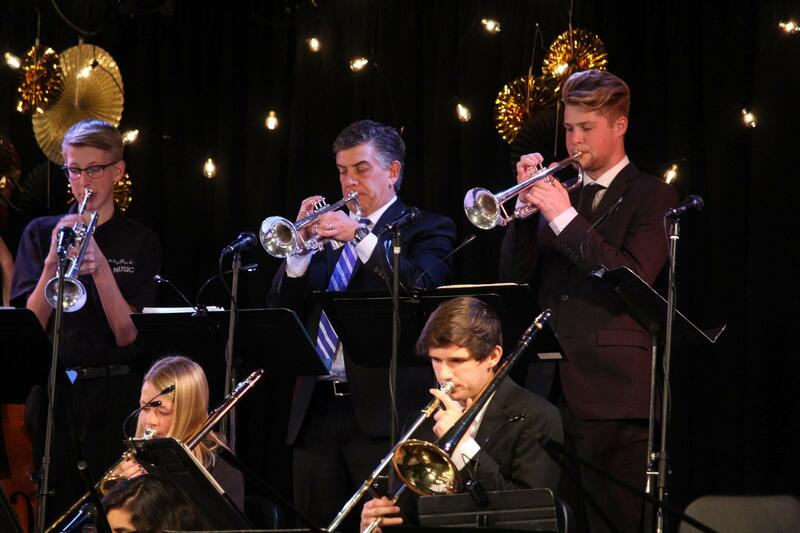 Our annual Christmas Concert is coming up on Saturday, December 8th, so please purchase tickets in the front office, or go to http://www.bchs.net/festivalofchristmas/. Tickets are selling fast and seating IS limited, so please get your tickets today. Merry Christmas! We had our football banquet this week, and it was a time of great celebration. I am so proud of Mrs. Whitmire, Coach Green and Coach Duren for bringing godly character back into our program. These coaches worked with an amazing group of young men to bring the best out of them both on and off the field. They have made us all proud. We look forward to a great season next year, as we only had one senior on the team. Go Warrior Football!!! We have had some questions regarding the process of requesting extended time off for students. Please contact Ms. Flippin or me with a formal request and reason for the extended absence, including all dates and times. It is the students’ responsibility to check Canvas and communicate with their professors about assignments that might be missed. Thank you. Mrs. Stone no longer works at the school, so we thank her for her years of service, and we wish her well. Her position is not being refilled at this time, but we are covering her duties, so there will be no lapse in service. Please contact me if you have any questions about services related to your child. Thank you. The BC Winter Semi-Formal is this Saturday, December 1st for high school students. Our event will be from 5PM to 8PM at Riverbed Farm, 1426 East Vermont Ave, Anaheim, CA 92805. Let’s take this time of Thanksgiving to give God the glory for all He has done, is doing and will do for our school community. On behalf of our board, staff and teachers, I wish you all a happy, safe and blessed Thanksgiving season…. 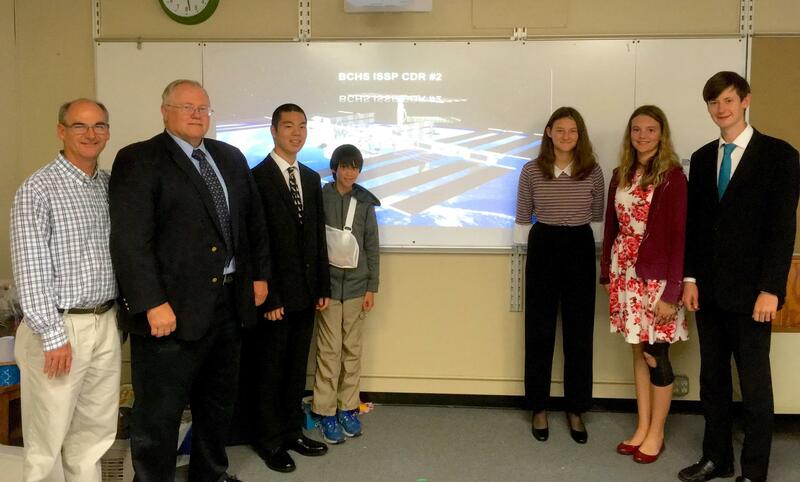 BC International Space Station Program In The News! 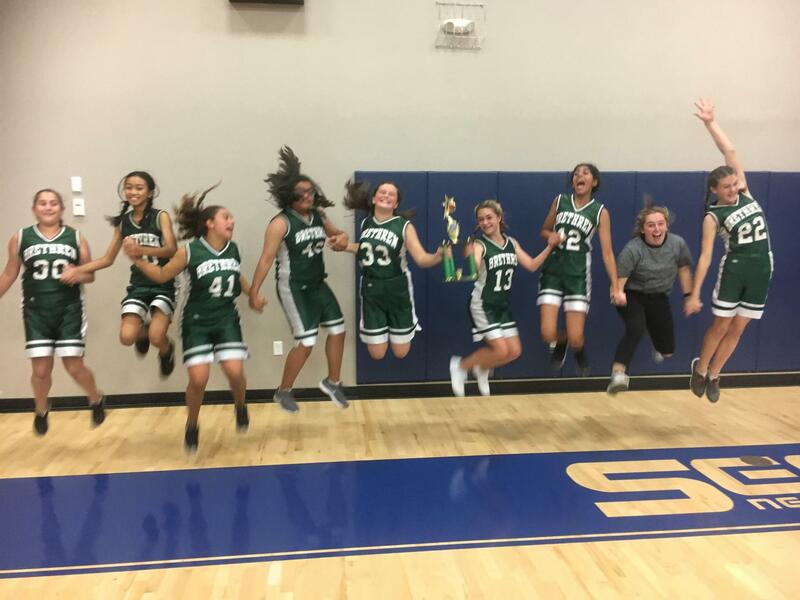 Congratulations to our Lady Warriors for their 2nd place finish in their league. They fought hard in the championship match and made us all proud. Kudos to Coach Sierra Whitmire and all the players for a having the highest ranked team at BC this year thus far!!! 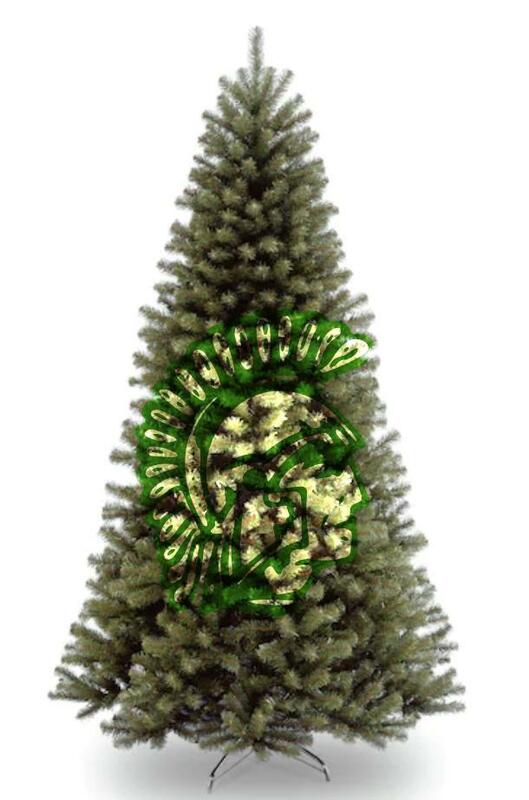 The Athletics Department is doing a fundraiser, where you can purchase Christmas trees or wreaths or other ornaments! You can bring in your money and purchase form to the front office, and we’ll give you a coupon to pick up your tree! A portion of the proceeds will go to support the BC Athletics Program. Thanks in advance for your generous support. We started the club this year to build cultural competency and to foster relationships between all students of BC. Our latest meeting deconstructed cultural stereotypes. This effort helps both international and domestic students grow in their global perspectives and in their understanding of themselves and others. BC has another Dine-Out event this month on November 29th for the entire day. Please go to the Corner Bakery on Brookhurst in Fountain Valley, and tell them you are supporting BC - and 15% of sales will go to our school! 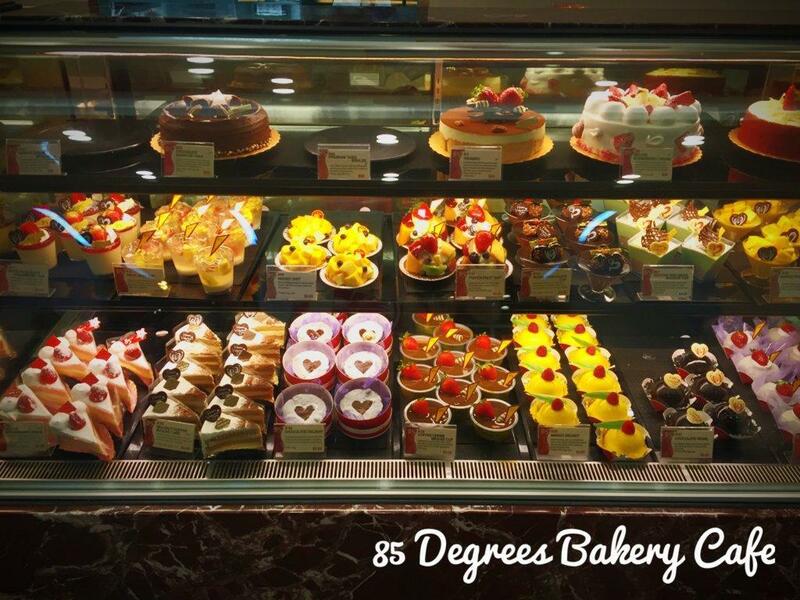 You can stop by before our Open House event, or go right after (they close at 9pm) to get an awesome dessert. Our annual Christmas Concert is coming up on Saturday, Dec. 8th. There will be a number of performances and great classic Christmas songs. Tickets are $5 and you can buy them at the front office or online at http://www.bchs.net/festivalofchristmas/. 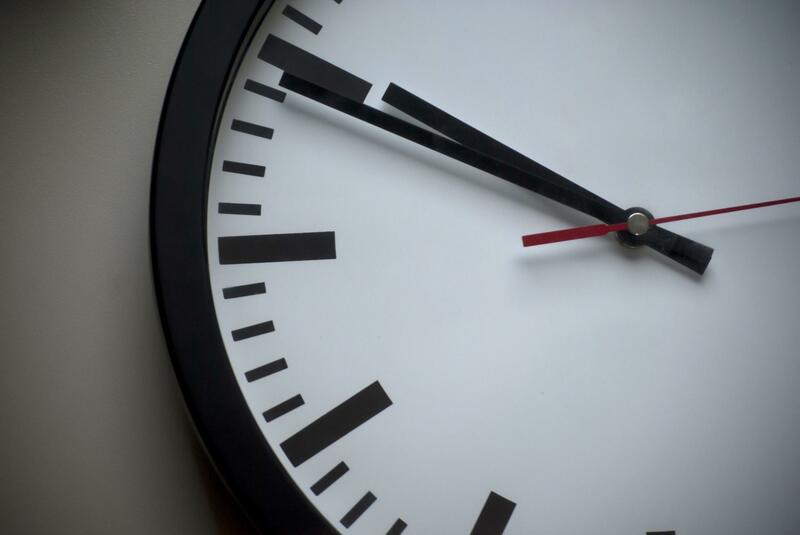 Time is running out to purchase a BC Yearbook Ad spot, so get yours via this link: Yearbook Ads. Are you interested in spreading the word of God throughout the world? If so, you may want to consider supporting our BC missionary students! 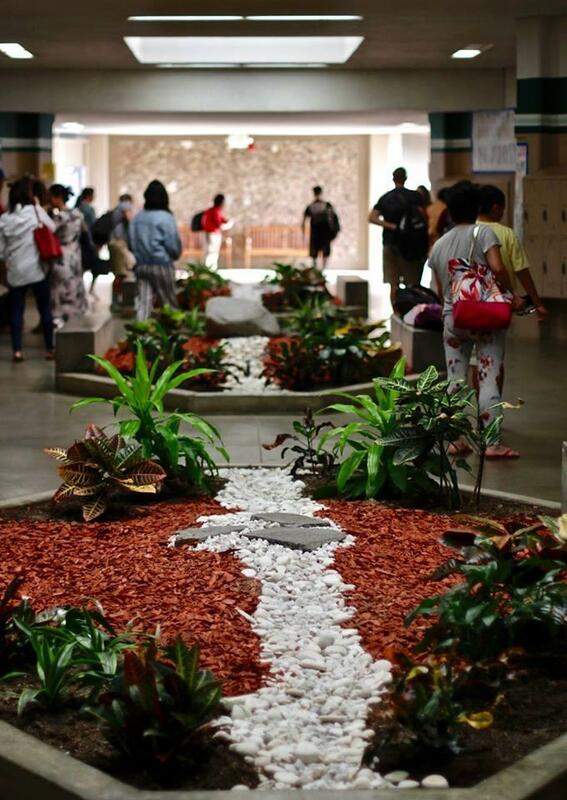 We have teams going to Japan and Honduras this summer, each of which will bless the people with whom they interact. You can go to www.bchs.net/missionsupport/ and scroll all the way to the bottom of the page to support our general missions or individual students or staff. If you are interested in getting involved with the Parent Fellowship council, please attend our upcoming meeting on Monday, November 26th in the Main Office from 7-8:30PM. We will meet on campus and talk about all the events and activities we have coming up to support our school. 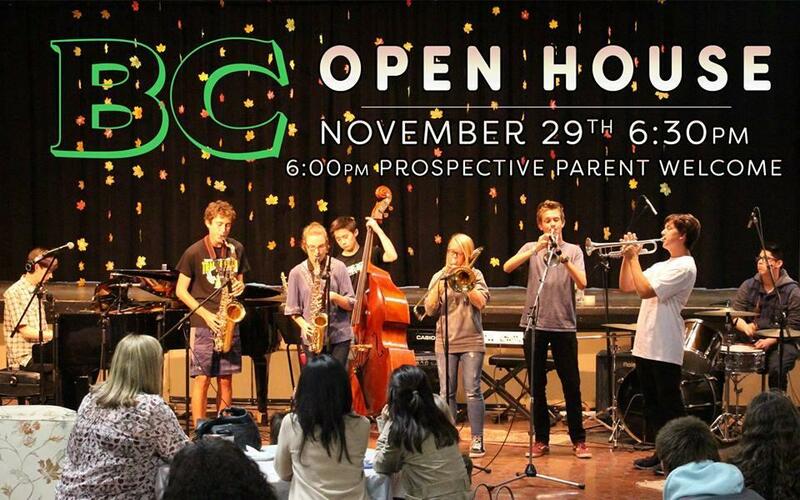 Don’t Miss the BC Open House on Thursday, November 29th at 6:30PM. 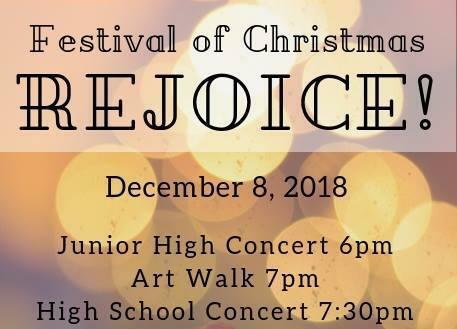 Come and see what our students have created so far this year, meet their teachers and enjoy some hot chocolate and music from the BC Band and Choir. There will be some great prizes and a Christmas Tree coupon up for raffle! Please join us for a wonderful time for our entire community, and don’t forget to invite your friends who might be interested in a BC education. 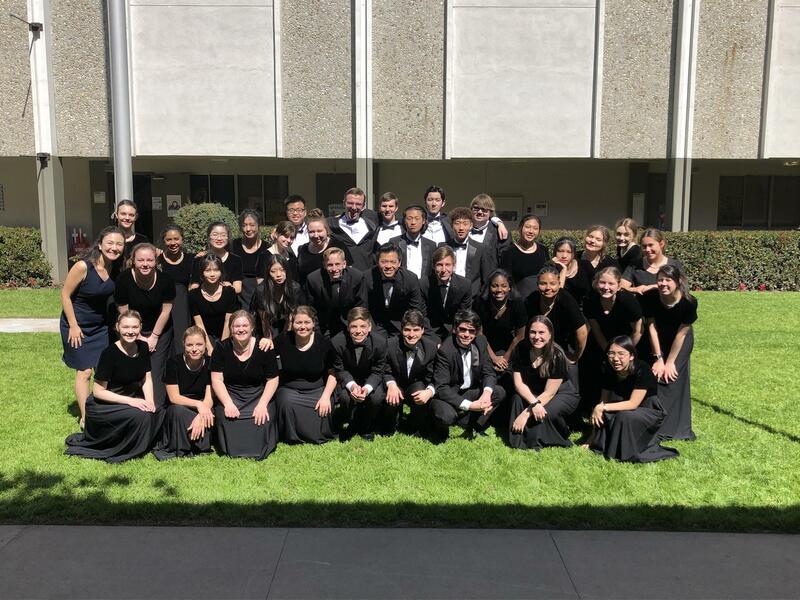 The Brethren Christian High School Choir participated in an invitational Choral Festival hosted by Concordia University in Irvine. 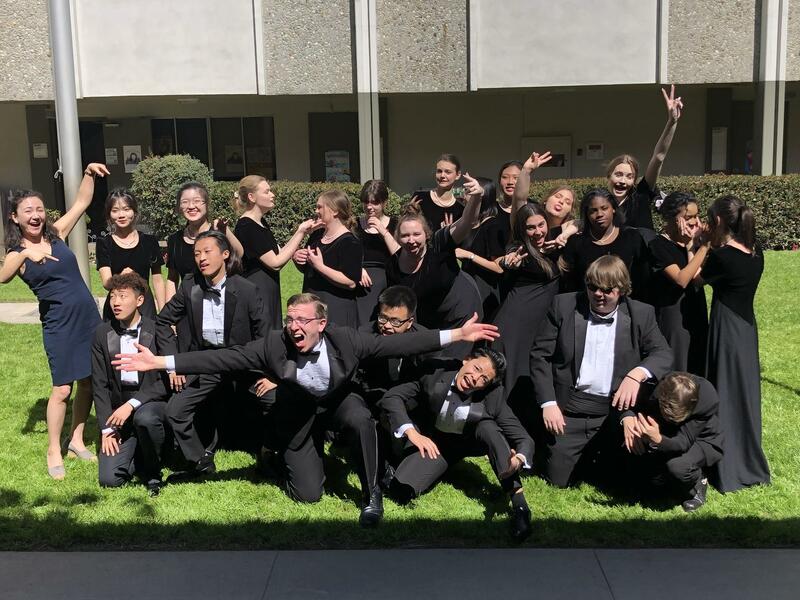 Our choir performed beautifully in front of other schools from southern California and guest clinician, Mr. John Tebay. Congratulations to Ms. Mine and our wonderful choir! We have a special chapel planned for next Tuesday at 11AM in the mall to honor our country’s veterans. There will be a Marine color guard, a combat Marine speaker and another special veteran speaker. 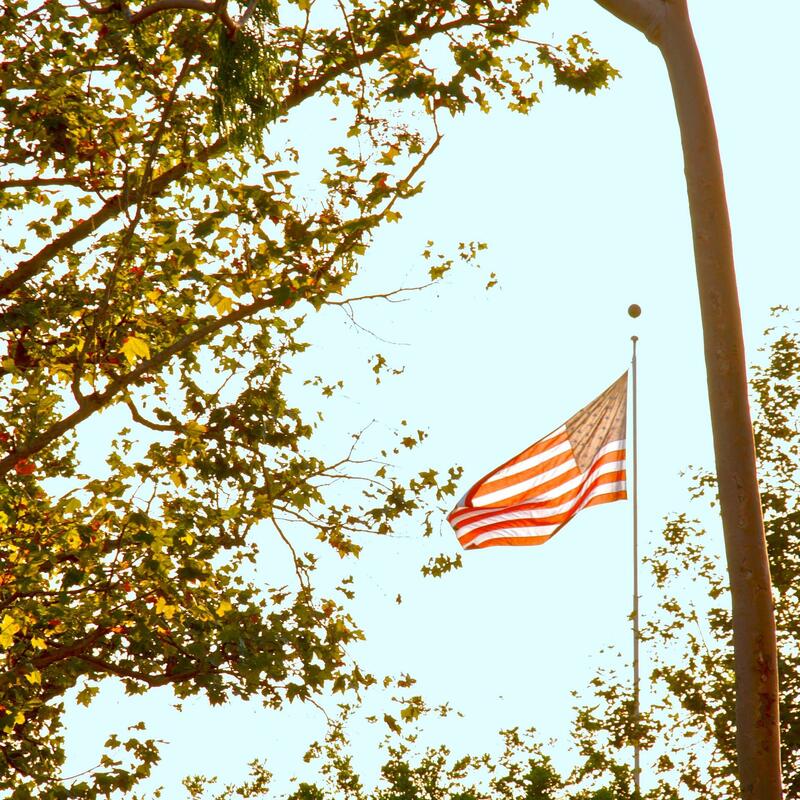 We invite all of our students’ family members, who are veterans or active duty military to join us in their uniforms. We look forward to a big turn out. 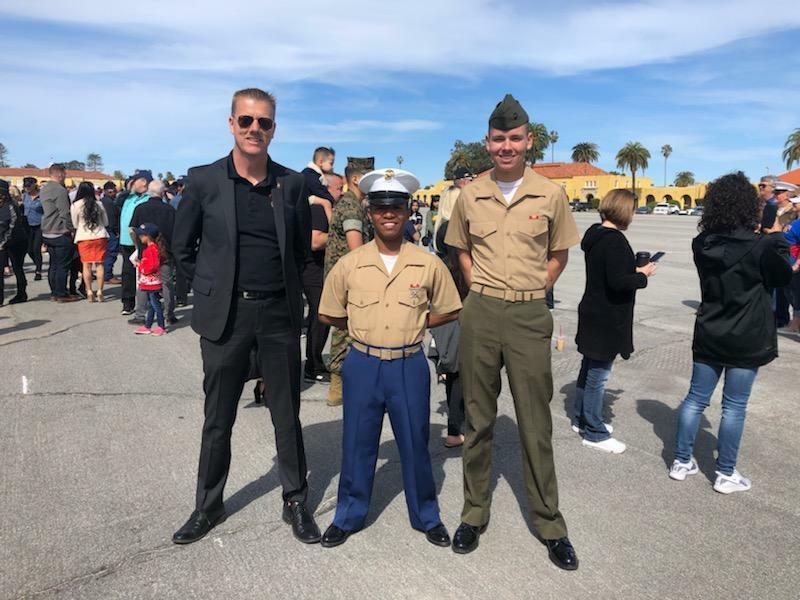 You may not know that four members of the BC class of 2018 have joined the Marines, and we are so proud of them! God bless America! The Boy’s varsity cross-country team finished 3rd in the league after an amazing performance at league finals yesterday! 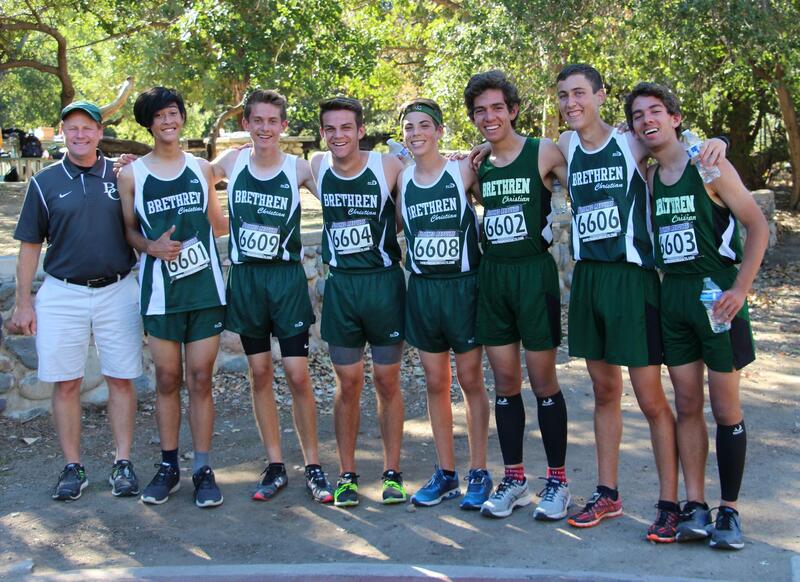 Nine of our boys will participate in the CIF preliminary race next Saturday in Riverside. Let’s wish them luck for next week and congratulate them on a strong finish to the season! Please contact Coach Dyson for details about this Saturday’s event. There are three ways that you can help support the PFC right now! 1. 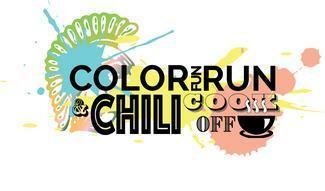 Official sign-ups for our Annual Color Run and Chili Cook Off will happen at Open House in November. The event itself is Saturday, April 5th, but there is a lot of work that can be done now! 2. Parents and students can volunteer to help in advertising, set-up and clean-up, gathering supplies, and organizing the event. This is a community event and we need everyone! 3. Spread the word now to any businesses or business owners you know who might want to be a sponsor. We are always looking for people to donate T-shirts and items for our swag bag. Also, do you know of a DJ company, photo booth and food truck? We need your referrals! See you at the PFC Meeting on Monday 11/26 7-8:30PM in the Teacher's Workroom - all are welcome. 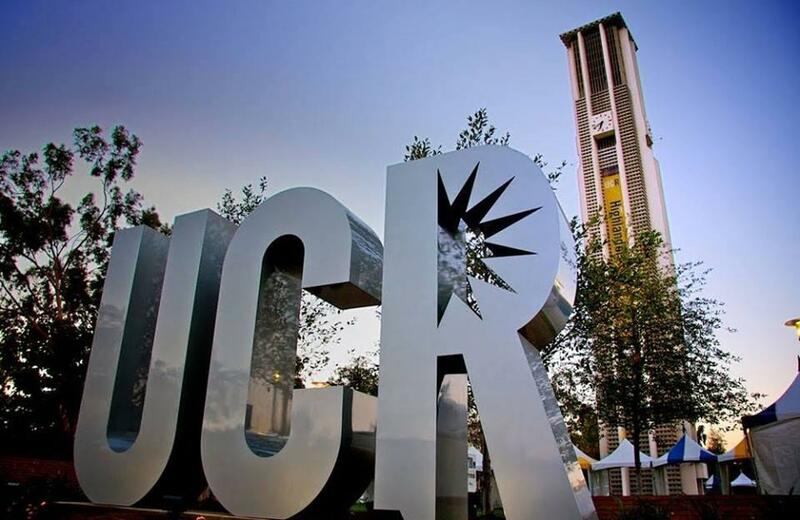 On Friday, November 9th, representatives from UC Riverside and Verto Education will be on our campus in room 202 to talk with BC high school students about the college application process. If you would like your child to attend, they can come during Academic Support at 9:25AM to meet with the representatives. BC Seniors may sign-up to stay after and talk more in depth if they have not already missed up to 4 classes for other visits. The BCHS ISS team is having a yard sale this Saturday, November 10th to raise funds for the experiment that they are creating that will be launched up into space and monitored by the astronauts in the International Space Station. The yard sale will be from 7:00AM to 2:00PM on the BC campus east lawn, behind the main office. 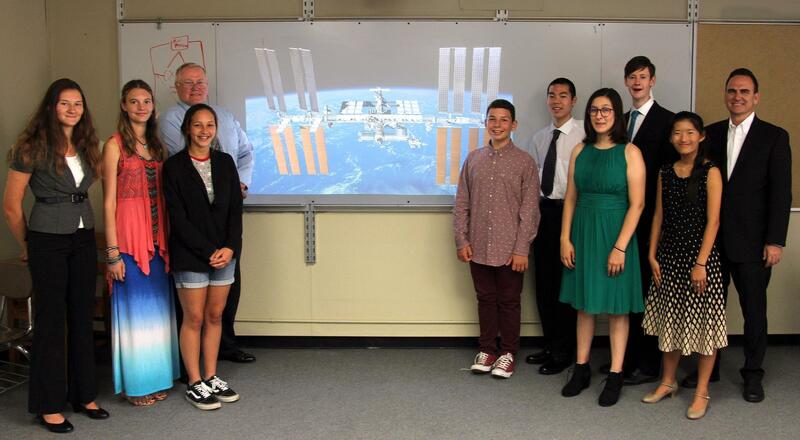 Thank you to the whole Space team: Andrew, Kaito, Jessi, Paige, Maddie, Colby, Mr. Peterson, and Mr. Donahoe. We are gearing up for a wonderful Open House event for our entire BC community! 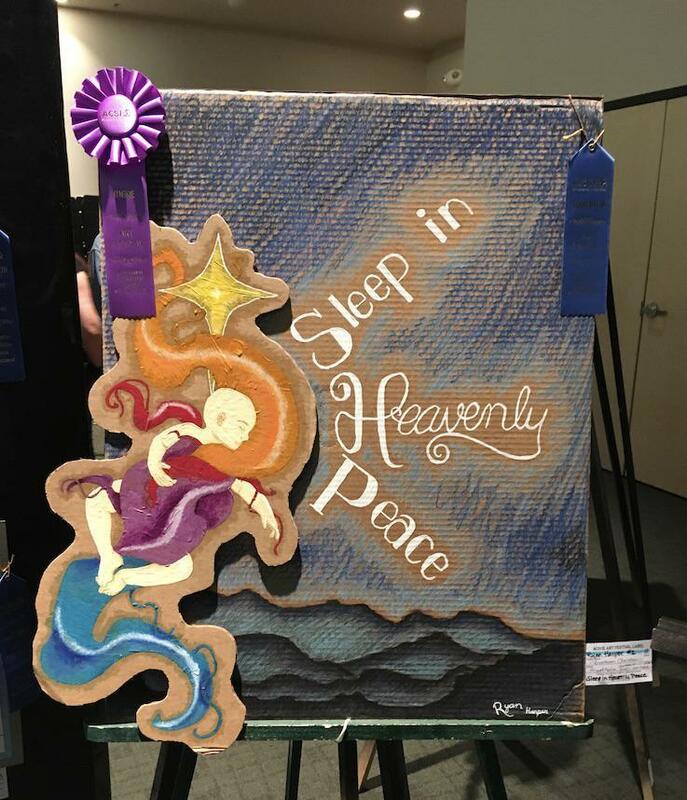 On Thursday, November 29th our campus will be open for the friends and family of Brethren Christian School to come and visit our teachers, hear some amazing music and see some awesome artwork that our community has produced so far this semester! We are inviting prospective families to join us for Open House, so invite your friends and neighbors who might be interested in attending BC. We look forward to seeing you at this community event. The end of the second 6-week grading period is this Friday, November 2nd. Our students have been working hard on a variety of projects and learning many things along the way. Report cards will be handed out to your students on Tuesday, November 6th, so please ask your student about their grades that evening. Parents, please join us for an end-of-the-semester celebration of all the hard work your students and teachers have done together! Some great projects have been completed and we will be showcasing it on Thursday, November 29th at 6:30pm. There will be food, music and fun, so bring the whole family! Please invite your friends that might want to attend BC next year. Thank you. 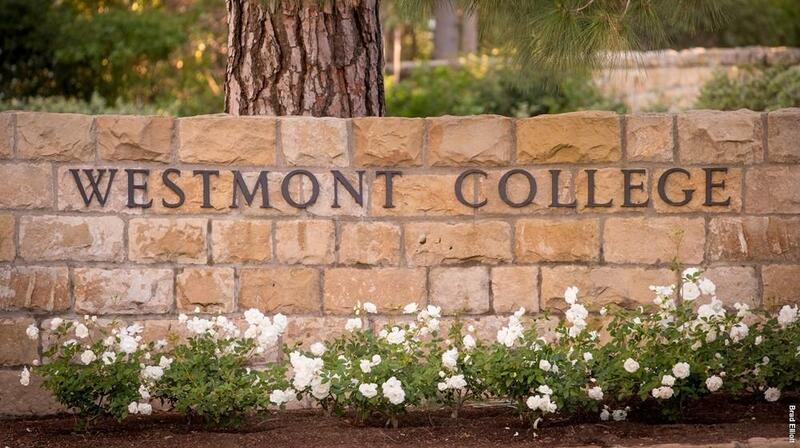 A representative from Westmont University will be available to meet with students on Monday, November 5th at 10:45 AM. They will answer questions about filling out applications, college matriculation and scholarship opportunities. If you would like more information, please contact our Academic Dean, Ms. Flippin. 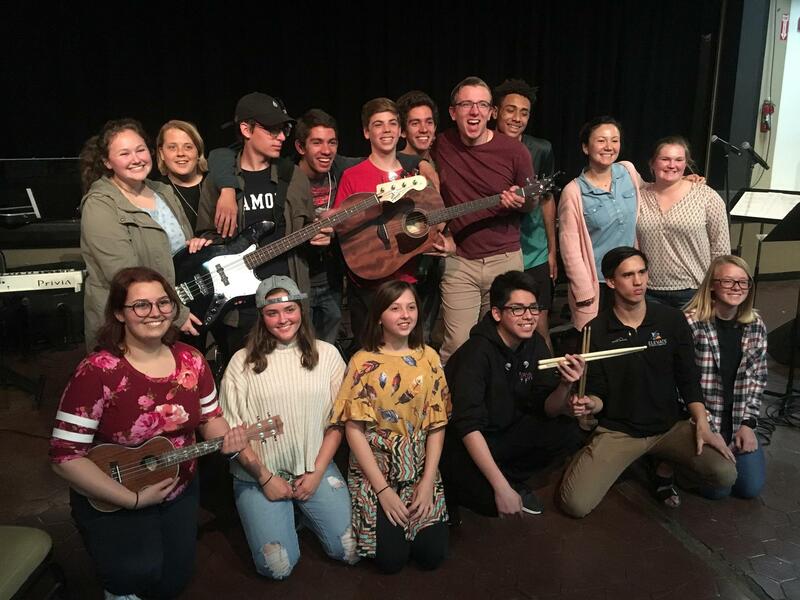 Our BC Drama Production of Neil Simon’s “Fools” is closing this weekend, with final performances on Friday and Saturday at 7:30PM in the BC Drama Room. Tickets are still available online and at the door (or to buy in the front office) for$10. You can buy them online at www.bchs.net/bcdrama/. Please print out your receipt and bring it to the show as your ticket. Congratulations to Mrs. Griffin and the entire cast and crew on a great show. 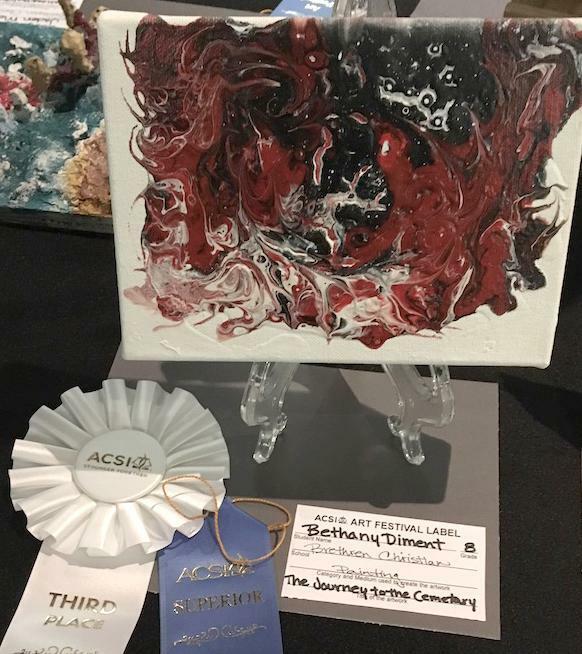 I attended last weekend, and it was fantastic. Get ready to laugh hard! Are you shopping online for Christmas? You can actually give back to Brethren if you use ﻿smile.amazon.com/ch/95-3956057 and choose “Brethren Christian Junior & Senior High School” as your selected charity. We will get a percentage of eligible purchases made through the Amazon Smile program every time you make a purchase! If you have any questions, please contact the business desk at ex. 33 for help with this program. 1. Official sign-ups for our Annual Color Run and Chili Cook Off will happen at Open House in November. The event itself is on Saturday, April 5th, but there is a lot of work that can be done now. 3. Please spread the word now to any businesses or business owners you know, who might want to be a sponsor. We are always looking for people to donate T-shirts and items for our swag bag. Also, do you know of a DJ company, photo booth and food truck? We need your referrals! See you at the PFC Meeting on Monday 11/5 7-8:30AM in the Teacher's Workroom - all are welcome, and we encourage parents to come. Thank you. Debunking the Vaping Myth. 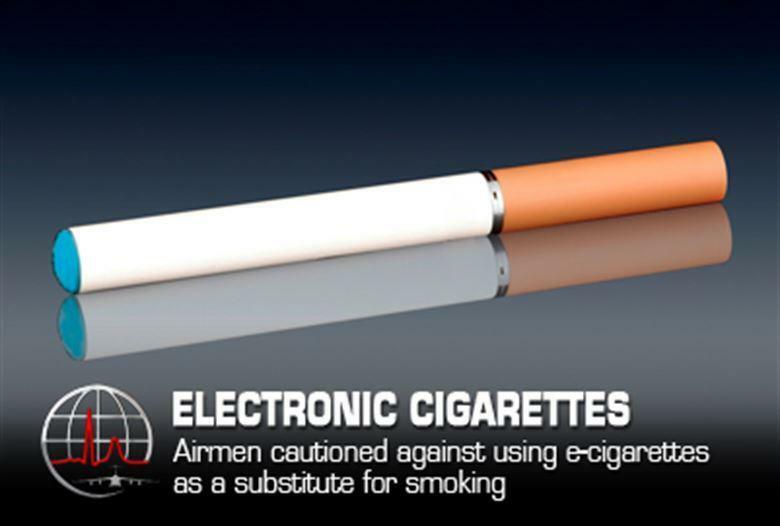 A new study by the American Physiological Society significantly debunks the myth that e-cigarettes are safer than regular cigarettes. FDA commissioner Scott Gottlieb says, “E-cigs have become an almost ubiquitous--and dangerous--trend among teens.” Due in large part to the mythic narrative that vaping is safe. This recent research shows that not only vapor harms the lungs, but the added flavor in e-cigs exacerbates the detrimental impact of vaping. It’s a double whammy. Your teens probably believe e-cigs are safe and more significantly they may be drawn to them because vaping just looks cool. Please talk to your children about the dangers of vaping and smoking. Thanks so much to our students and parents, who met with the Accreditation Committee as they reviewed our school this week. Your input and experience were invaluable. The official report will be delivered to us in the next two months, but the initial report is strongly positive on all areas of our school. 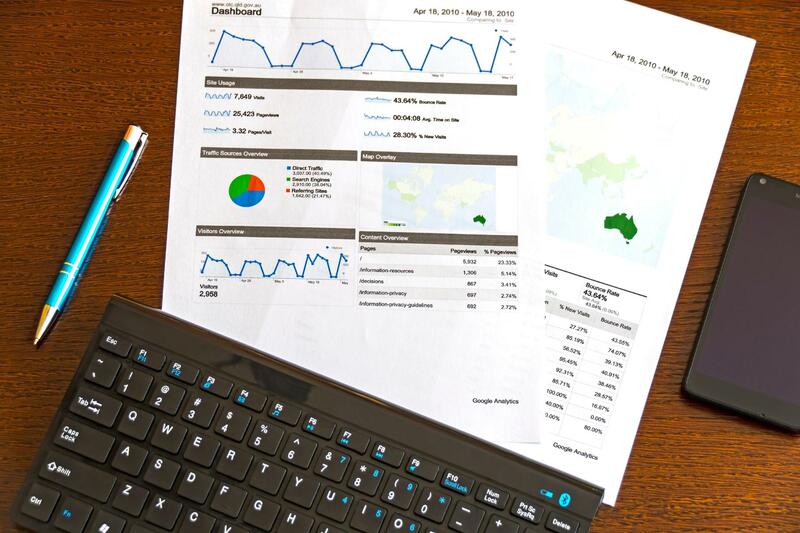 This process was validating to who we are, and it gave us direction on how to continually improve. 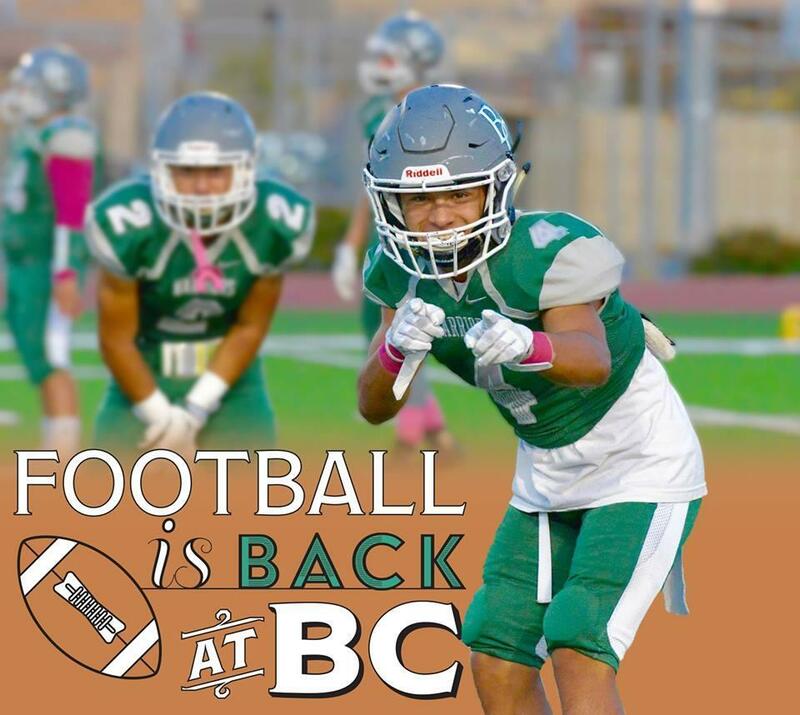 The BC HIGH SCHOOL Football team will conclude their season with a home game against Lighthouse Christian at 3:30PM this Friday. We will also celebrate Senior Appreciation that night, celebrating all 12th graders in our football team, cheer squad, and band! Please come out to support our Warriors! 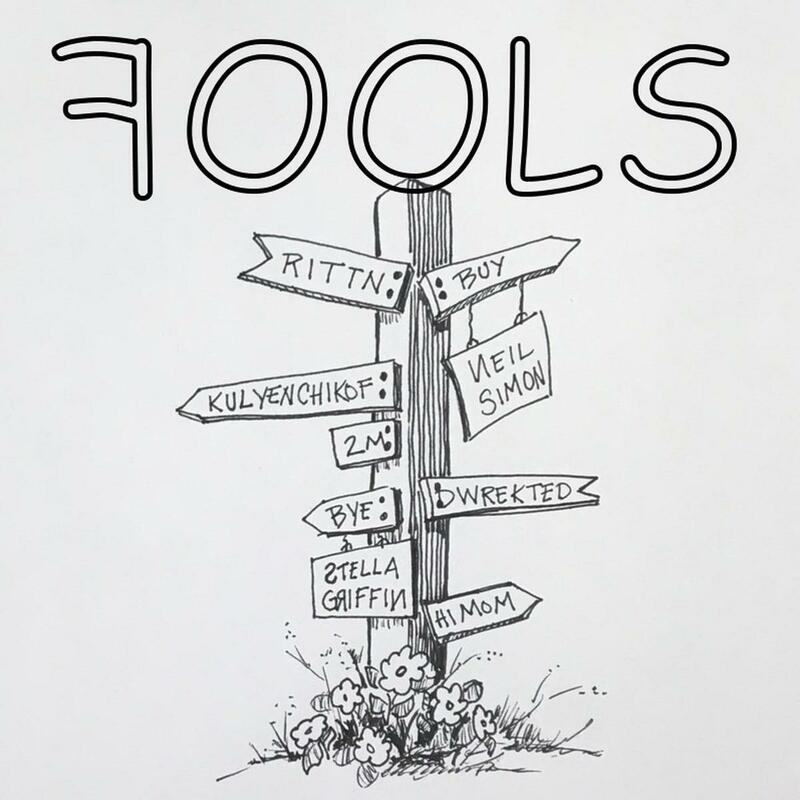 The BC Drama Production of Neil Simon’s “Fools” opens this Friday at 7:30PM in the BC Drama Room, and will run on October 26th and 27th & on November 2nd and 3rd. Tickets are $10, and you can buy them online at www.bchs.net/bcdrama/. Please print out your receipt and bring it to the show as your ticket. See you at the show! 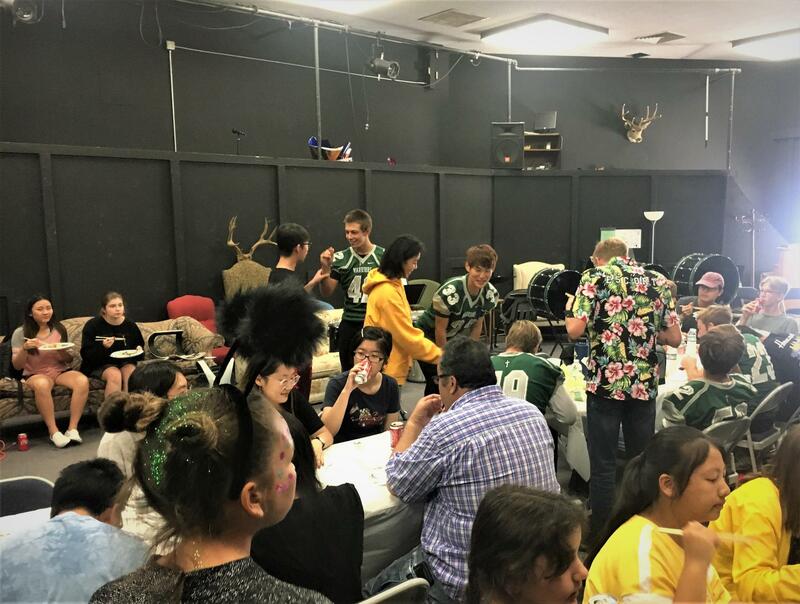 Come to our 6th Annual Band Pancake Breakfast & Used Book Sale on Saturday, October 27th, from 7:30 - 10:30AM, where the JH and HS bands will be performing. 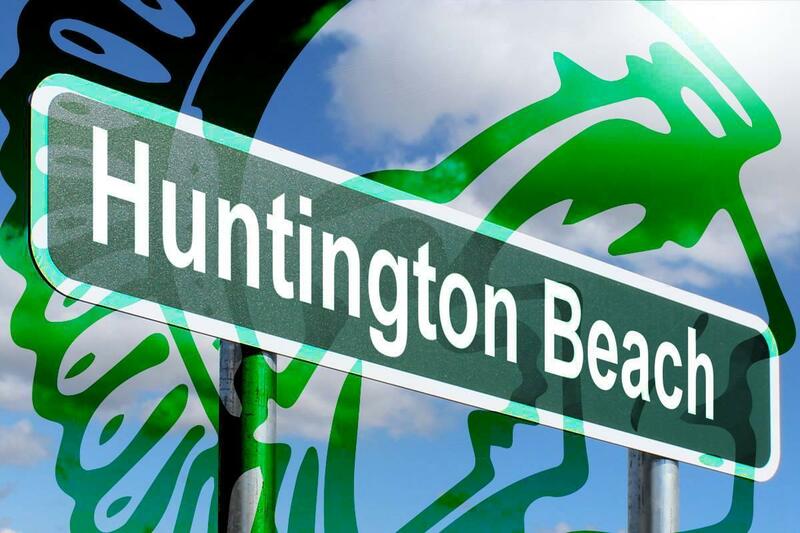 The Lions Club of Huntington Beach, who is graciously volunteering their time to cook pancakes for us, will also join us! They are gathering donations of used eyeglasses, so please bring any if you have them. We are pleased announce that BC students can now earn college credit and high school credit at the same time for certain courses taken online through Biola University at a significant discount. Please visit Biola Smart Start to get more details and to apply online. Students are encouraged to enroll by November 30th for courses beginning on January 14, 2019, since space is limited. Please consider taking advantage of this special offering from Biola. 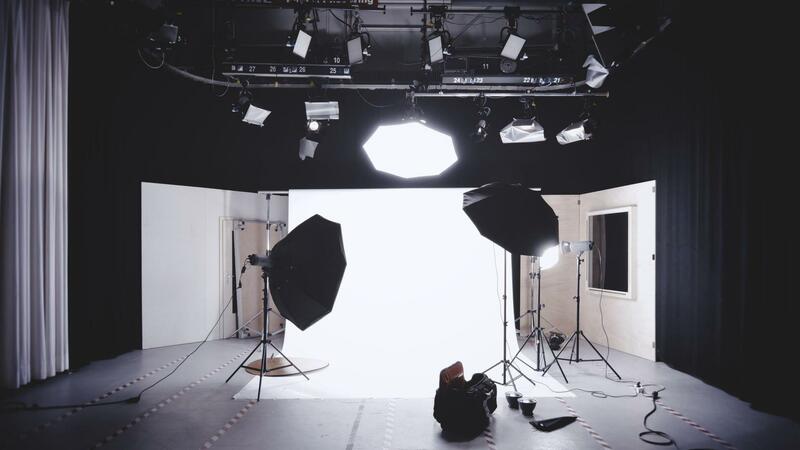 Monday, October 29th is Club Photo day. 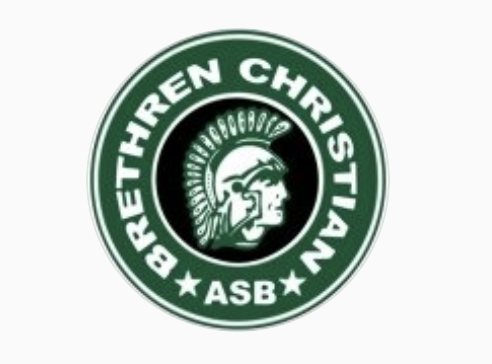 Mrs. Ramsey is arranging to take pictures of all clubs and teams that meet at Brethren Christian School. Please ask your children to check with their club Directors about what to wear for the photos. Ever wonder how people find our school? Much of it is word-of-mouth, but research shows that more and more parents are turning to online searches. Yelp is one of the most popular platforms for people who want to find out about private schools in our area. 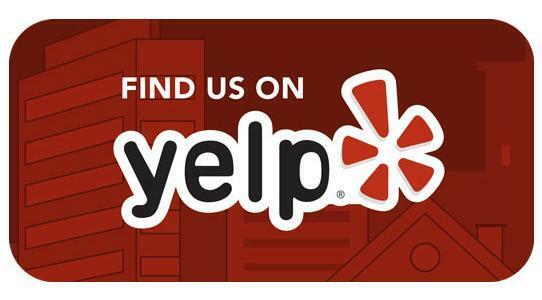 Would you consider going to the BC Yelp page and leaving us a review and a rating? We would really appreciate it. 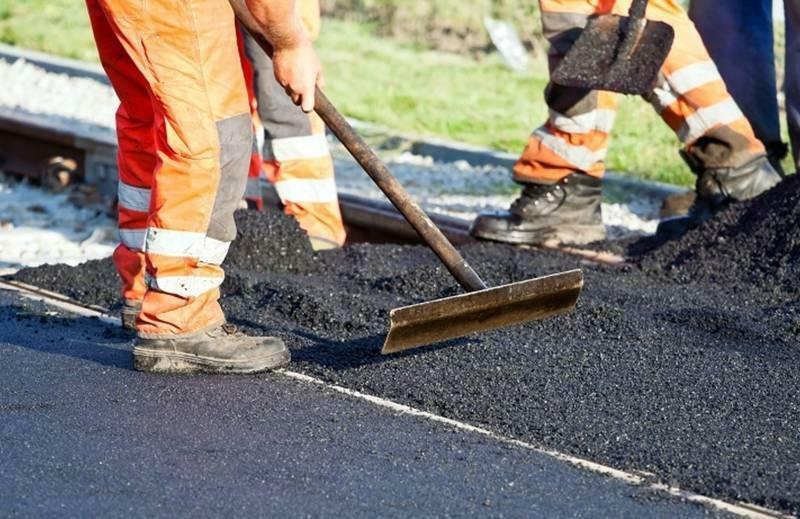 Please be aware that the City of Huntington Beach is planning a Pavement Rehabilitation project in our neighborhood from October through December. We have been notified that there will be possible “no-parking signs” that will go up in our neighborhood in the days prior to any project that immediately affects our streets. Construction projects will generally take place Monday through Friday from 7AM to 5PM. We update you with any changes in our Daily Bulletin, which is posted on our website. 1. The next PFC meeting is on Monday, November 5th from 7 -  8:30PM at BC. 2. 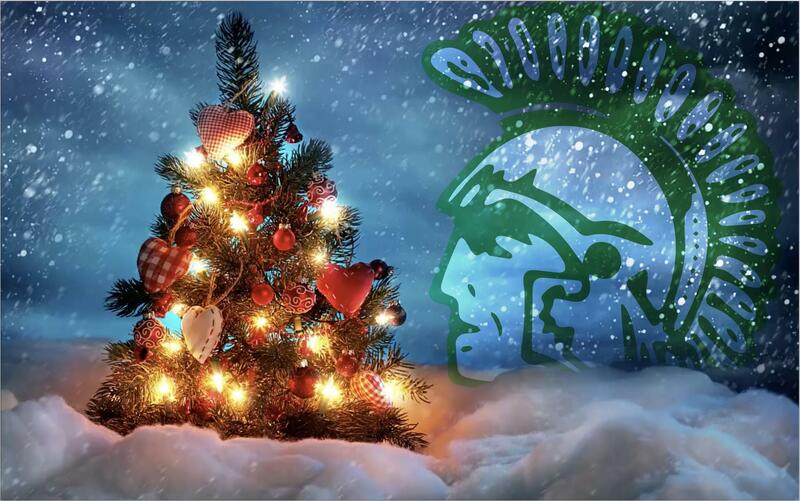 The holidays are upon us and there are plenty of ways to bless the students and staff at BC, please ask us how! 3. 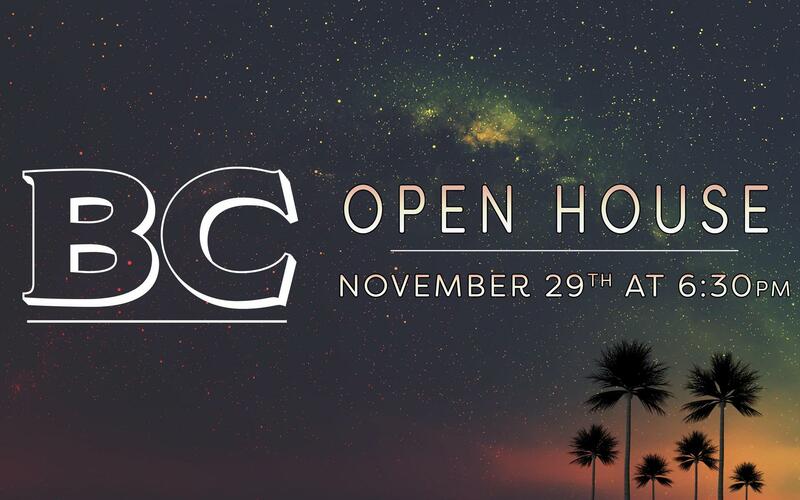 Mark your calendars for BC's Open House on November 29th at 6:30PM. Parents and students alike are welcome to come and celebrate the fall semester's accomplishments. Official sign-ups for Color Run volunteers will also begin here! 6. Please contact the PFC directly for questions about how to get involved with activities this year! Visit the Parent Fellowship Council page on our website and get to know the team, and help serve our students. …speaking to one another with psalms, hymns, and songs from the Spirit. Sing and make music from your heart to the Lord, always giving thanks to God the Father for everything, in the name of our Lord Jesus Christ. 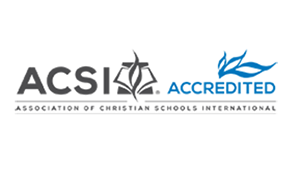 BC is accredited by both the Western Association of Schools and Colleges (WASC) AND the Association of Christian Schools International (ACSI). We submitted our self-study to these organizations in early September of this year. I commend our entire staff for their excellent work on this document - especially Mrs. Jenn Simonds and Ms. Marcella Flippin. An accreditation team will visit our school from this Sunday through next Wednesday to evaluate our school from A-Z. Our administration may be a bit busy with the team, but we will continue to make ourselves available to parents with any needs you may have. Accreditation keeps us accountable to a process of continual quality improvement, which is consistent with our goal of excellence in every area of the school enterprise. The visiting team's findings will be read publicly at 3PM in our library. All parents are welcome to attend. 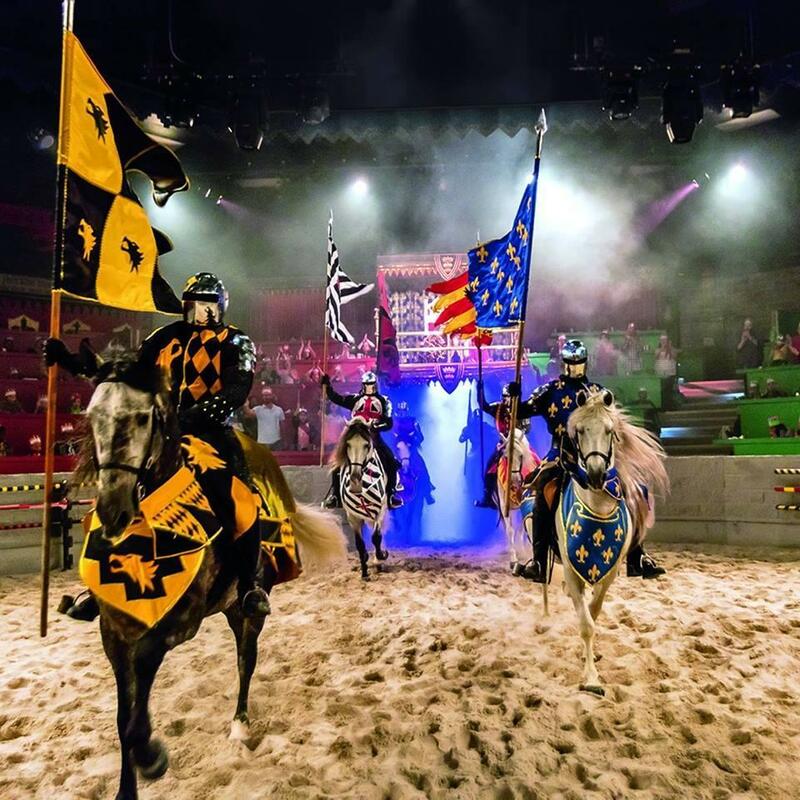 Our 7th grade enjoyed a day at the Medieval Times this week. They learned some history of the period and the value of kindness, while enjoying a great show. A special thanks to Mrs. Neighbors, Mr. Jefferson and Mrs. Johnson for chaperoning the students on this fun and educational field trip. 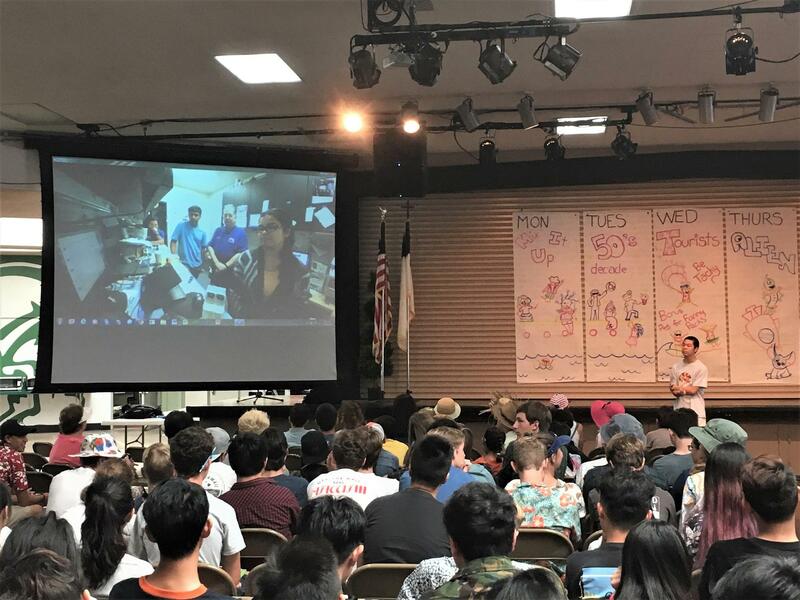 The Science Department at Biola University has partnered with our International Space Station Program to provide: technical direction, lab space, equipment access and student mentoring. 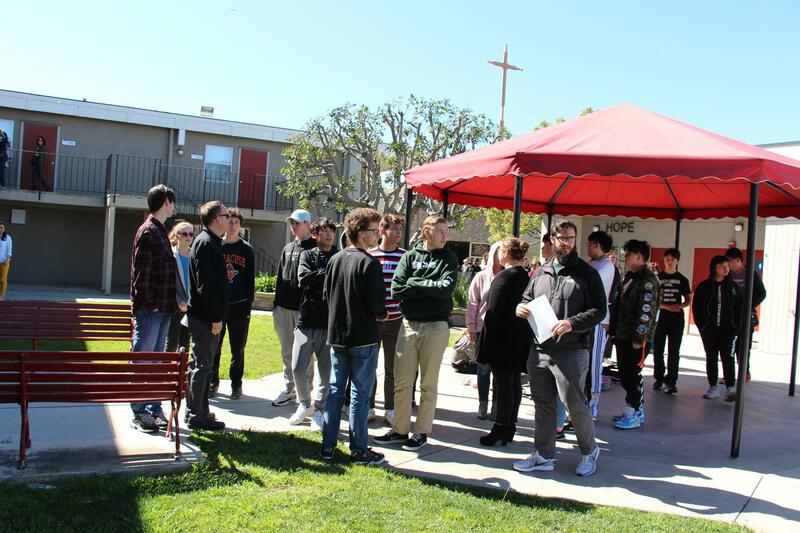 We are grateful to Biola for their support and, we are glad to introduce our students to such a great Christian University. 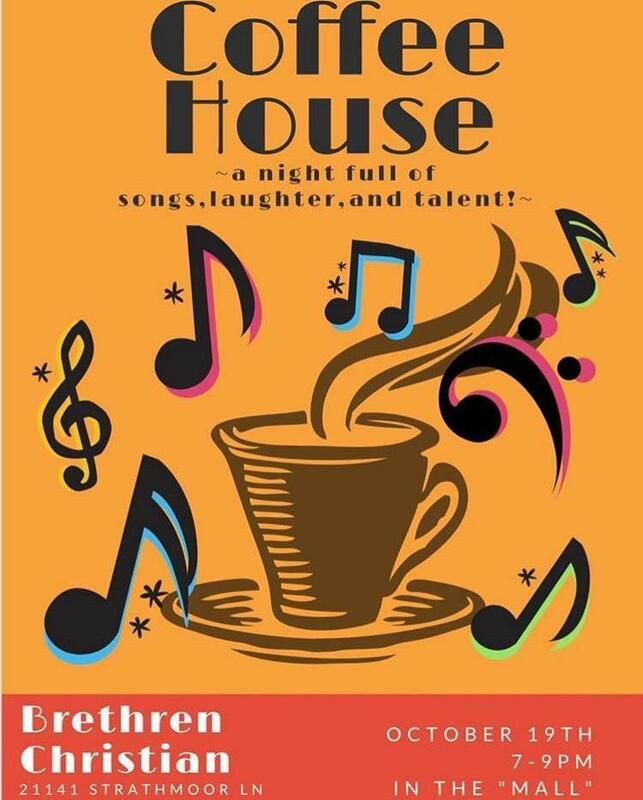 Please join us tonight at 7PM in the Mall to hear our students perform at the BC Coffee House event. 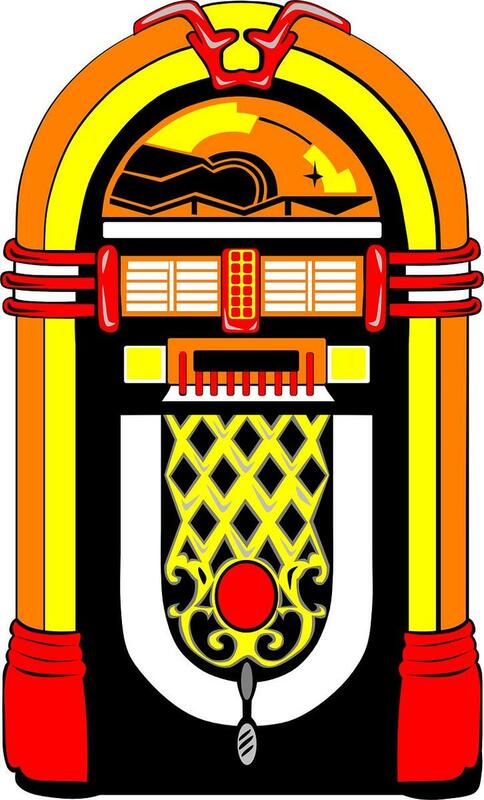 Enjoy various musical genres, musical theater, bluegrass, pop, comedy and more! There will be pies and coffee for sale as well, so come on out and support the arts at BC! A representative from Grand Canyon University will be available to meet with students on Monday/10/29 at 10:45 AM. They will answer questions about college scholarships opportunities exclusively for BC families as well as dual credit enrollment possibilities here at BC. If you would like more information, please contact our Academic Dean, Ms. Flippin. 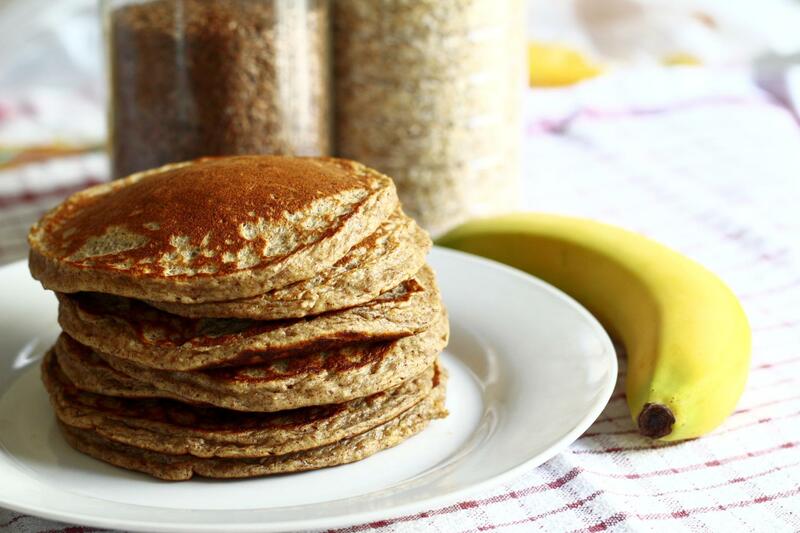 Come to our 6th Annual Band Pancake Breakfast & Used Book Sale on Saturday, October 27th, 7:30AM - 10:30AM. Both the junior high and high school bands will be performing. 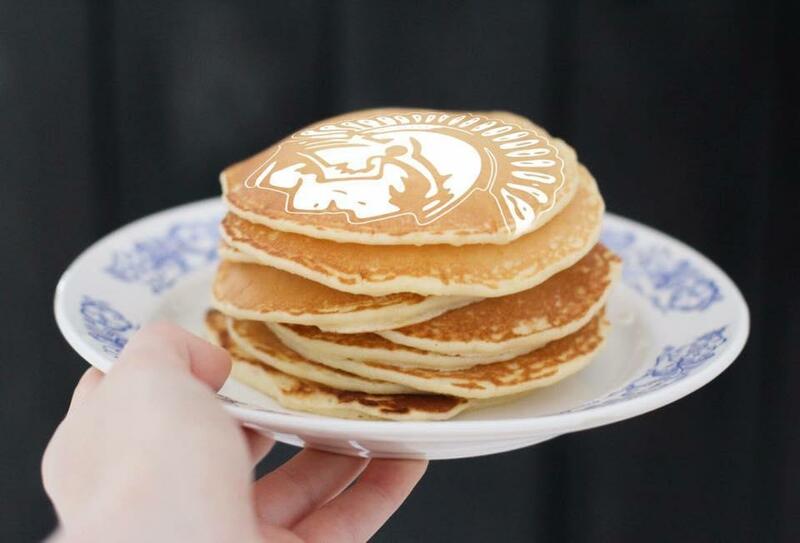 We will also be joined by the Lions Club of Huntington Beach, who have graciously volunteered their time to cook pancakes for us! They are gathering donations of used eyeglasses, so please bring any if you have them. The Fall play, Fools, is opening on Friday, October 26th at 7:30PM and will run Fridays and Saturdays until November 3rd. You can buy your tickets ($10) now! Please select the date, reserve the number of spots you want and print out the receipt as your ticket! You can also stop by the front office and pay cash to pick up your tickets. Thank you. Do you love BC? We do, too. Don't forget to visit one of our social media outlets, including Facebook, Instagram, or Yelp and leave us a positive review. Tell your family and friends about us, as we have plenty of events coming up in November and December that are open to the public to enjoy. 1. The next PFC meeting is on Monday, November 5th from 7 – 8:30PM at BC. 2. The holidays are coming soon and there is a "classroom needs & favorite things" list from the faculty and staff in the front office. Thank you! 3. Keep collecting those BOX TOPS! Every bit counts as we raised over $500 with our last submission! You can turn in your box tops to the front office and don’t forget to trim them down on the dotted lines to make them perfect rectangles, and check the expiration date. 4. 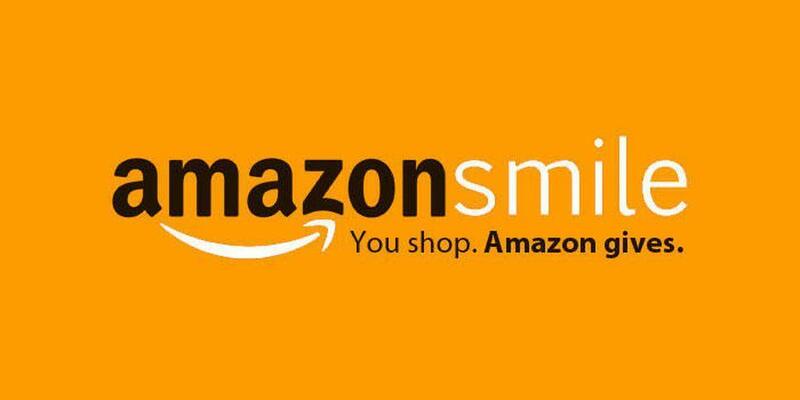 Amazon Smile is a great program to utilize in order to raise money for an organization while doing online shopping! Consider using it to promote BC while you do your Christmas shopping! 5. The Annual BC Color Run is coming soon and we need your help! Please contact the PFC to jump on the planning committee and help plan this amazing event (our 3rd anniversary this year) that takes place on Saturday, April 6th. 6. To contact the PFC directly about questions or comments, please visit the Parent Fellowship Council page on our website and get to know the team, and help serve our students. Please join us tomorrow morning, October 5th at 8AM in Room 202 for some light snacks, fellowship, and a time of Q&A with me and other parents. Everyone is welcome! The class schedule for the week of October 8-12 will be adjusted due to PSAT testing. Please visit the PSAT Schedule Page for a complete breakdown of the schedule, and adjust accordingly. Thank you. Our 8th grade class leaves for Astro Camp next week for a three-day experience in the mountains. Students will learn about science, bond with their classmates and make memories for a lifetime! Please connect with Mr. Weir at sweir@bchs.net if you have any questions before they leave on Monday. 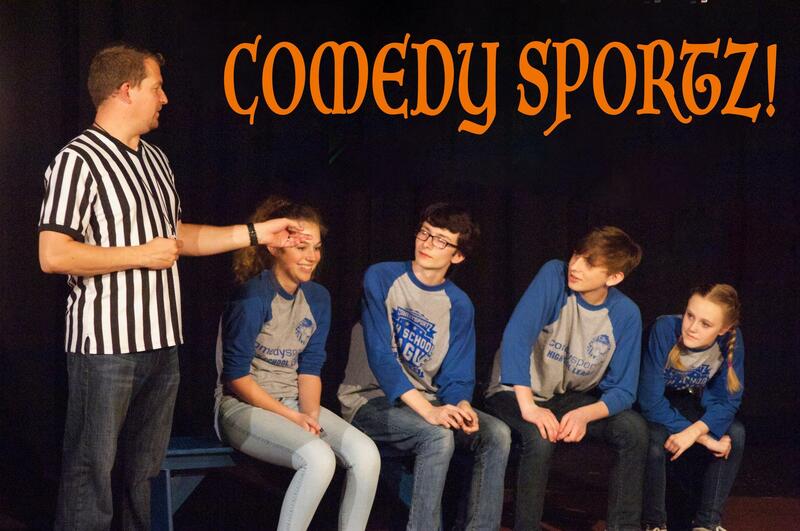 Join our drama students on Friday, October 12th for Comedy Sportz, a hilarious improv-comedy show where student and audience participation is encouraged. Tickets are $5. This is a fun time to laugh with our community and all proceeds go back to supporting the BC Drama program. Head over to the Drama room (502) at 7PM and be ready for laughs. 1. The next PFC meeting has been postponed until Monday, 10/8/18 from 7 – 8:30PM at BC. 3. Looking for ways to support BC? Try using the Amazon Smile program next time you shop online, or turn in some Box Tops to the front office! 4. The Color Run planning committee is forming now. Please contact the PFC in order to participate in helping plan the amazing event that takes place on Saturday, April 6th. 5. 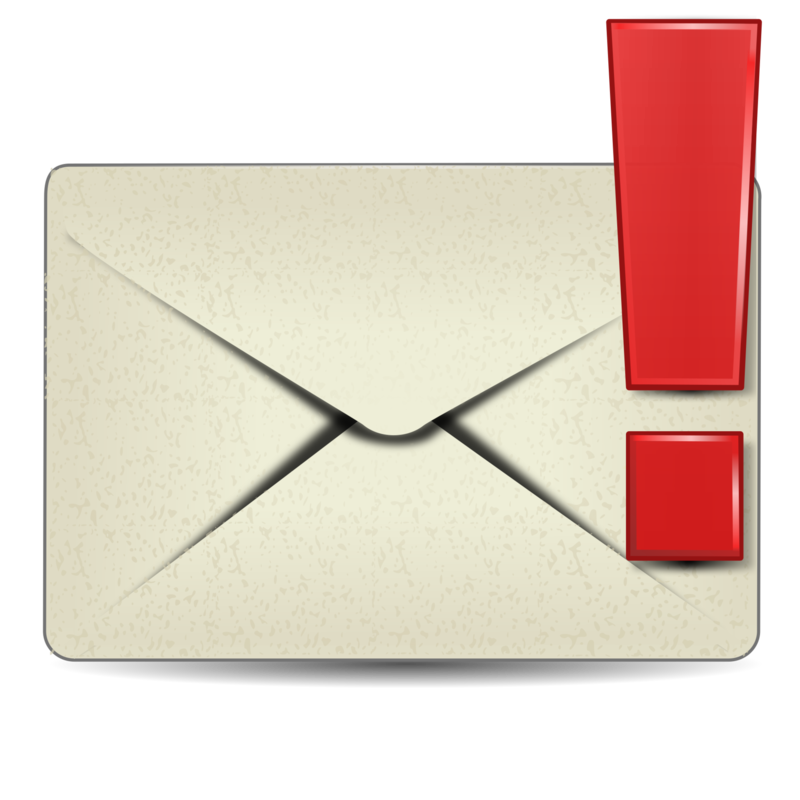 To contact the PFC directly about questions or comments, please visit the Parent Fellowship Council page on our website. 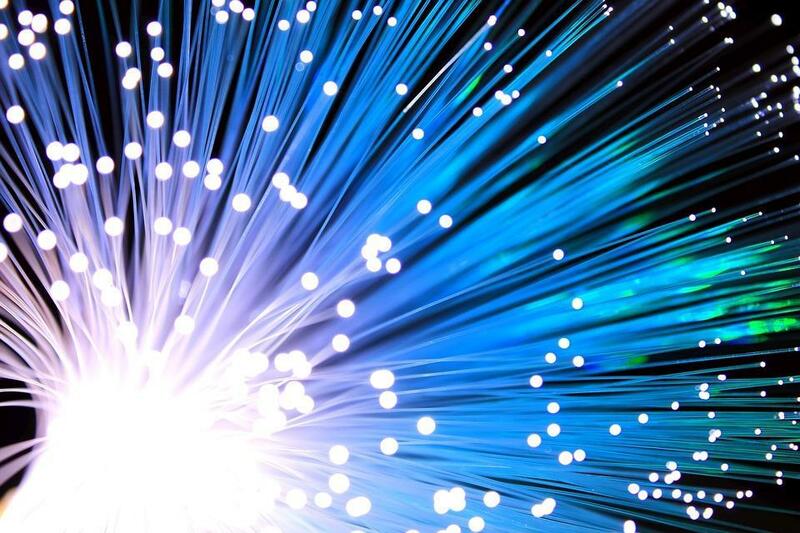 We had high-speed fiber installed this past weekend to further increase our speed and bandwidth at the school. This was completed at minimal cost, but it will deliver maximum results for our network. Your students will notice the difference. 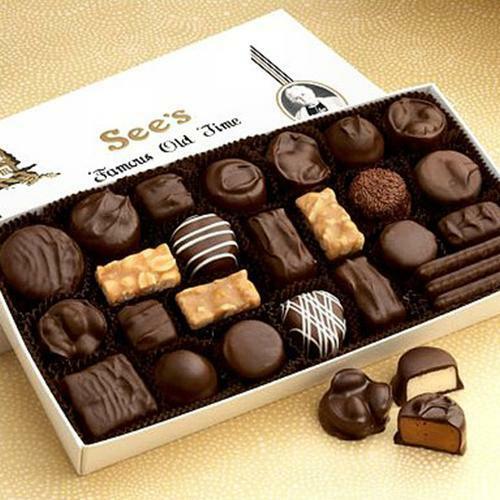 Our award-winning choir is having a fundraiser with See's Candy! Download the BC Choir See's Candy Flyer and print it out. Then you can complete the form and bring it in to the front office. Order your chocolates today, or buy some for your family and friends for the holidays. Interested in Hosting BC International Students? 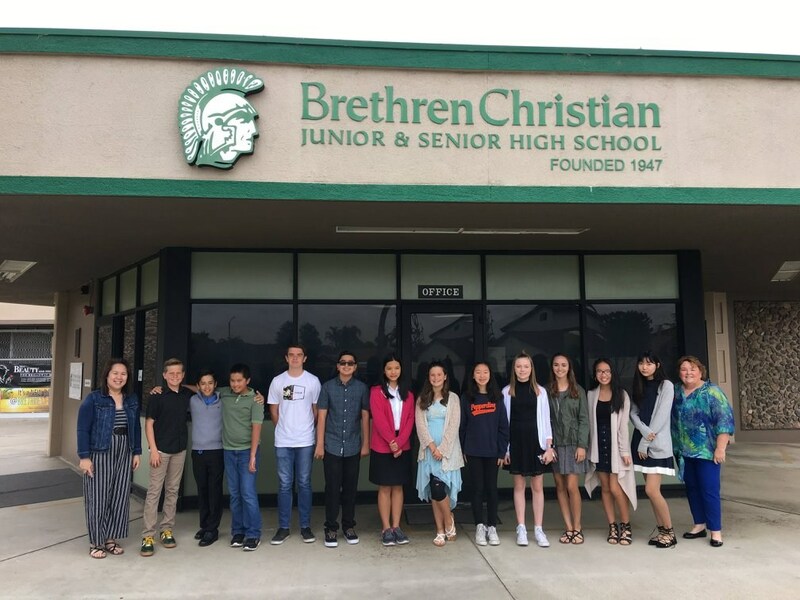 A number of families have expressed interest in hosting Brethren Christian School international students, and we are starting to look for host-families for the future. If you are interested in participating in this rich experience, please contact our Admissions Director, Shawn Thomas, at shawnthomas@brethrenchristian.org for more information on how to become involved in the host-family process . Then spake Jesus again unto them, saying, I am the light of the world: he that followeth me shall not walk in darkness, but shall have the light of life. Tomorrow our Warriors will be hosting the Desert Chapel Eagles at Brethren Christian School at 4PM. Stop by and watch the game, and bring a chair for the sidelines. 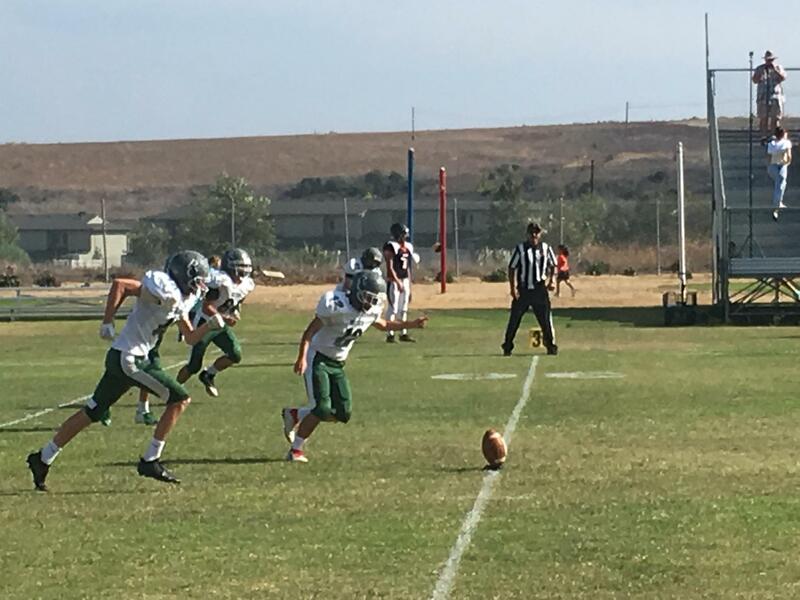 Earlier today, our Junior High Boys Flag Football team fought hard against Covenant school, and tomorrow afternoon our Junior High Girls Basketball team will go up against Bethel at the Fountain Valley Rec Center. 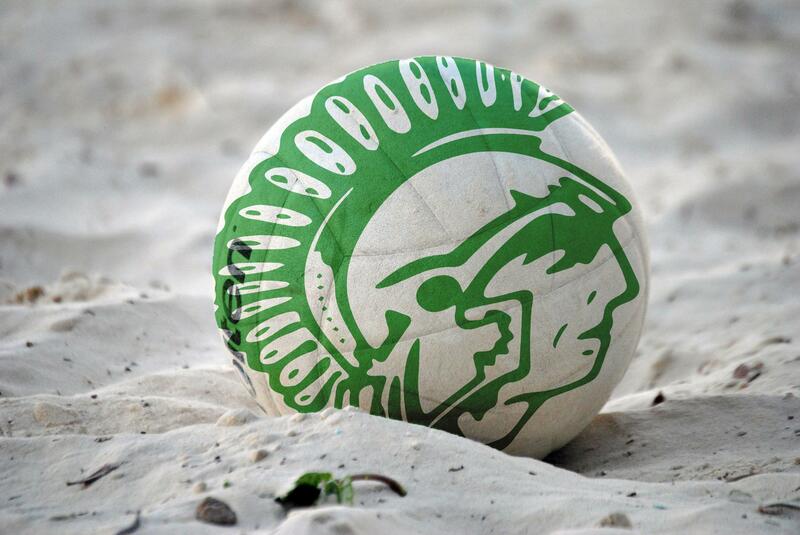 This Saturday, our Girls JV and Varsity teams will play a double header at Avalon High School on Catalina island! Let's wish all of our teams the best of success! September 27th is the day! 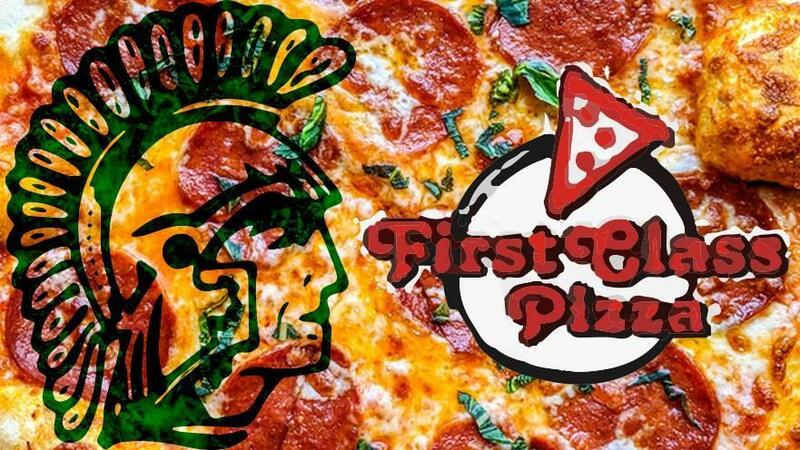 Make sure to head over to First Class Pizza in Fountain Valley, and order something to sponsor BC. We will get 15% of sales when showing this flyer between 11AM and 9PM. Make it an “after-party” following our Girl’s Junior High Basketball game at 3:30PM, or after the High School Football game at 4PM! Today’s technology can be an important help in a variety of situations, but we are also aware of how dangerous it can be to young people. 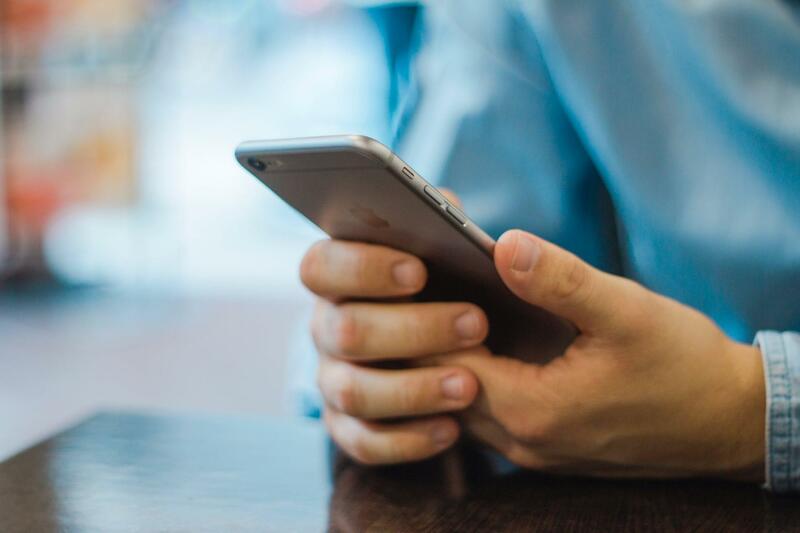 We take the risks and temptations facing our students at BC seriously, so we want to make parents aware of some of the latest Apps that could potentially be harmful to students and that may be contrary to our views and values as a Christian ministry. Please take a moment to review the 7 Apps to Avoid document from eSchool News Daily. 1. PFC meeting postponed to Monday 10/8/18 from 7 – 8:30PM at BC. 2. Save the date: Color Run Saturday April 6th – please contact the PFC if you'd like to volunteer! 3. We had a great time selling BC t-shirts and stickers and raising money for BC during the Homecoming celebration last Friday. We will continue to sell t-shirts at football games and Open House on November 29th. 4. 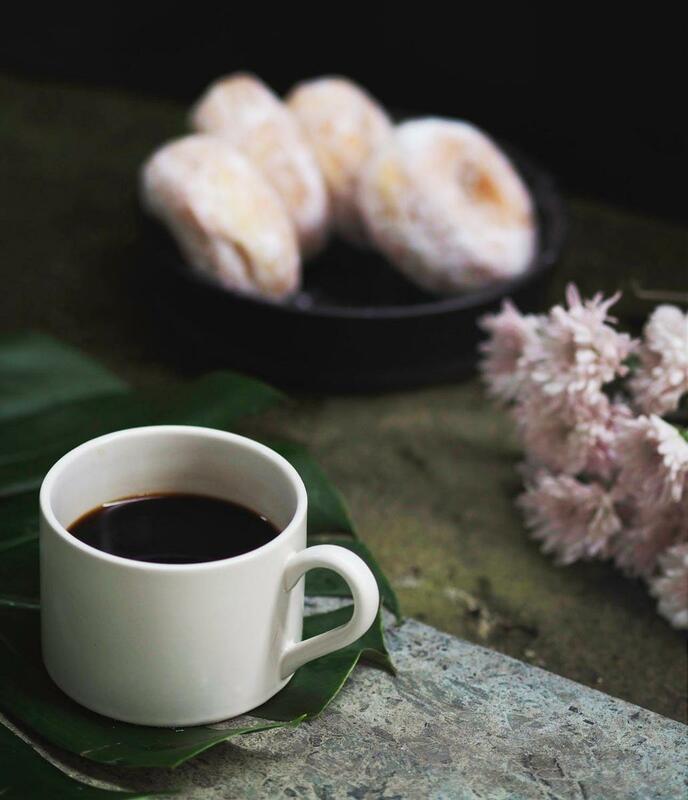 Save the date: Friday Morning Fellowship with Dr. Moran occurs at 8AM on campus every first Friday of the month. This is a time of fellowship with other parents and the Superintendent on an informal level. 5. The holidays are coming soon and there is a "classroom needs & favorite things" list from the faculty and staff in the front office. 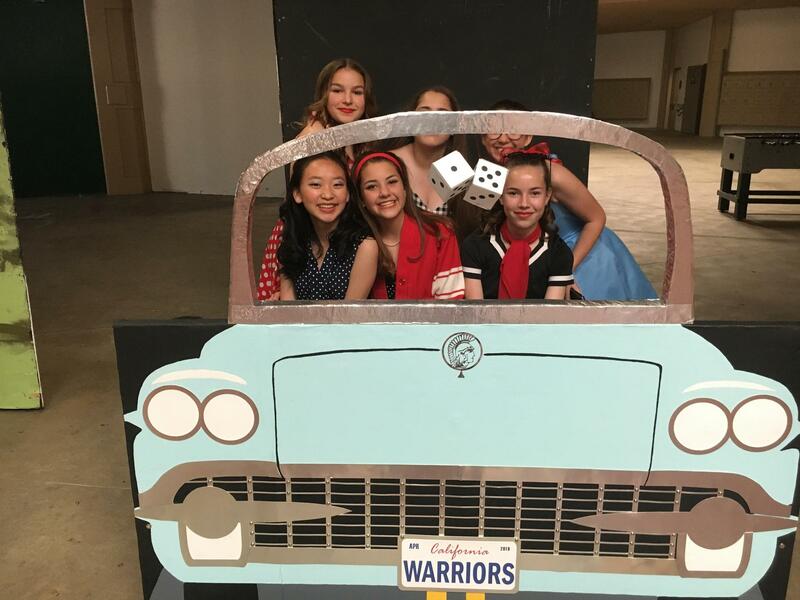 We are in the midst of a fantastic Spirit Week with fun activities and competitions, including dressing up in fun costumes each day. 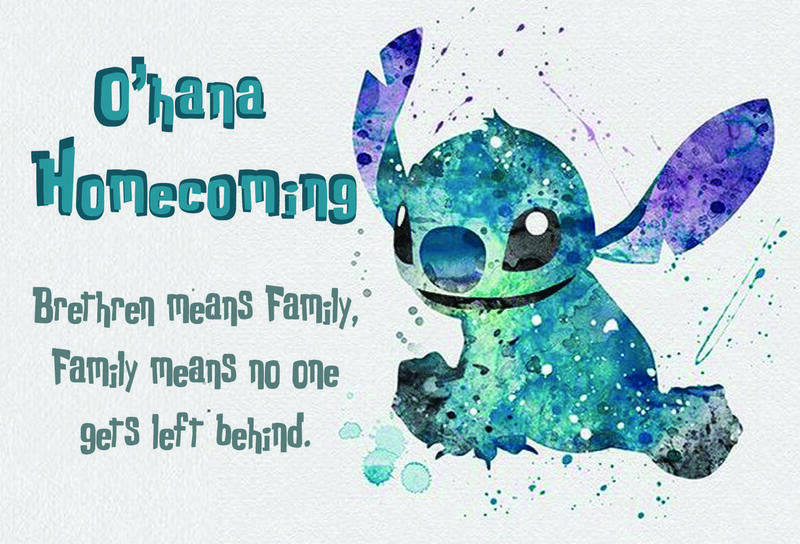 It culminates this Friday, Sept 21st with our Homecoming Football game on our campus at 4PM. The whole community is invited to come and cheer on our school and enjoy the food, booths and games that will be available for all. This Friday (Sept 21st) is the end of the first 6-week grading period. Electronic Report Cards will be available in Aeries on Monday (Sept 24th) after 4PM. The grade is a snapshot of your child’s work in each class for the first 6 weeks, including citizenship and work habits. Students with less than a 2.0 GPA or 4 points accumulated in citizenship (U=4 points/N= 2 points, W=1 point) will be placed on the ineligibility list for extra-curricular activities such as sports or the play for the following 6 weeks. Please remember that you can always access Aeries 24/7 to see what your child is doing (or not doing) in each class. Please review it periodically and talk to your children about their performance. Let’s partner to foster the best performance of each and every student. Thank you. 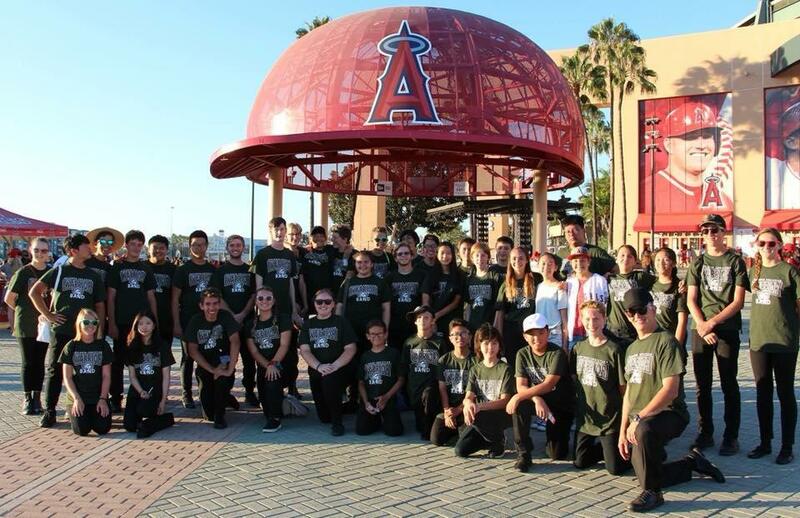 Congratulations to the BC band who performed the national anthem, along with other Southern California schools, at the Angel's game this past Saturday! Over 140 people from our BC community were at the game to cheer on our band and to watch the game together. Kudos to Mr. Montgomery and his talented band members for making us all proud! Make sure to check out the video of their performance! 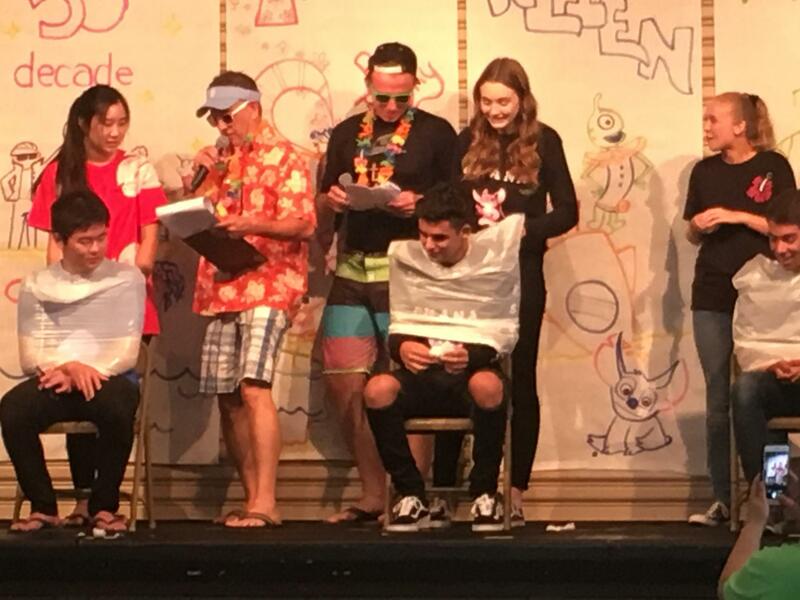 Andrew Shiroma, Colby Peterson, Paige Coultrop (Program Manager), Maddie Zone and Kaito Ochia presented a wonderful assembly this week to show the school what the ISS Program is all about. Kudos to them and Program Mentor, Mr. Mike Donahoe for the assembly and for advancing space exploration at BC! Come out and support BCHS! On Thursday, Sept. 27th, First Class Pizza Fountain Valley will donate 15% of sales to Brethren’s PFC between 11AM and 9PM. Orders must be dine in or take out. For more information and to download the required flyer to present when you make your purchase, visit the Dine Out Event Page. 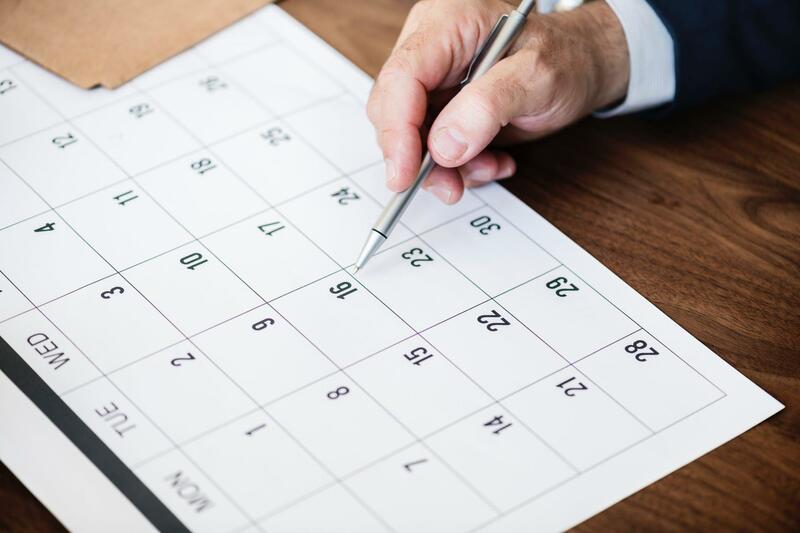 You can download the BC calendar onto your smart phone or desktop calendar and stay up to date with all upcoming events and schedule changes or updates to our main calendar. Simply go to www.bchs.net/calendar/, look on the upper right hand side of the page, and click the “Subscribe” button. 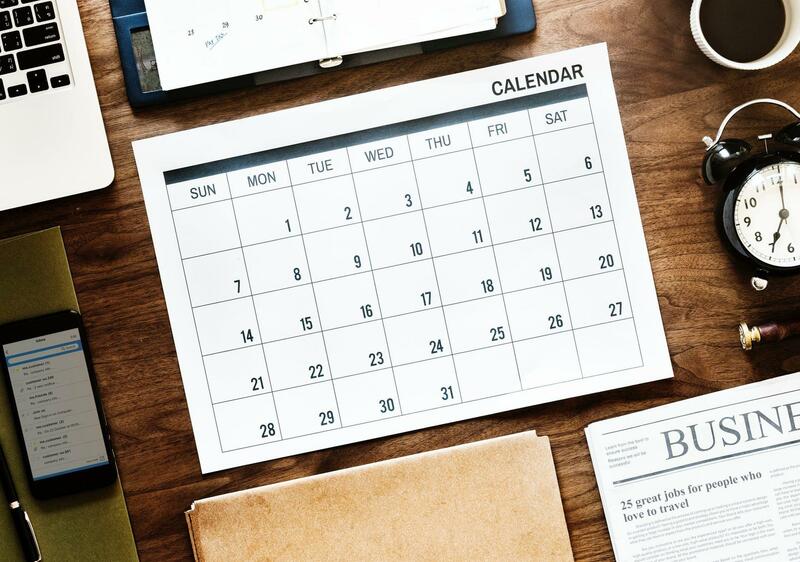 If you have an iCal, Outlook, or Google calendar, you can sync the BC calendar with yours and have all of our events instantly on your smart phone or home computer. You can also download our 2018-19 Year At A Glance PDF (this PDF will not reflect cancellations or changes as does the website calendar). We had our first meeting of this club intended for all students to learn about different cultures. 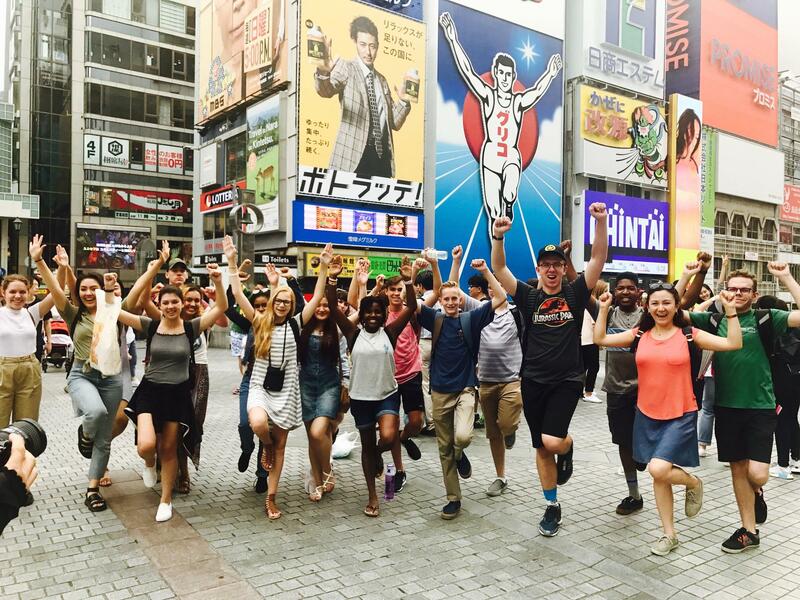 A goal of the club is for American and International students to become more socially integrated. We had Chinese food, talked about faith approaches in the US and Asia, and had a chop-stick eating competition. Kudos to the student leaders of this club for putting together a great first event! 3. Save the date: Color Run Saturday April 6th – committee forming now! 5. 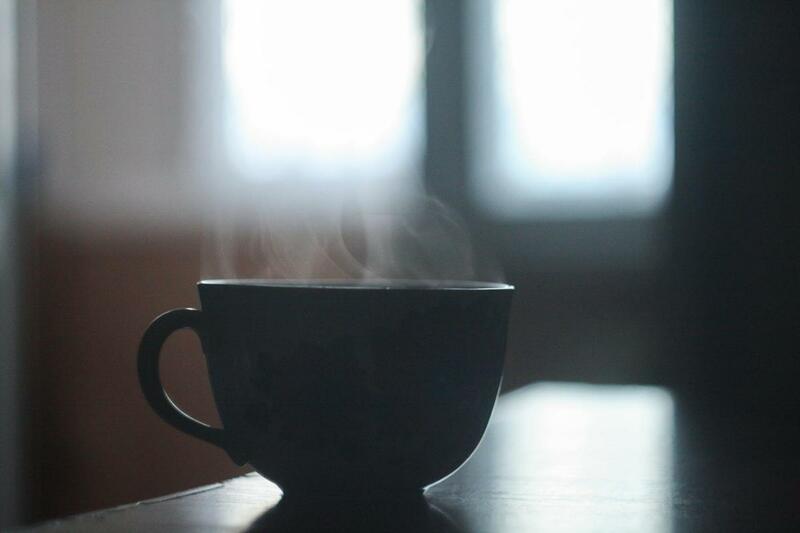 Save the date: Friday Morning Fellowship with Dr. Moran occurs at 8AM on campus every first Friday of the month. This is a time of fellowship with other parents and the Superintendent on an informal level. So be imitators of God, as his dear children. We have always worked to foster a culture of student responsibility at BC, and our block schedule necessitates an even keener focus on this due to “free” times built into the block. 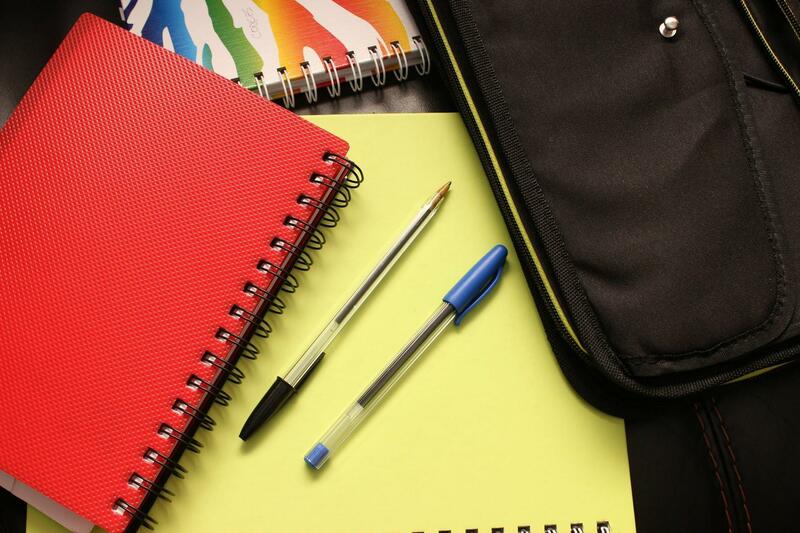 A student may use that time to do homework, study for a test or to visit a teacher in the classroom for extra help. Conversely, they may use the time to talk with friends, play games or be idle. While there is some benefit to having more “free” time, we encourage students to utilize most or all of these times to engage in productive learning, leadership or club activities. We wish to partner with parents to encourage students to use their new freedom responsibly in ways that lead to personal development – not wasted time. Let’s all work together to create this culture of responsibility with our students. Thank you. Our PFC President, Mrs. Janice Royal, M.A., is an Independent College Admissions Counselor, and she will be hosting two admission seminars on our campus. 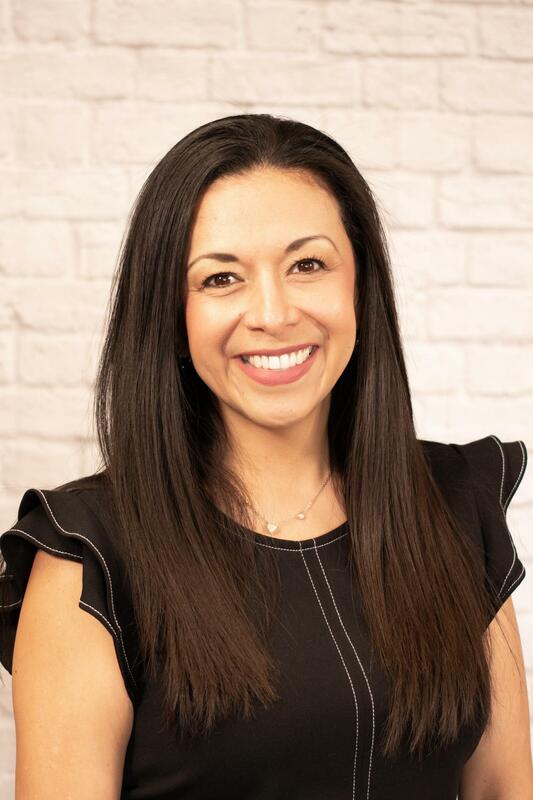 She will walk students and families through the college admissions process with a focus on each field of the UC and Cal State University applications. Mrs. Royal will guide each student to presenting their “BEST YOU” on their applications! 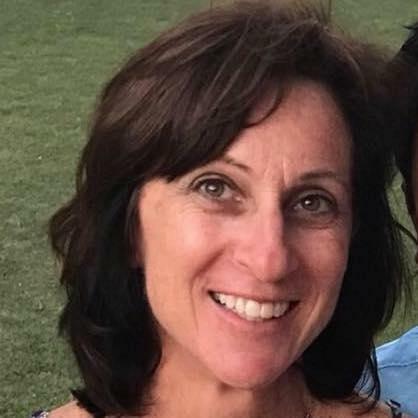 She will give advice on the UC Application at 5PM on October 3rd, and she will provide instruction regarding the Cal State Application on Thursday, October 11th at 5PM. Please contact royal@sbcglobal.net for more information and to RSVP no later than October 2nd. Our BC Warrior 8-man football team beat La Vern Lutheran! I am proud of the effort and spirit our young men are displaying on and off the field. Congratulations to them, the coaches and all of our football supporters for making this comeback season a true success. Please join us on our campus for the next Football Game tomorrow at 12 noon! 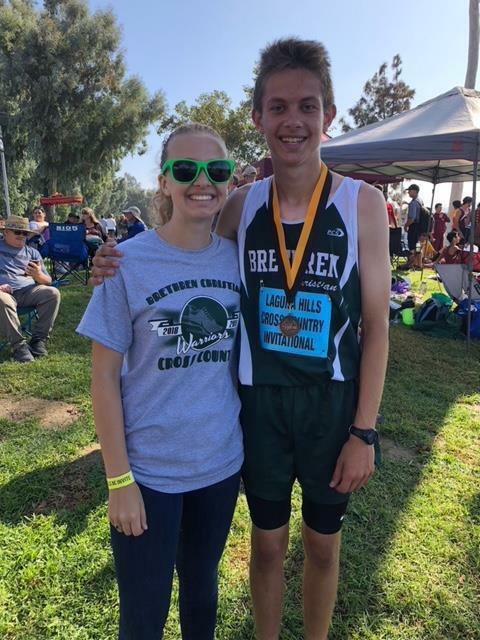 Congratulations to Cameron Wilhite, our Cross Country Warrior who ran a great race last Saturday at the Laguna Hills Invitational. His time was 19 minutes 25 seconds, a 2 min 30 sec improvement over his time last year. He received a medal for placing 40th out of 147 runners in the Sophomore Division. Junior Shirlyn Rhee ( 27 minutes 3 seconds) and Freshman Kate Johnson (28 minutes 4 seconds) also ran great races. 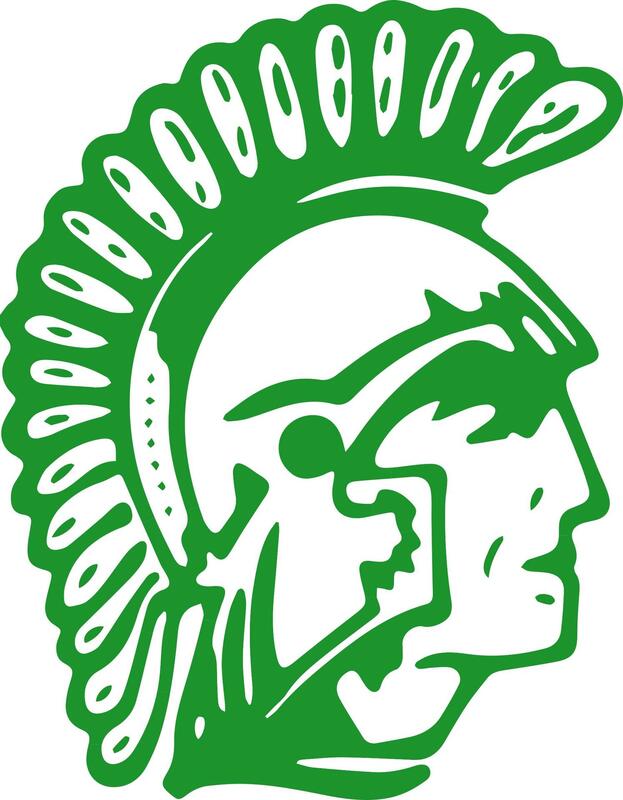 Congratulations to the entire Cross Country team as they prepare for their first League meet on September 17, 2019 at Mason Regional Park at 3:00PM. GO WARRIORS! 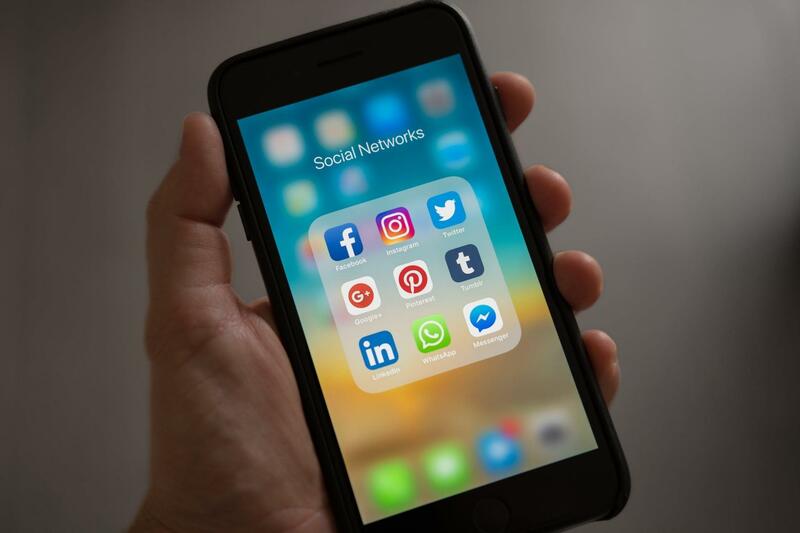 Did you know that BC has a number of social media outlets, including Facebook, Instagram, and Yelp? Please stop by and like our pages, or leave a review about how much you love BC! The BC band will be performing the national anthem, along with other Southern California schools, at the Angel's game this Saturday! Over 140 people from our BC community will be going to the game to cheer on our band and watch the game together. We know Mr. Montgomery and his talented band members will make us proud! Our amazing ASB (Student Government) has been working hard this year to encourage the BC community to be a place of joy and camaraderie. Spirit Week takes place all of next week, and it is a time of fun activities and competitions, including dressing up in fun costumes. 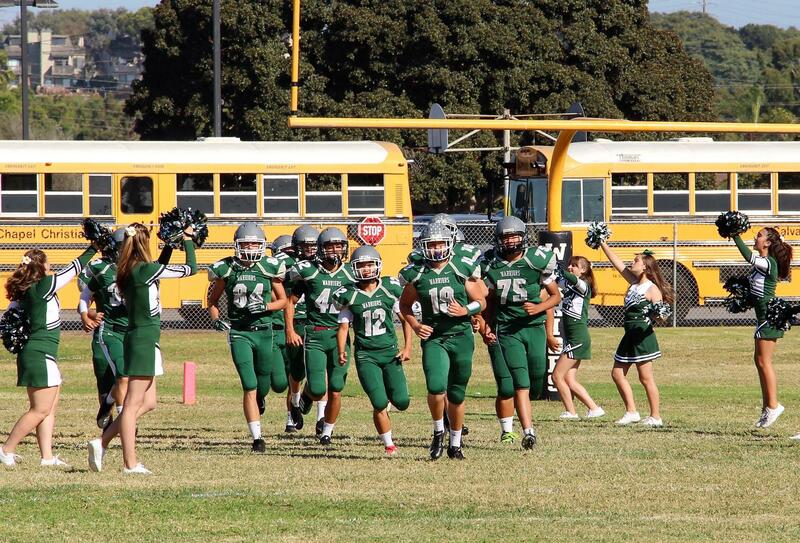 It culminates on Friday, Sept 21st with our Homecoming game at Brethren Christian School at 4PM. The whole community is invited to come and cheer on our school and enjoy the food, booths and games that will be available for all. 1. Dine Out 9/27 at First Class Pizza in Fountain Valley. 15% of sales goes back to BC! Program Mentor, Mr. Mike Donahoe, is leading a group of nine students to build and launch an original experiment to the ISS next April. There is room for more students, so please encourage your child(ren) to sign up for this unique learning opportunity. An experiment has just been chosen, and the design and build-out will follow. 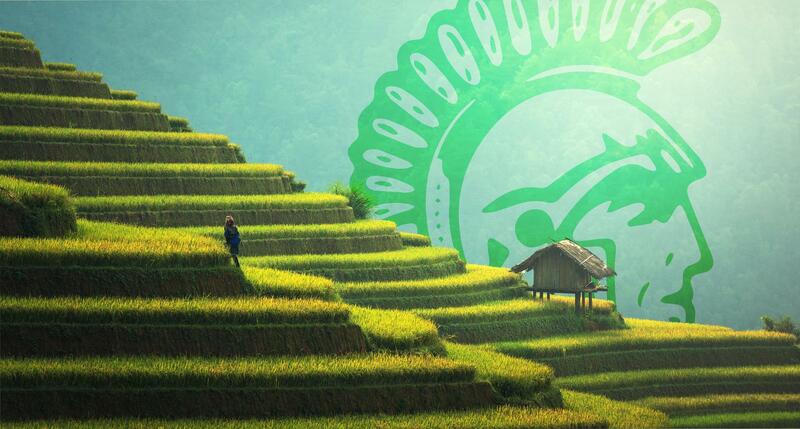 The success of this program depends upon human and financial resources. I have set a fundraising goal of $50,000 to support the total cost of this initiative, and I have already received a parent pledge of $20,000. Therefore, I am asking the BC community to donate the balance of $30,000 in tax-deductible donations by Thanksgiving of this year. I ask that you prayerfully consider a donation of any amount to help us reach our goal for this worthy effort. Thank you. Please join us on the morning of September 7th at 8AM in Room 202 for some light snacks, fellowship, and a time of Q&A with me and the PFC. Everyone is welcome! This Monday our campus will slow down for a special time of worship, fellowship, small group meetings focusing on a personal relationship with Jesus Christ. Students need to bring a camping chair or beach chair that can easily fold up to sit on during our time of worship (no couches or other types of chairs). School starts at 8AM and will be dismissed at 11:40AM. The bus will be scheduled to pick up our students at 12pm that day. Our Monthly PFC meeting is on Monday, September 10th at 7PM on campus. Please join us if you are interested in getting involved in the Parent Fellowship Council, or volunteering time to support BC in any way that you choose. Safety is our top priority at BC, so please remember to drop off and pick up your students behind the school in front of the rear entrance. Dropping off students in the front parking lot or on the street is dangerous, so please follow our parking guidelines. Thank you. 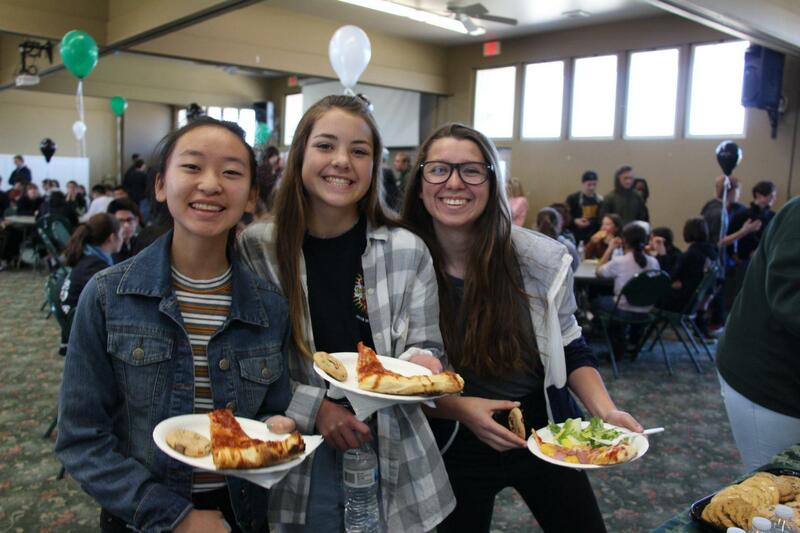 Brethren Christian School encourages students to explore and create programs outside of their regular academic classes. 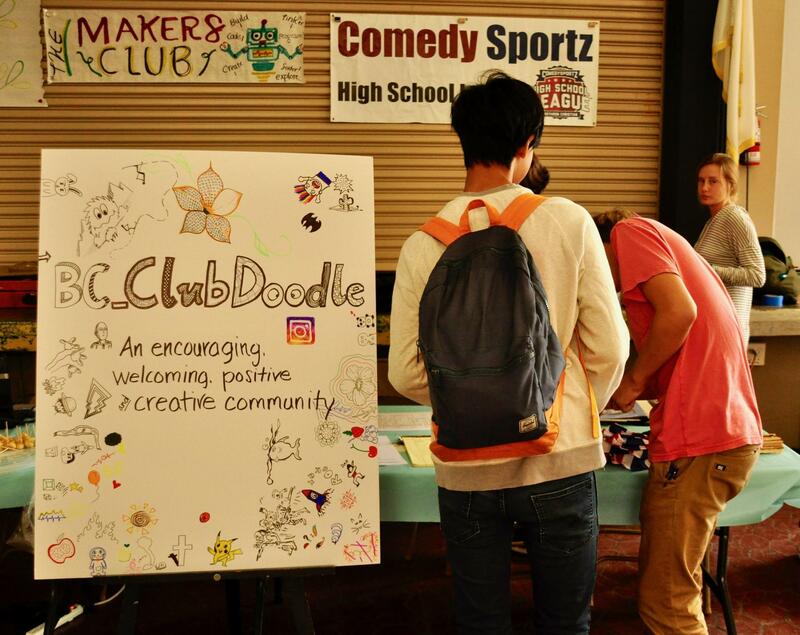 If your child is interested in joining one of our student/staff-led clubs, September 12th is the day where they can find out about what we offer on campus and to sign up! Please come out and support our Football Team, Cheerleaders and Band tomorrow at 11AM right here on our campus. You won’t want to miss this first ever 8-man game on our very own field. Go Warriors! 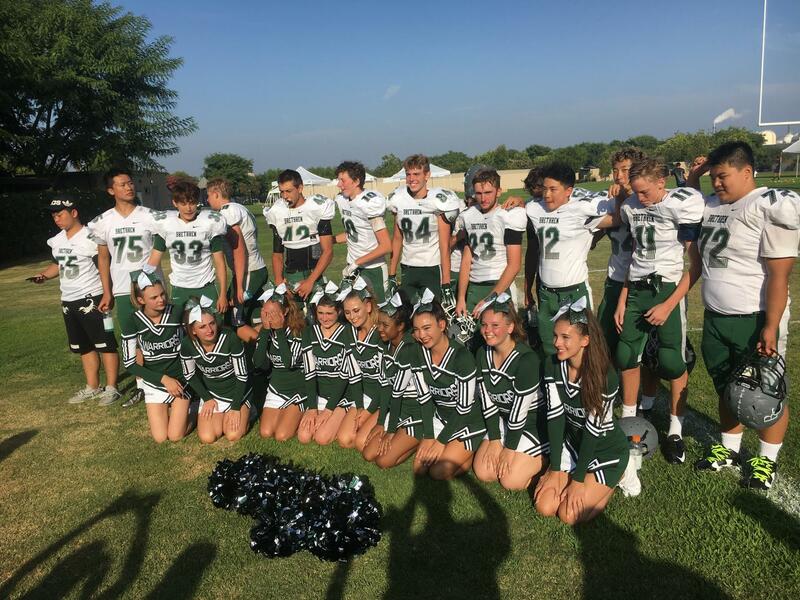 The team played a great game against Rolling Hills Prep last week, and our return to football was highlighted in the LA Times! We have updated our school year calendar. Please let us know when you see a discrepancy on the calendar, so we can correct it right away. Thank you. Our updated Parent/Student Handbook for the 2018/19 is now available via our website at www.bchs.net/handbook/. Please review it and use it as a reference. We understand that we have had some late deliveries and we are working with the company to resolve these issues. We are inviting all of our high school aged international students to come out to the Successful Strategies for University Admissions meeting . Friday, September 7th from 2:45pm to 3:20pm we are partnering with the Semita School and Dr. John Ahn to address specific questions about international students applying and enrolling into American Universities and colleges. Mrs. Martes and the Girls Volleyball team are hosting a fundraiser for their team. You can donate your old clothes or other items to them, and the Volleyball team gets a portion of the proceeds. Go to their fundraiser page for more information. Monday, Sept 10th is a half day! Our annual Friday For Him (Friday Forum) is going to be held on September 10th due to scheduling conflicts. We have an incredible worship band, three great guest speakers, small groups, and more planned for this lovely half day of school together. Students need to remember to bring a camping chair/ beach chair that can easily fold up to sit on during our time of worship. 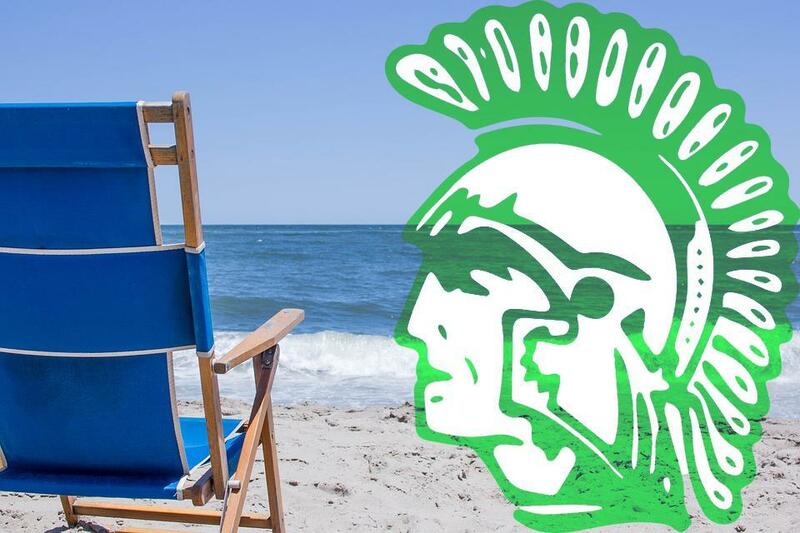 We will have metal chairs at the ready if you forget to bring a compact beach chair. Students arrive at school at 8:00 am and will be dismissed to be picked up at 11:40 am. 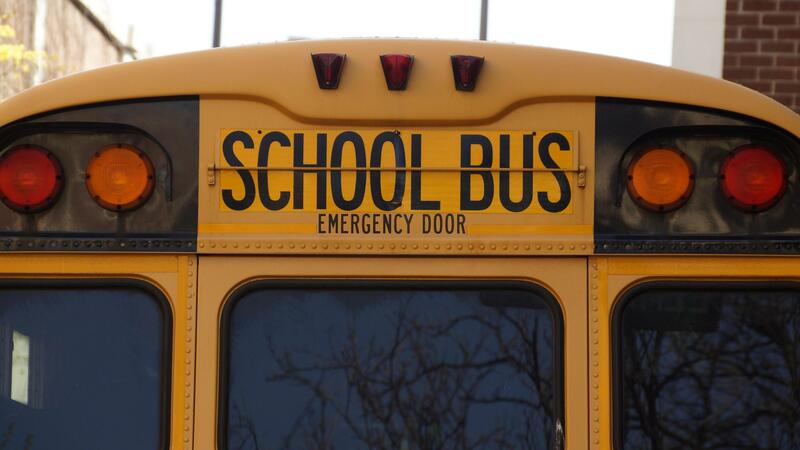 The School Bus schedule will also be adjust for drop off times after 12pm. 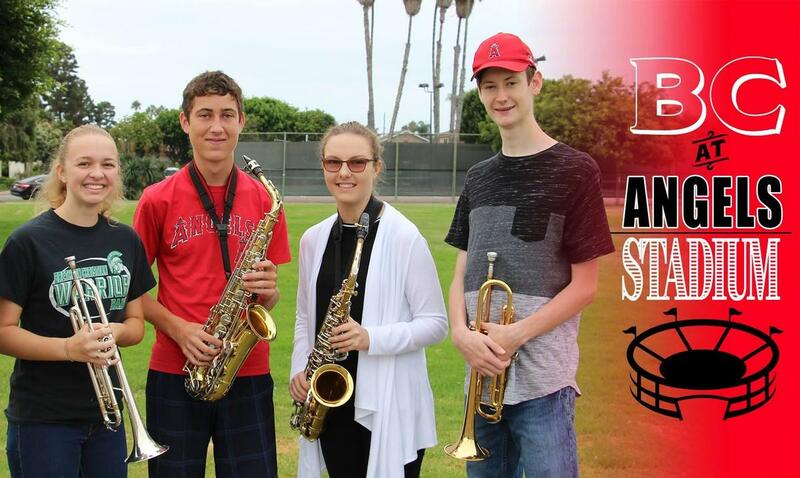 The Band is extending ticket requests until Tuesday for the September 15th Angels games where the BC band will be playing the National Anthem. The entire BC community is invited to get tickets where we will all get to sit together in the same section. Go to the ticket reservation page and then you can drop off your money at the front desk by Tuesday. Next PFC meeting is Monday, Sept 10 at 7pm at Brethren Christian School. Warrior Football returned to BC today! We wish Coach Green and all the players all the best. 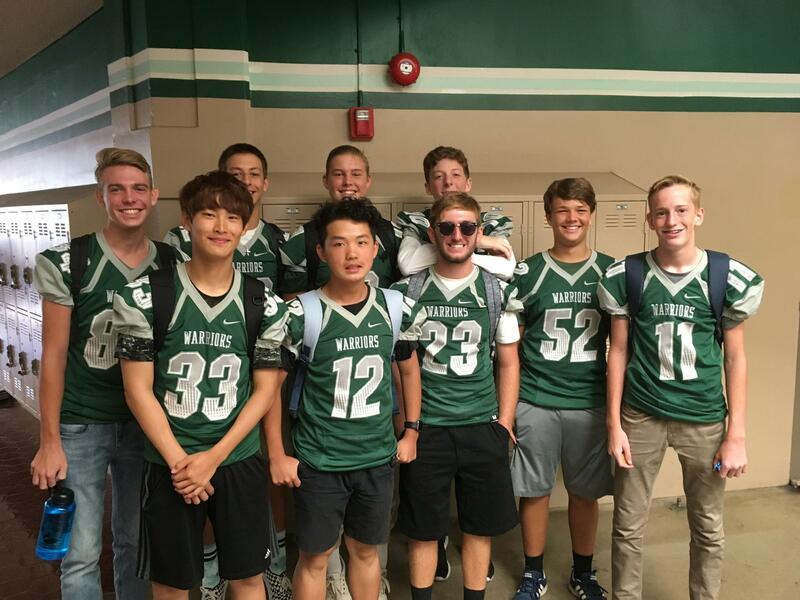 Please support Warriors Football by coming to the games and rooting us on. Please note that our Green Days (Tuesdays & Thursdays) end at 2:15. Students are in an Academic Support period from 1:40-2:15, so please do not pick up your students at 1:40. Please remember to drop off and pick up students in the large parking lot on the opposite side of the school from our main office. Thank you so much. We had a fantastic B2S Night this Wednesday! Thanks to all of those, who helped make it a great event, including the Teachers, PFC and other volunteers. Thanks also for all of the positive feedback on our great teachers, programs and changes this year. Please keep in close touch with your children’s teachers with any concerns you may have, and please partner with us by encouraging good study habits at home. Thank you. Thank you to those that signed up for the PFC on Back to School Night! There are many exciting events happening this year that the PFC needs your help with, so please contact them to help make BC the best it can be. Thank you. 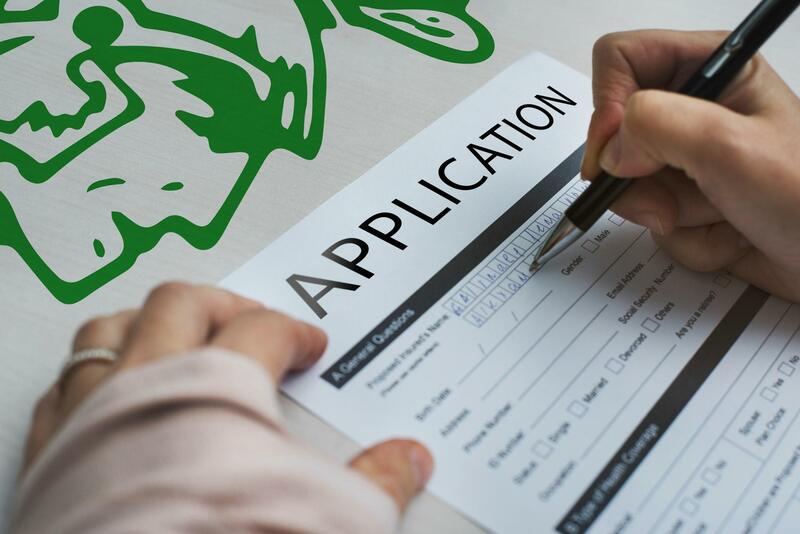 On Wednesday, August 29th at 7PM, College Planning Consultant, Janice Royal, will be joining us to discuss the senior application process and procedures one should be prepared for when looking at, and applying to, colleges. This includes a look at what happens in the review process and what "best practices" you should follow. Please RSVP with Dorothy Heinz in the front office by Wednesday. I love the LORD, because He hears my voice and my supplications. Because He has inclined His ear to me, Therefore I shall call upon Him as long as I live. We have gotten off to a great start to the school year. There were a couple of speed bumps, but we have navigated past those. I have had the chance to observe our new teachers, and they are connecting with students and using effective methods to teach their subject matter. Our Assembly on Tuesday was a time to share important information with students and to challenge each one of them to personal growth this year. 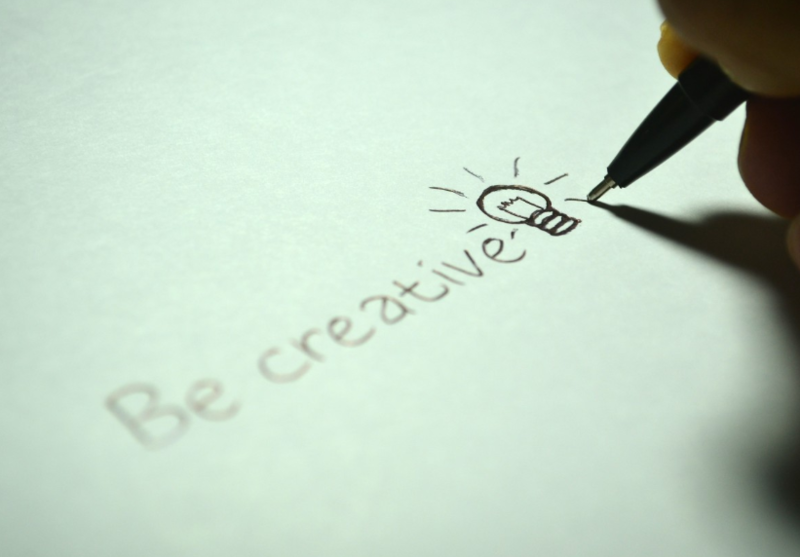 Our block schedule allows more time for teacher training each week, and this week we focused on fostering the creativity God has given each student. 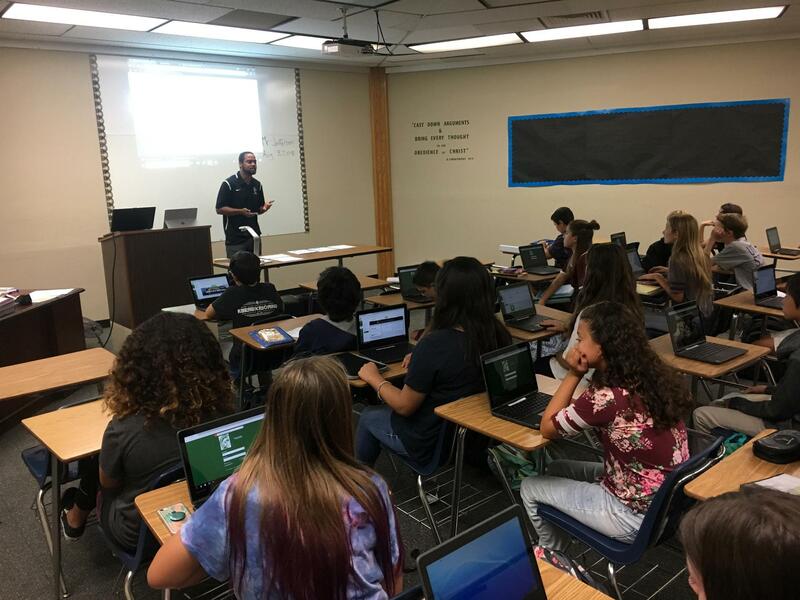 We are also sharing best practices with the Chromebooks, and it is exciting to see the enthusiasm our teachers and students have in using the new technology. Students are being trained on Canvas and Aeries during the Academic Support times in our block schedules this week and next. BC families, please join us for BC's Back to School Night on Wednesday, August 22! We will be starting the night at 5:30PM with a free BBQ and fellowship in the Mall provided by the PFC. You can visit classrooms and talk to teachers at 6:40PM. Please RSVP at www.bchs.net/bbq/, so we can plan for how much food to provide. A special thank you to Mrs. Stone and the PFC for making this event happen!. Parents often ask me how they can help the school, and I tell them that the very best way is to get involved with the PFC. We have a small group of dedicated parents, who regularly volunteer, but they need your help. Please come to the next meeting and find out how you can help make BC a better place for our entire school community. Thanks so much. 1. Please Turn in Box Tops for Education in the Main Office ASAP for the October submission date. 2. Our next PFC meeting will be held on 9/10 from 7-8:30 PM in Dr. Moran’s Office.There are many committees to join and opportunities to get involved. 3. Please take a look at the teacher “wish lists” and “favorite things” in the notebook in the front office.We could use all the donations we can get. We are not offering an after school program for our students, so ALL students must leave the campus at the end of the school day unless they are involved in a school sponsored activity, such as: sports, clubs, band, etc. Thank you. We have had some coyotes wander through our field this first week, but there is no need for alarm. They pass through quickly and are not ordinarily a risk to humans, except for very small children. With that said, our armed security guard checks these animals when sited. 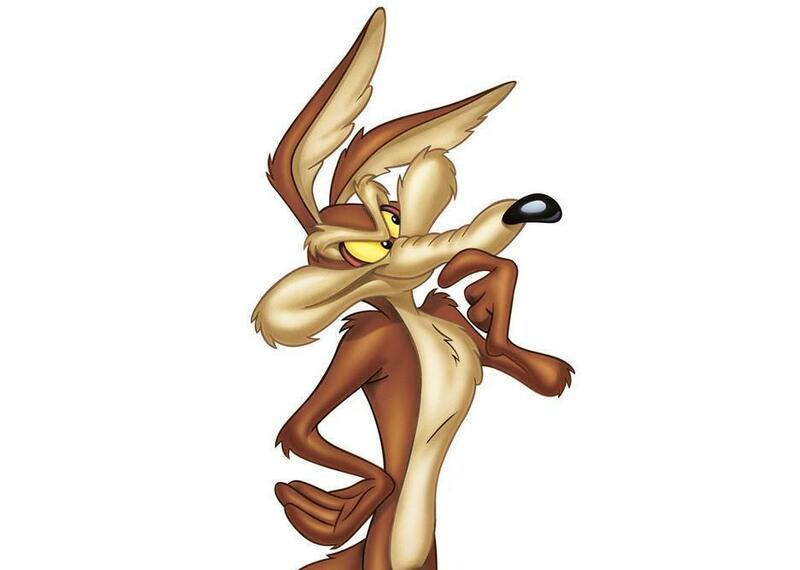 It would be best to call the school when you hear of a coyote on campus instead of calling the police or other authorities for two reasons: the coyotes are gone before the authorities get here, and we now have our own security that can deal with the coyotes. We will definitely keep a close eye on this. We will be hosting 30 Chinese high school students next week from Monday through Wednesday for an English immersion experience. They will be auditing classes and eating lunch with our students. They will be well supervised, and they will also be given Bibles in Mandarin. Please pray for the Lord to bless this experience for all of our students. 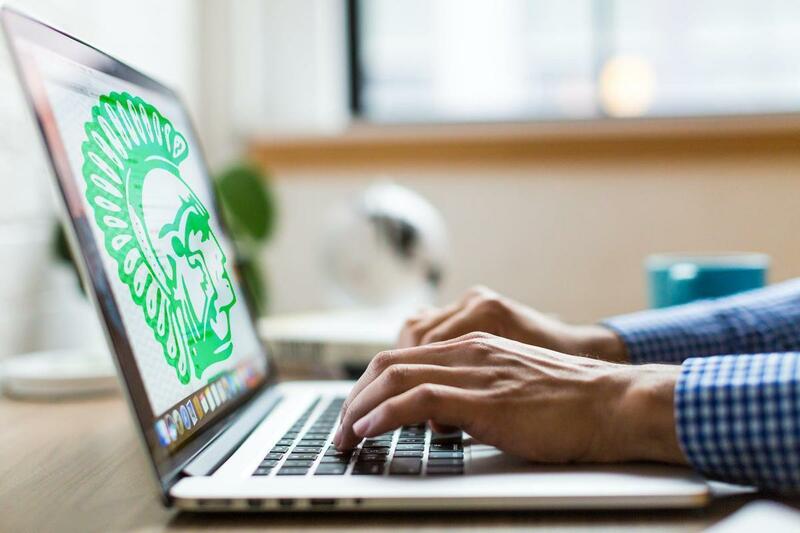 It's a new year, and if you need a reminder on how to use Canvas, or if you are a first-time user, you can navigate to our BC Parents page for instructions on how to set up your account. 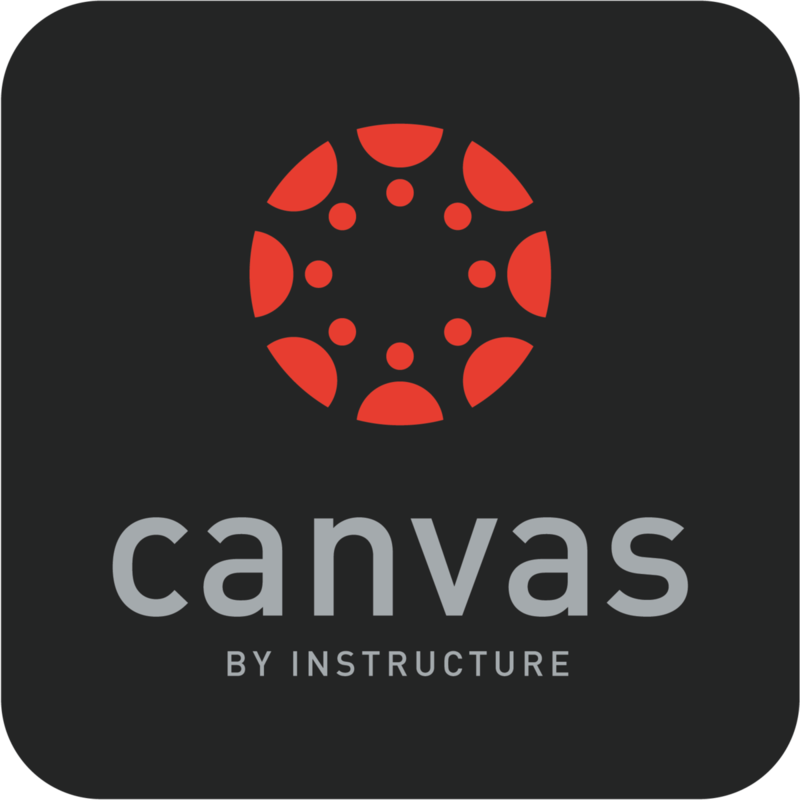 Canvas is our online learning module in which you can check and see the assignments that your student is working on - and when they upload them for teacher review. Take full advantage of our technological approach to education by getting plugged into Canvas today! This Monday, August 20th, all seniors will be having their senior portraits taken. Men, please wear a sports coat and tie, and ladies, a nice outfit, for your pictures. This is for 12th grade only. 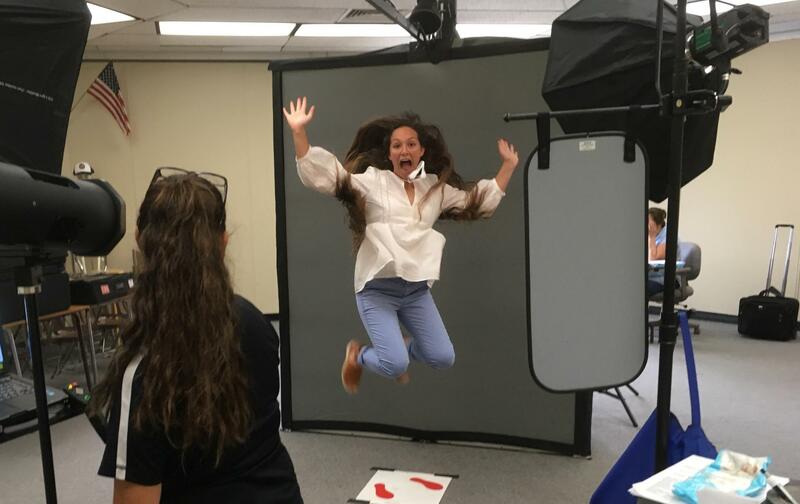 The following Monday, August 27th, we will be doing make-up photos for ID cards for anyone who did not get their picture taken on Registration Day. But he who boasts is to boast in the Lord. For it is not he who commends himself that is approved, but he whom the Lord commends. We have had a great week of staff and teacher orientation, and we are ready to launch a fantastic year for your students! 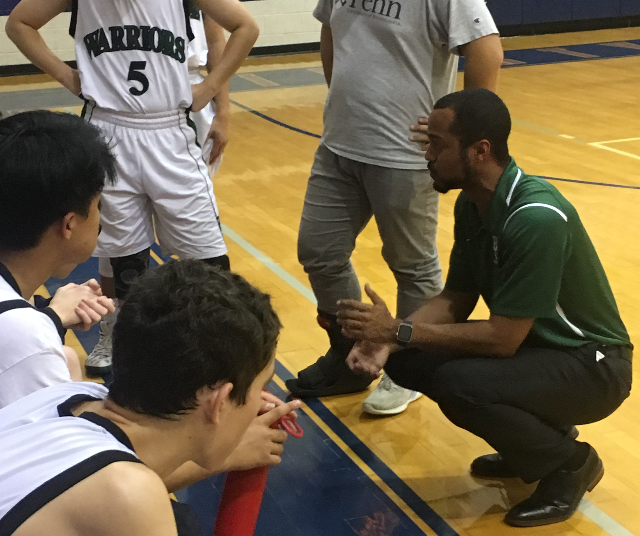 He will teach Math 7, Bible 7, Health & PE, and he will be coaching boys varsity basketball. Mr. Jefferson holds a BA degree in Psychology with a minor in Communications from Trinity Christian College. He is a graduate of BC and is respected by the entire community. He will be teaching AP Bio, Bio, Life Science 7 & Options Life Science. 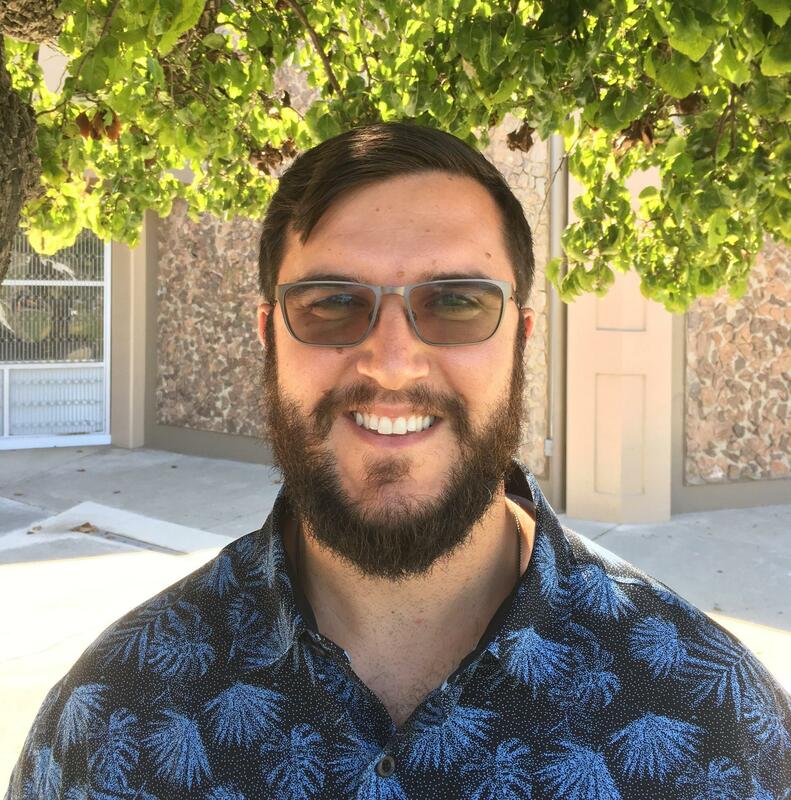 Mr. Smith holds a BS in Biology from Biola University and an Master of Divinity from Westminster Seminary. He has solid teaching experience, and we believe he is going to do a great job teaching the life sciences at BC. 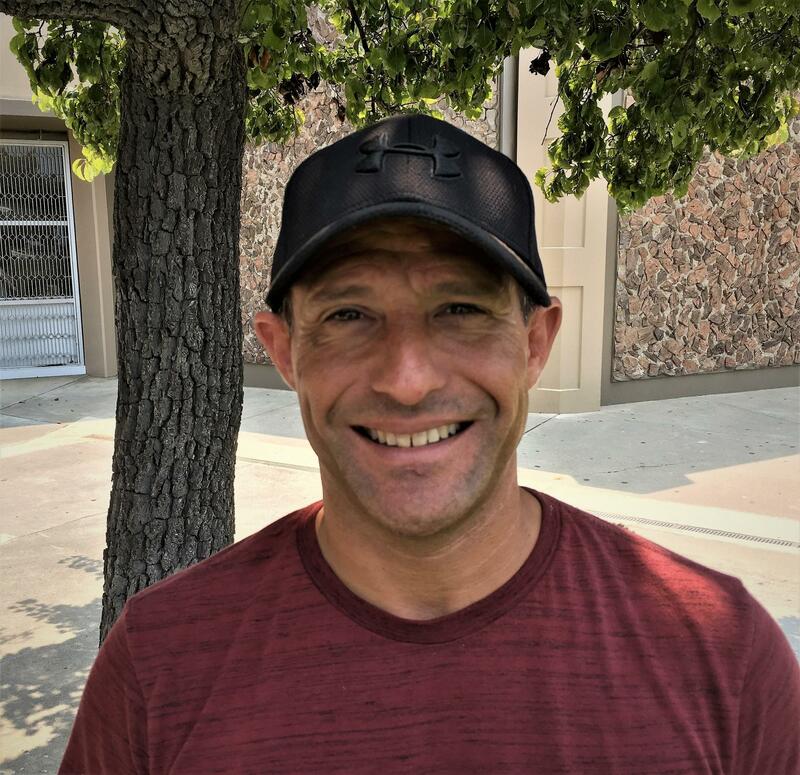 He will be teaching Chemistry, Physics, 8th grade Physical Science & Algebra I. Mr. Weir holds a BA degree in Chemistry from Sonoma State University, as well as a Single Subject Credential. He is an experienced teacher, who combines exceptional academic ability with a great relational approach to students. She will be teaching Algebra II, Math Analysis/Trig & AP Calculus. 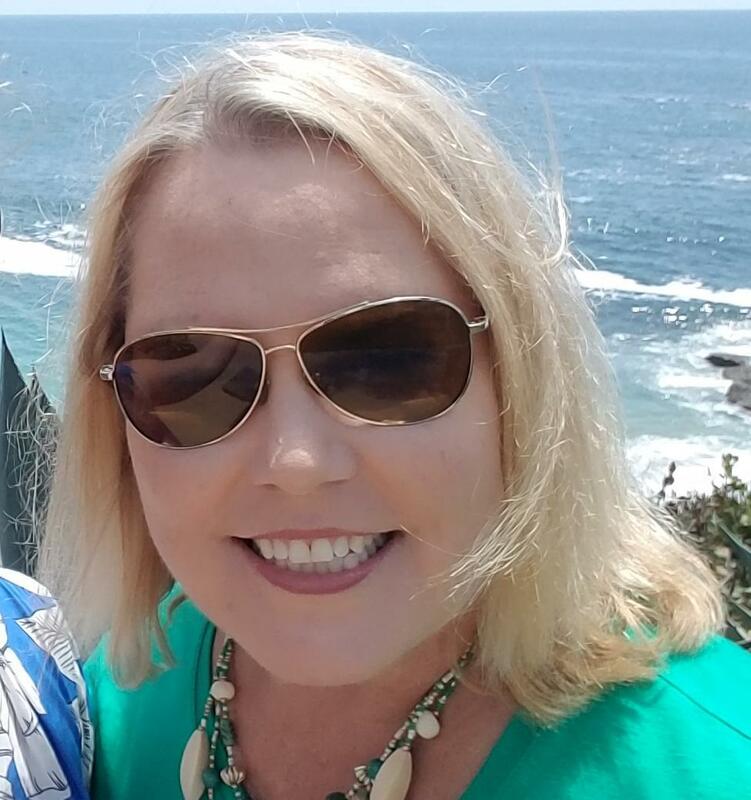 Mrs. Hanson holds a Bachelors degree in Business Finance from CSUF, and a Masters degree in Math Education from CSULB. 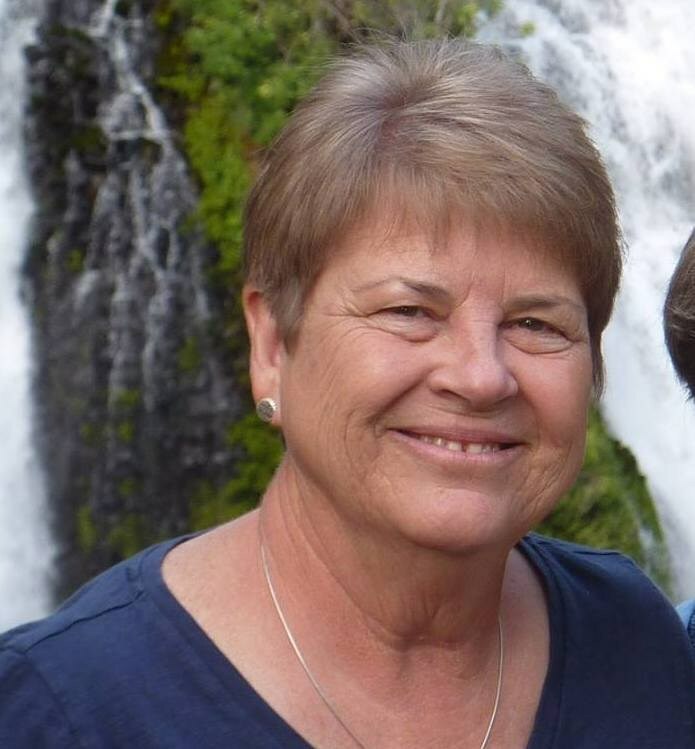 She comes to us with strong teaching experience at Mariners Christian School. Her son Sterling graduated from BC last spring. Mr. Reyes is our new Security Guard. He is a 20 year veteran of the LA County Sheriff’s Department, and he is licensed to open carry a sidearm. He will be providing a deterrence as well as responding to any security issues in real time. 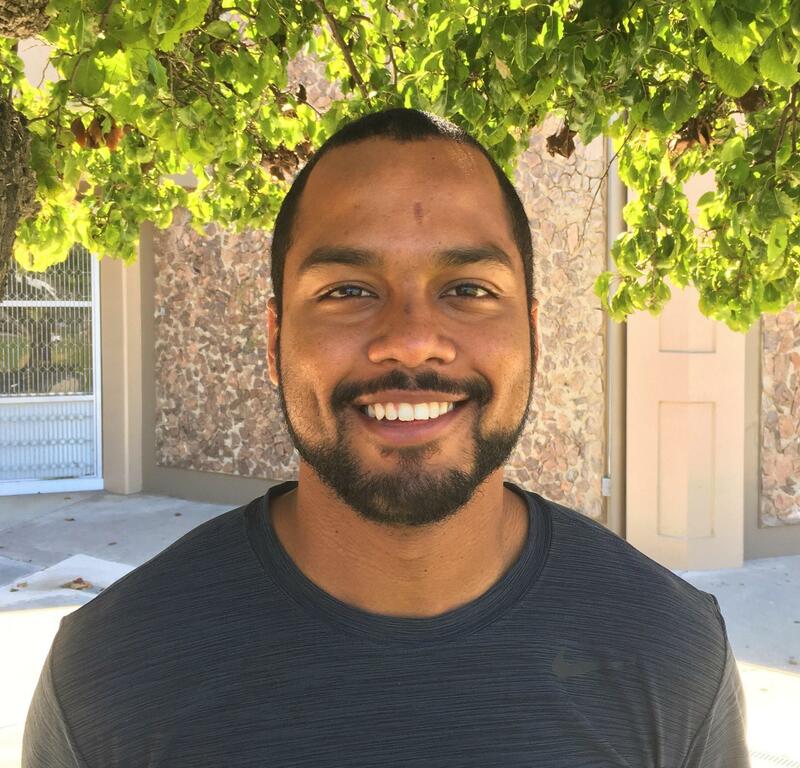 Officer Reyes will: patrol the campus, supervise carpool and lunches, and help with maintenance/cleaning as needed. Please give a big Warriors Welcome to our new teachers and staff. Our entire team is ready to go, and we can't wait to see all of you on Monday morning! I hope you are all enjoying the summer! I want to share my enthusiasm with you about the upcoming year and about the new opportunities a BC education will afford your children. I look forward to seeing you tomorrow at Registration Day from 9AM-3PM, where your students will get their Chromebooks. Our teachers have been preparing to deliver innovative, high-tech teaching and learning approaches this year, and they will do so in our more flexible Block Schedule approach. I am confident that you will see and feel the difference. Please read below about some additional highlights for 2018/19, and thank you for being part of the rebirth of BC as we build for a bold new future of exceptional Christian education. I am thrilled to announce that BC will conduct the International Space Station (ISS) Program this school year! Mr. Mike Donahoe will be the Program Facilitator of this applied science, computer and engineering project. 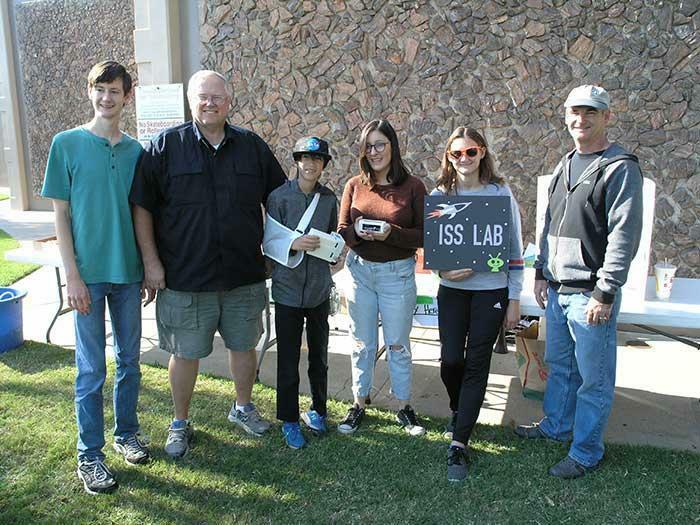 Our students will plan, build and send an experiment to the ISS aboard a SpaceX Rocket in April of 2019. 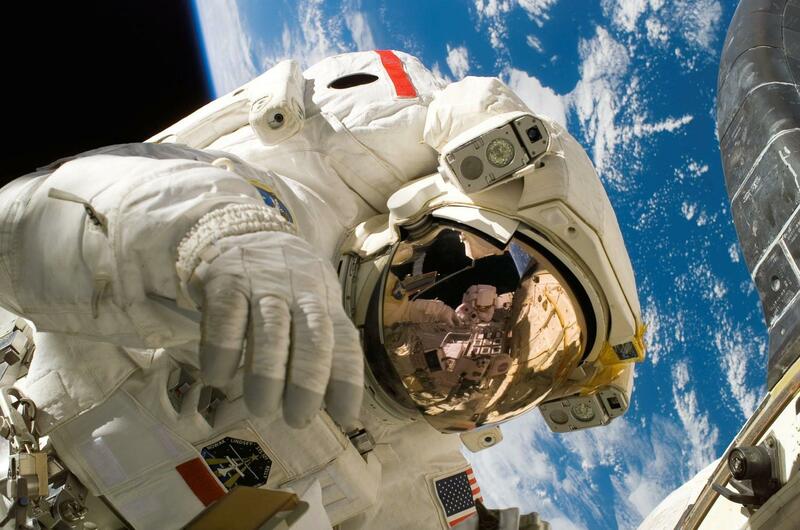 This program is conducted in conjunction with NASA and according to their specifications. I launched this program at Riverside Christian School 2 yeas in a row, so I can tell you that the student learning and growth is astronomical. Please visit Mr. Donahoe at our ISS table at Registration Day this Thursday, August 2nd, and be sure to have your child sign up to participate in this amazing program. 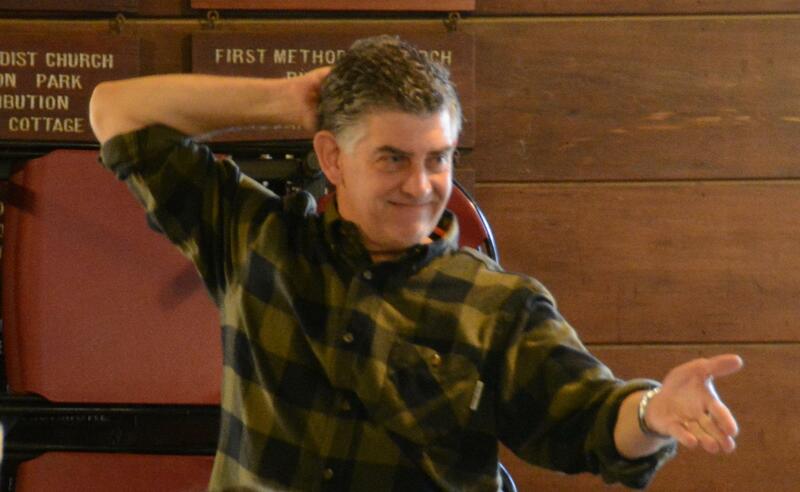 Mr. Donahoe is highly qualified to mentor our students to achieve the goals of this program. Please join me in thanking him for taking on this great project for our school! Football has returned to BC!!! Our 8-man football team is in place and the season is set to go! Our home games will be played here on our campus, and our band and cheerleaders are ready to support the team with Warriors spirit! 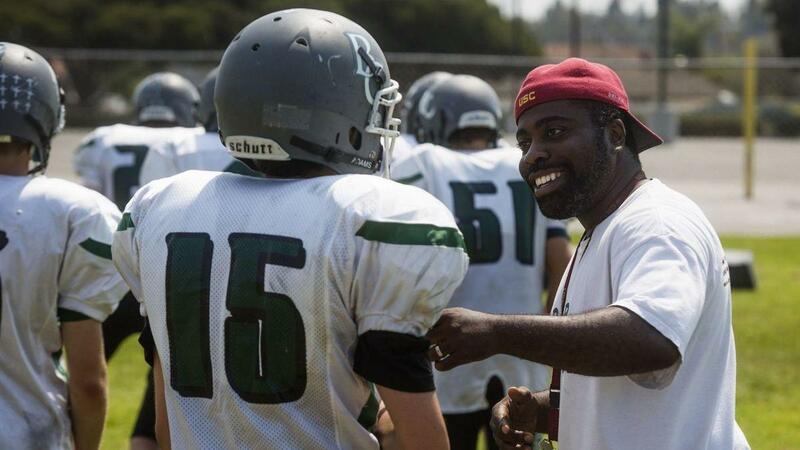 Head Coach, Leon Green, has been getting the team ready, and we are looking forward to a great season! You will be happy to know that Mrs. Griffin will be producing one play and one musical this year as usual. Comedy Sportz will be coached by Tivoli Jensen, and the Cappies will be advised by Mrs. Maresh. Stay tuned for details. 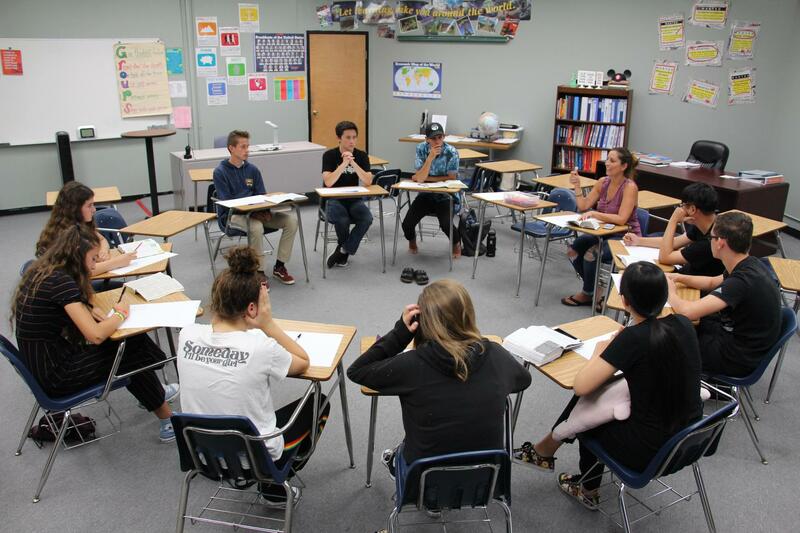 Mrs. Maresh will be coaching our new debate team, so please contact her at mmaresh@bchs.net to sign up for the team! 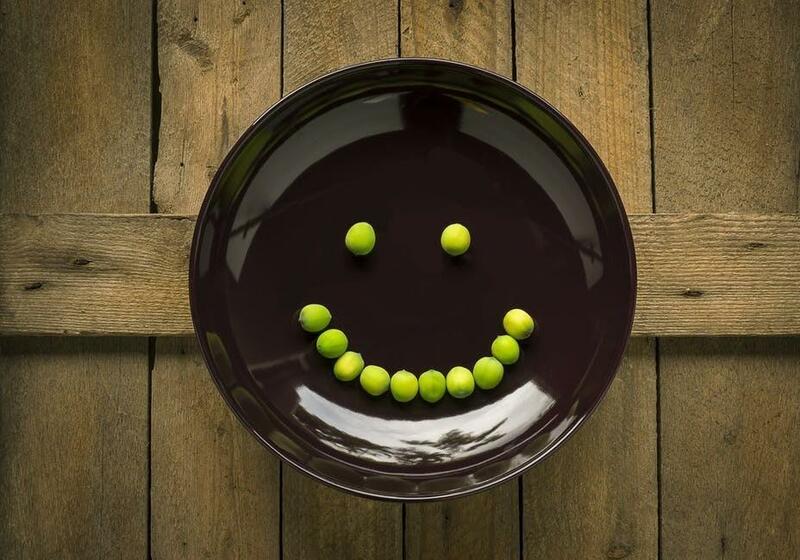 We have a great new approach to providing lunch to your children this year that I am sure you will love. 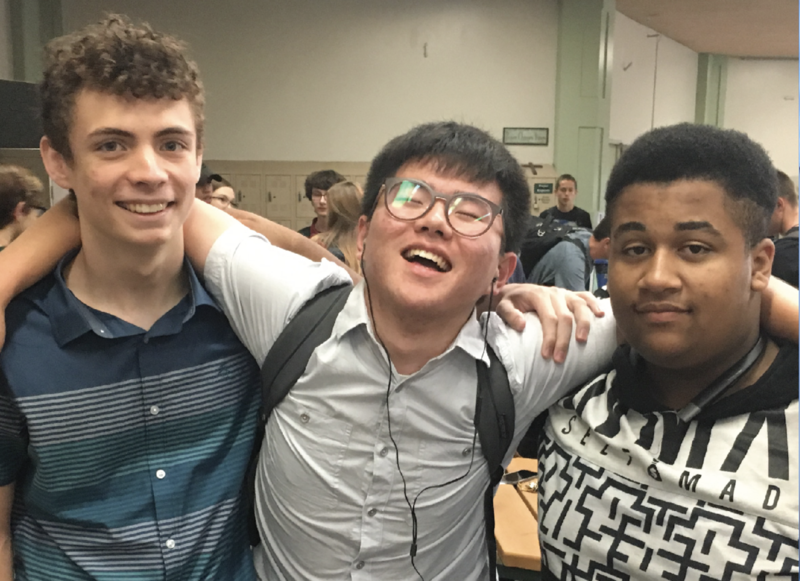 Yum Club orders food from your favorite restaurants and delivers it to the school each day. Please visit our website at www.bchs.net/lunch/ to sign up today. We will have a registration day on Thursday, August 2nd from 9AM-3PM. It is IMPORTANT that you read this entire notice, so you can be prepared for that day. Before August 2nd, please ensure you have completed the enrollment packet checklist, which can be viewed on our website. We will contact you before August 2nd if you have any missing items (please do NOT contact the office regarding this). • Pay remaining fees in the Business Office (we accept cash, check or credit card). We will send you a detailed list of steps to be taken on Registration day before August 2nd along with a map of the set up for the day. The office will be closed during the entire week of July 4th. We wish you a blessed and happy time as we celebrate the birth of our great nation. God bless America!!! 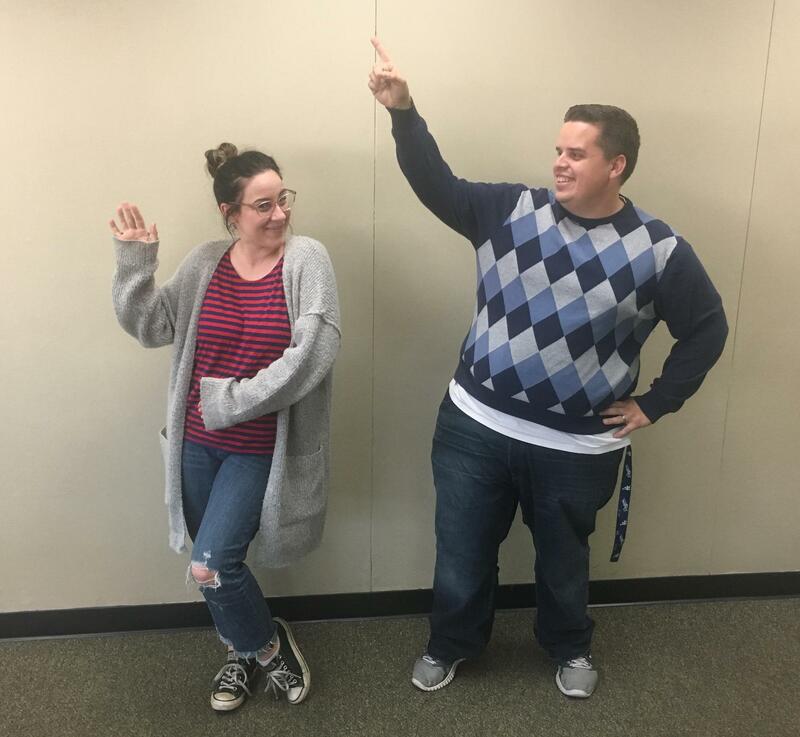 Mr. Osburn and Mrs. Heffernan will be Co-leading our Activities program next year, which includes ASB, Class Councils and Ambassadors. I could not think of two better people to do this. They are both passionate about taking on this role, and they will be meeting with some of the student leadership this summer to plan for a spectacular 2018/19 school year. Please join me in welcoming them to these new roles. Thank you! It is with great sadness, that I report the tragic death of David Rosa, who graduated from BC in 1991. 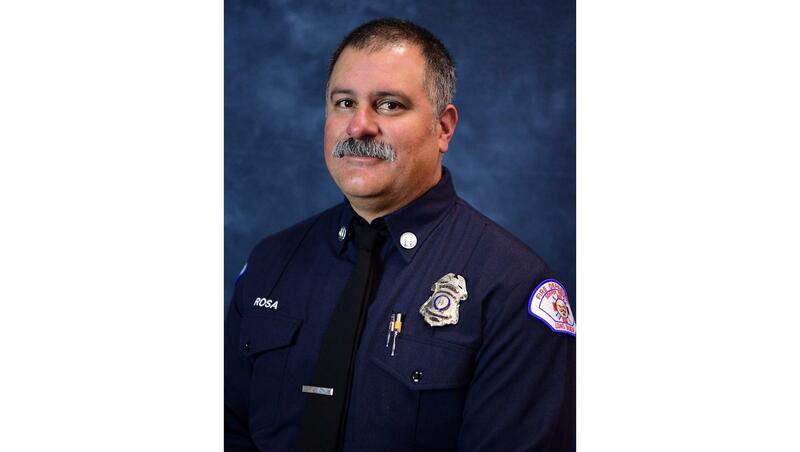 He later became the Fire Captain of Station 10 in Long Beach. 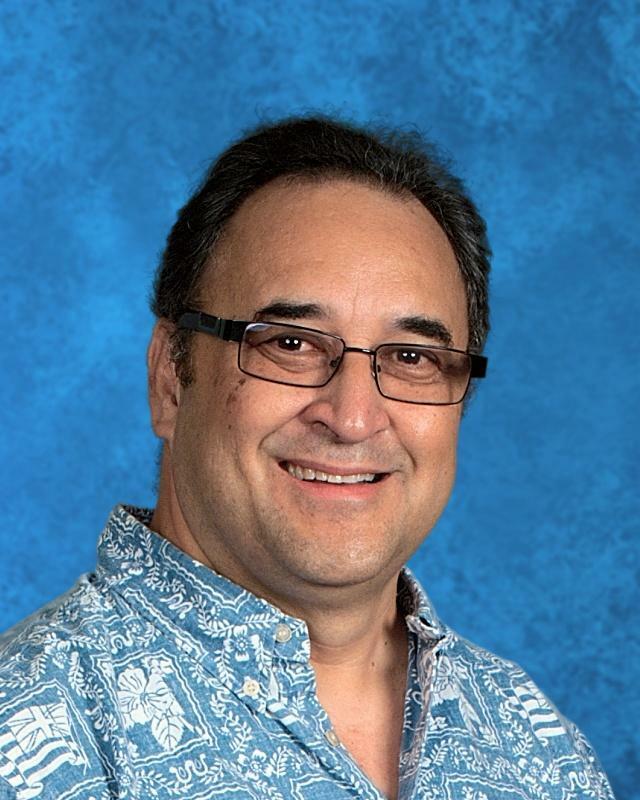 David’s father, Paul Rosa, was a long-time member of the BC School Board. David was senselessly slain, while fighting a fire on Monday, June 25th. This hits the BC Family hard, so we will fly our flag at half-staff this week to honor the memory of this great public servant and Warrior. 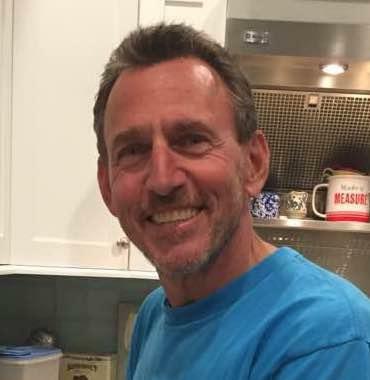 We will notify the community if we hear of any fundraisers to support the family. You can read the full story on the Press-Telegram website. Please join us in praying for the family. Thank you and God bless you all. I hope you are all enjoying this early summer weather as much as I am. I have truly become accustomed to the beach lifestyle this past year, even though I have not yet learned how to surf. As we end one year, and plan for the next, I wanted to take a few moments to share some important updates with you. Our 8th grade promotion and high school graduation were both well received from all whom attended. I am so proud of the wonderful young men and women who celebrated their accomplishments on these wonderful occasions. Our teachers and staff have been hard at work to make next year a great one! 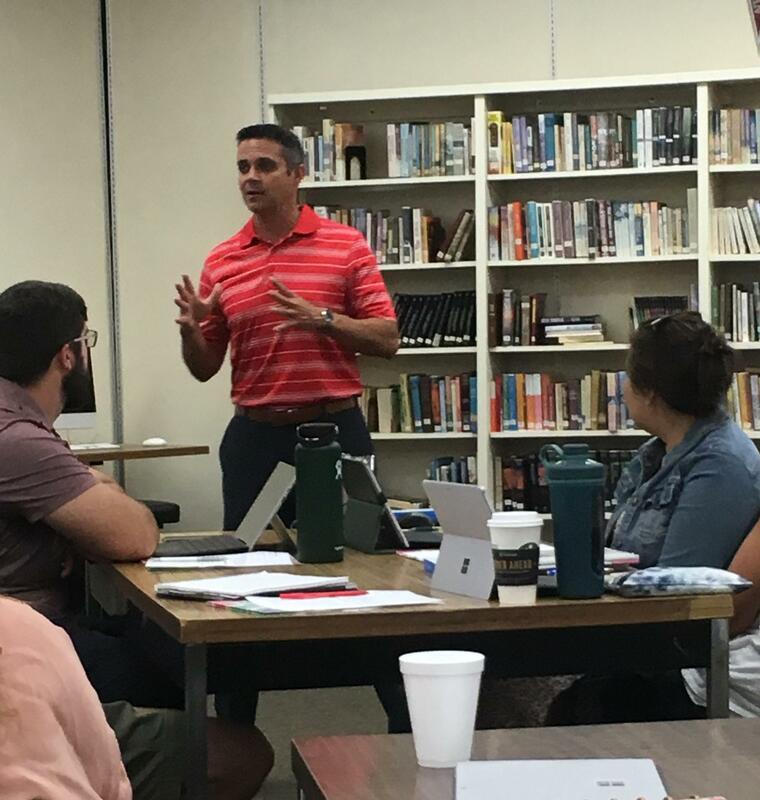 We had Block Schedule and Ed Tech training last week, and I can tell you that our teachers are excited about the new teaching and learning opportunities provided by the synergy of these two new approaches. Our team is completing the Self-Study for our ACSI/WASC joint accreditation process that occurs once every six years. This is a tremendous amount of work, but it focuses our self-reflection, and it serves to make us an even better school in all areas. Our Accreditation Team visit will be during the 3rd week of October, but there will be no interruption of classes or services during that time. Ms. Flippin is back at school! She is doing great and is experiencing a full recovery from surgery. She begins scheduling of next year’s classes this week, so stay tuned for updates on that. Our Junior High School enrollment has been dropping for a number of years, so we will be eliminating our 6th grade this coming school year. Since we just graduated 56 seniors, our overall enrollment will be a bit lower next year. This has precipitated some faculty and staff changes to come in line with our student population, while properly stewarding our finances. We will miss our departing staff, yet we will carry on the high quality of service and programming you have come to expect from BC. I want to thank Mrs. Staller, who led our Activities for many years here with quality and excellence. One of our teachers will be taking on this role, so stay tuned for an announcement on that soon. We have hired three new Math and Science teachers for next year. I will introduce them formally before the start of the year, but be assured that each of them is of the highest quality, and they will significantly strengthen our math and science programming. They are already beginning to prepare their lesson plans for the start of school on August 13th. 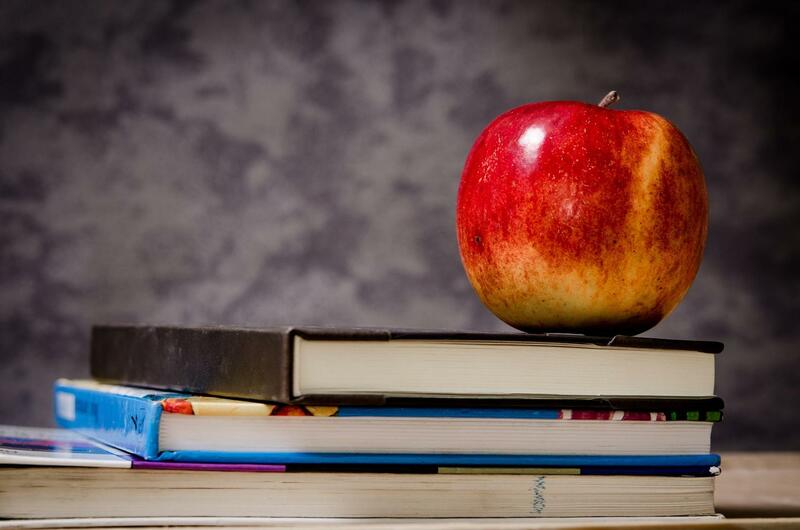 Some of you may have heard of Measure Q, which is a bond measure that provides for school building improvements for the Huntington Beach City School District (HBCSD). The BC school board and I have been in ongoing conversations with HBCSD regarding Measure Q as it relates to the Gisler Facility upon which we reside. I will keep you updated on this issue, but please know that BC will remain on the Gisler Facility next year. It is likely that we will move to a new facility in the next few years, but exact dates are not yet determined. I want to thank the HBCSD for working with us to achieve a win-win for their school system and ours. 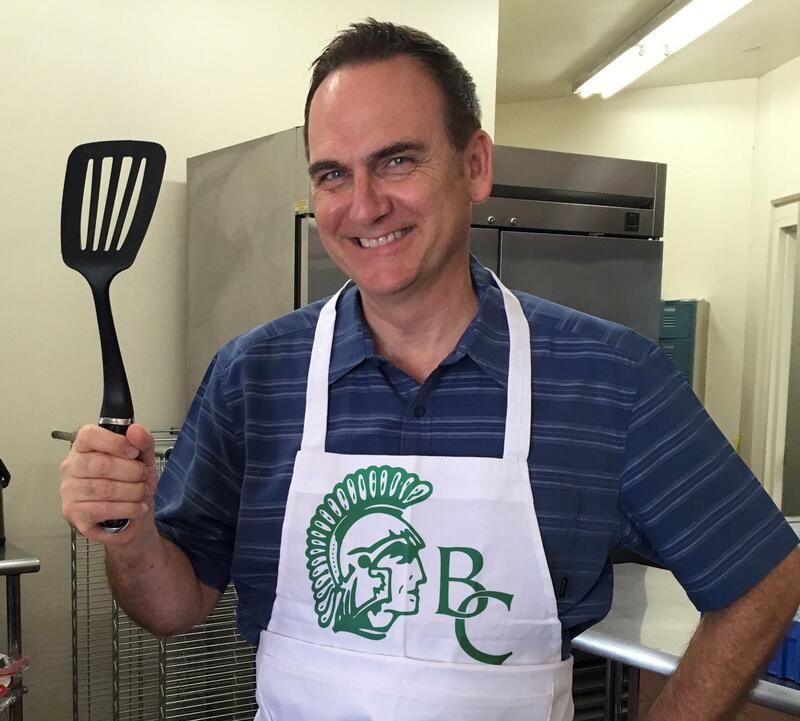 I encourage all members of the BC community to email me directly at jmoran@bchs.net with any questions or concerns you may have about our great school. I will continue to communicate with you over the summer, but I will be out of the office intermittently until August. 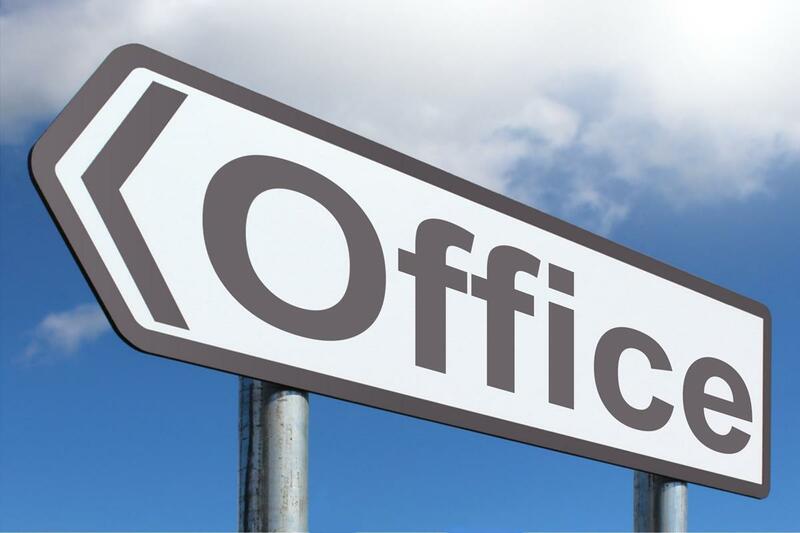 However, we will have staff working in the office from 9AM-3PM every day throughout the summer to meet any need you may have. I thank God for the miraculous year we have just concluded, and I hope you join me in my excitement about the great year ahead. In the meantime, I wish you and your families, a safe, happy and blessed summer! 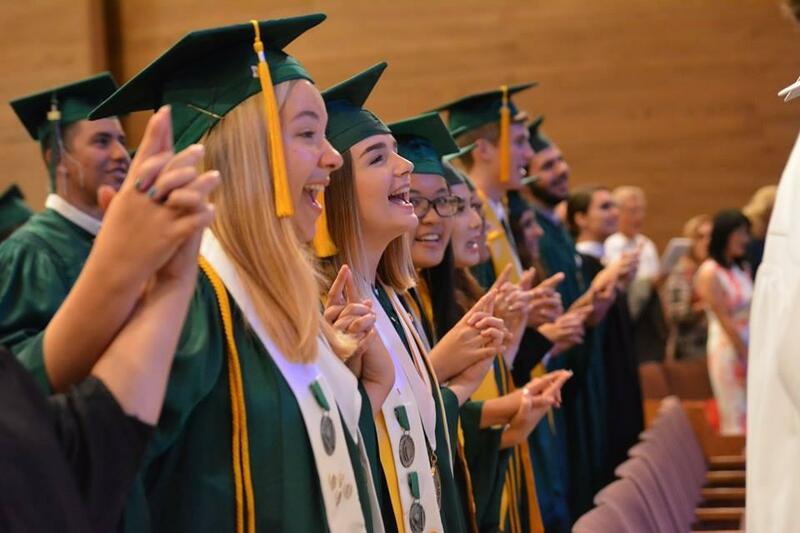 We look forward to a special commencement ceremony for our seniors this year, which will be held at Mariners Church HB at the corner of Warner and Beach on June 9th at 2pm. We will NOT have unlimited seating, so each graduate has been granted a limited number of tickets for friends and family. We know that alumni and others ordinarily come to the commencements even if not invited, but folks won’t be able to enter the venue without a ticket this year due to the limited size of the hall. I wanted you to know this in advance, so there are no disappointments on June 9th. Thanks everyone. It also helps when applying to top colleges and universities. This is another step forward in making BC a top preparatory school. Kudos to Mrs. Marcia Maresh for making this happen. Please contact her at mmaresh@bchs.net with any questions or if your children want to join the team. 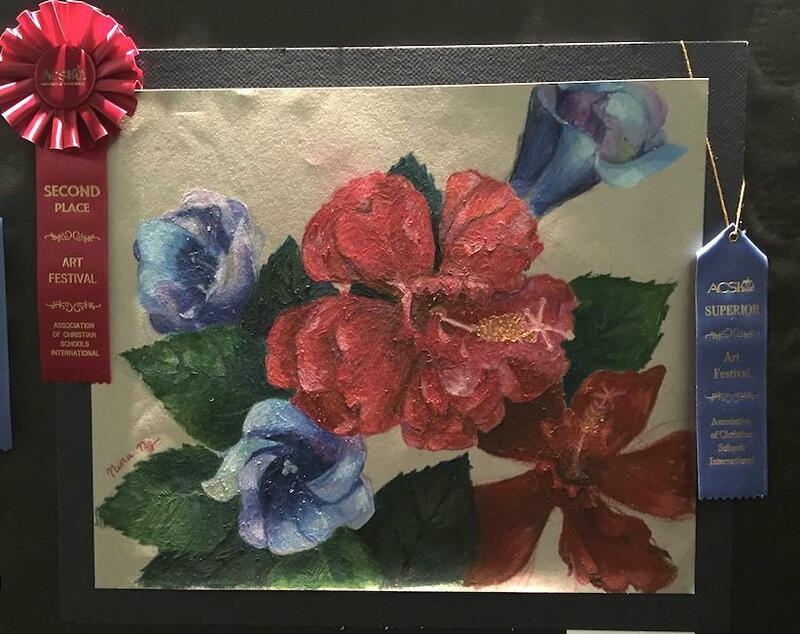 CONGRATULATIONS to our talented art students!!! 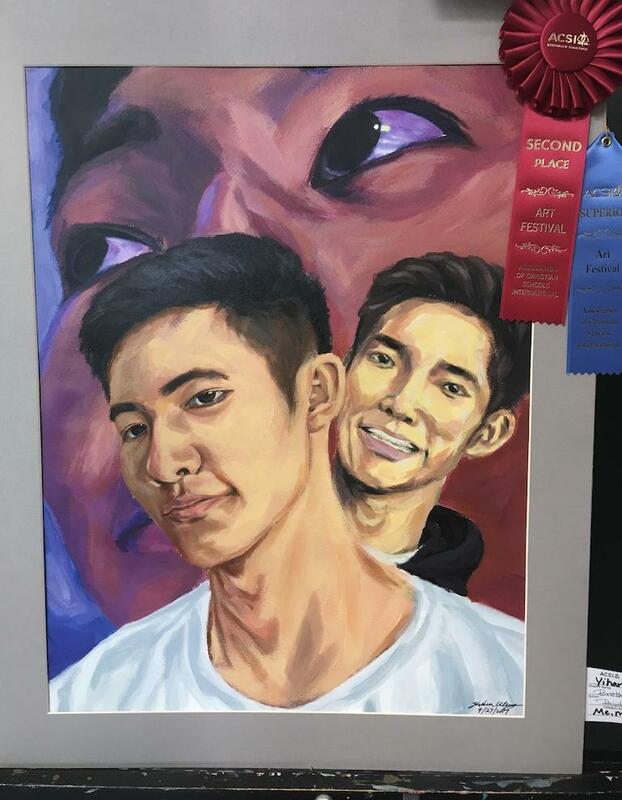 Yihan Wang placed 2nd in 12th grade division with his self-portraits acrylic painting, "Me, Myself and I"
Nina Nguyen placed second in 11th grade with her oil pastel floral drawing "Summer"
Bethany Diment's acylic pour painting "The Journey to the Cemetary" inspired by the Phantom of the Opera placed 3rd in 8th grade division. I am pleased to report a new $700,000 donation! This raises our one-year total fundraising to $1.3 Million. Let us praise God, and thank our generous donors, for this miraculous provision. This is an anonymous, unrestricted gift to go where it is most needed. We will prudently use these funds to further strengthen our teaching, programming and services. This will go a long way to build excellence in our A5 = Academics, Athletics, Arts, Activities & AMSE (Applied Math Science & Engineering). Our board of Trustees and I are committed to stewarding these funds wisely to achieve maximum results for your children. This new infusion of funds will go a long way to implement these programs and others. Please join the board, our staff and me in rejoicing over the continual blessings the Lord Jesus is bestowing upon our beloved Brethren Christian. I am humbled and honored to serve all of you in this great school ministry. Keep on rejoicing in the Lord at all times. I will say it again: Keep on rejoicing! Ms. Flippin has just begun a medical leave that will last for 4-6 weeks. She will have surgery, and is expected to have a full recovery. During her absence, please direct any academic requests to Mrs. Stone, Mrs. Martes or me. Please join me in praying for Ms. Flippin’s complete and rapid recovery. Our Open House was fantastic! Over 200 people attended, and there were many new families visiting for the first time. Many thanks to all of the volunteers, students, teachers and staff, who made this event a tremendous success. Congratulations to the winners of the half-off tuition drawing as well. 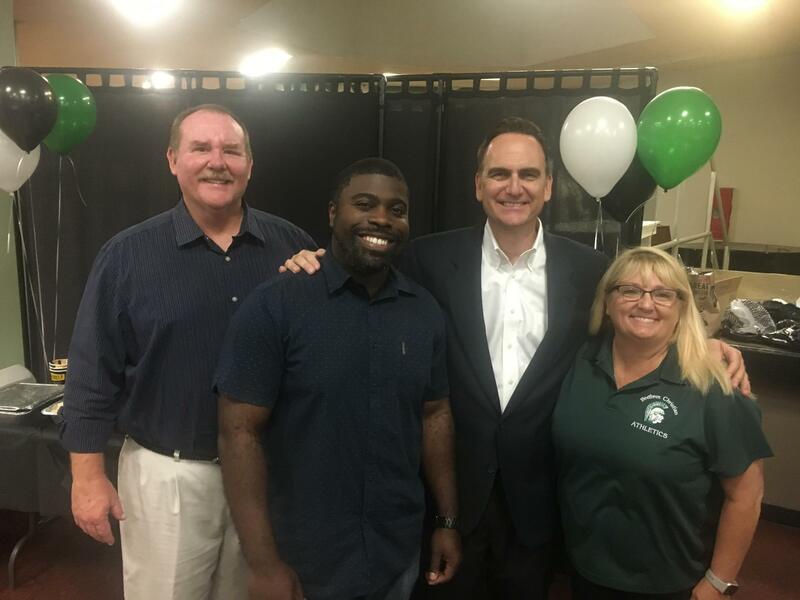 This was a great night to celebrate the great year we have had at BC, while forecasting the new initiatives for next year: Football, 1:1 Computers, Debate Team, Block Scheduling, new missions opportunities and much more. Their ribbons will be presented at our Award Ceremony later this month.